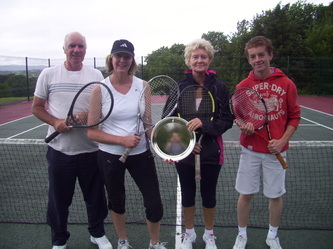 Welcome to the Friendliest Tennis Club in the Mournes! 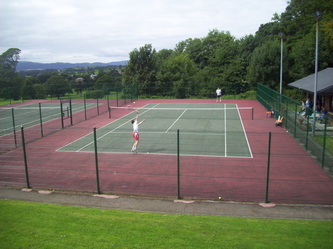 Rostrevor tennis club was founded in 1976. It now boasts over 60 members including a thriving junior section. 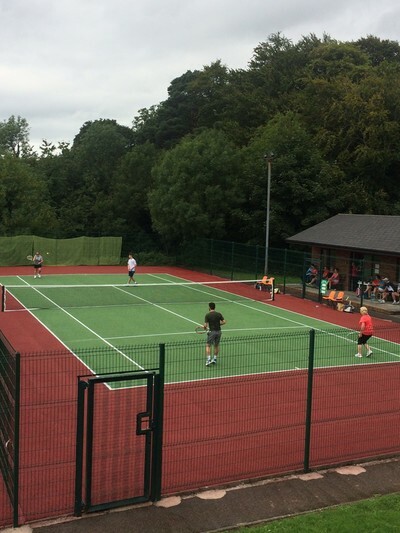 Coaching and social tennis takes place through the week as well as a Winter league, closed tournaments and a Mens, Womens and Mixed Doubles open tournament in July and a singles tournament in August. The committee and members are keen to welcome new members, young and old to this wonderful sport and if you have never played and you would like to know more then please contact us via the contacts page or directly message Chris, the Club chairperson on 07889374005. Welcome! 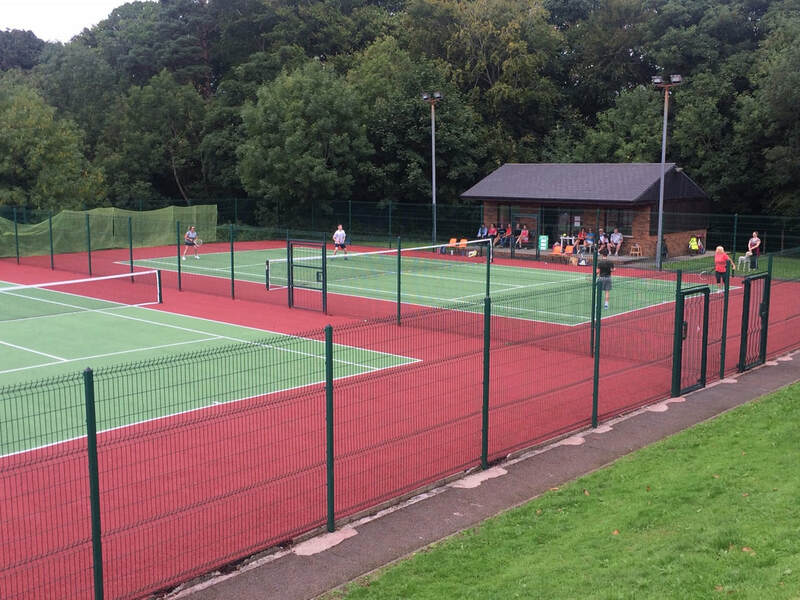 Evening mid-week coaching will be offered free to new members and social tennis will resume for everyone on Monday 6-9pm after the Open events. Family - £80 [limited to parents and up to three children]. Outside club hours, club members can use the courts if they are free but if members of the public have paid to use the courts they have precedence. During club hours, if members are not using the courts then members of the public may pay to use them but club members have precedence and the public will be re-imbursed by the Park office. For beginners coaching - children or adult, please contact Chris Gibbons, Club Chairperson, on 07889374005. Jim Pringle is the Club's long-standing coach and is an outstanding teacher. His classes are always very popular. He teaches children and teenagers who are intermediate and above. You can avail of his classes through the Club chairperson but you must be or become a member of the Club, so go to the membership link on the website and download the membership form. Midweek coaching is also available with different coaches. For any other details or if you have any questions please contact the Club Chairperson. 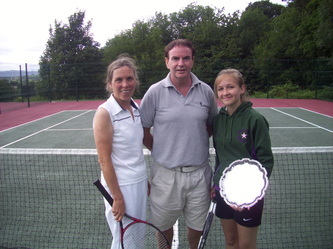 Jim's coaching times are suspended over the summer - from the end of May to late August. Jim Pringle runs day time summer camps for children through the council and thes can be booked directly with them. Saturday 9.30am-1.30pm on court used. During Jim's coaching slots he may use the second court if it is free but this will be given up to any members who want to play during those time. No coaching on Sundays, members time. At the times above when one court is in use the other is free to members. Final's Day Sunday 26th August. Sunday 26th August saw the final of the Men’s Singles tournament at Rostrevor tennis club. The main draw involves the, John McMahon Accountants sponsored, Singles and Plate event and the 3Rmobility sponsored Kilbroney Cup. This is the event for the players who make the quarter final but not the final of the main event. 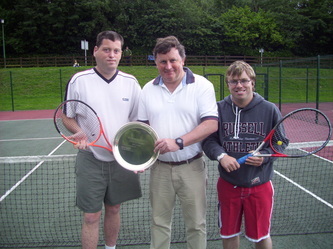 First up was the Plate match between brothers James and Brian O’Hare. James is a relatively new-comer to the game but he has strong potential in a powerful serve, pretty solid forehands and he likes to smash the ball at the net when he gets the chance. Brian is a good retriever and is renowned for putting more revolutions on the ball than Nadal. Now while that may be an exaggeration, the looping, dipping shots from his forehand are his signature shot and a shot one won’t face often. That makes it an advantage. He pushed one of the top seeds in an earlier round because it was such a distinctive and effective shot. This match was a tight affair, with long rallies and some great ball striking but also with some unforced errors from both players. Brian triumphed in the end 3:6, 6:4, 6:4. With a few drills on smashes and volleying Brian will find there will be even fewer players wanting to match up to him on the other side of the net! 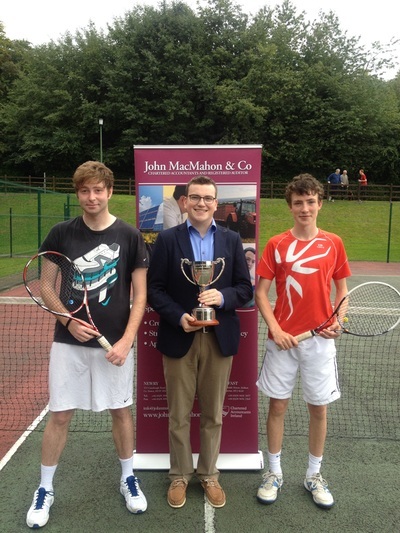 In the Kilbroney cup, Chris Gibbons faced Malachy McAteer. Neither had played each other before and in many ways this was a poor match-up for both of them – both lefthanders, both great defenders and retrievers and both fit. Both were also reluctant to pull the trigger when they could have. This all made for a (long) war of attrition. Chris took the first set 6:4, he broke Malachy at the start of the next set and he could have easily thought his opponent’s resolve was weakening but Malachy broke straight back. In fact neither player could hold serve in the first five games. The advantage to be left-handed in tennis is that most of your opponents are right-handed and a leftie serve usually spins into the weaker backhand of a right-handed player but into the usually stronger forehand if your opponent is left-handed. In the end Malachy held his serve and that was enough to take the second 6:3. 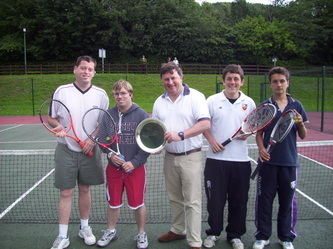 A champion’s tie break was chosen to complete the match to free up the court for the main final. It was the first to ten and at 8-5 Chris was only two points from winning. 8-5 became 8-6, 8-7, 8-8, 8-9 and on the cruellest of blows a smash from Malachy hit the net hard and dropped at the base of the net, on Chris’s side. Malachy won 10-8 in the third. He deserves credit however for changing his tactics in the second set and for being willing to come out of his comfort zone with some of his shots. Chris was better at smashing and had he backed himself he might have taken some of the chances he let slip by. 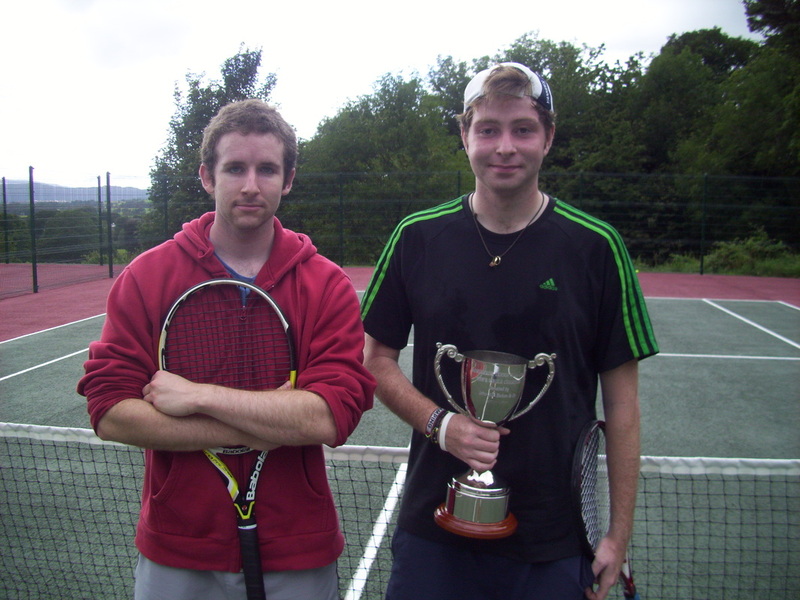 The main final saw defending champion, Arghal McMahon face Newry number one, Shane McAteer. Both had railroaded all in front of them to get to the final and both were hitting the ball with terrific pace from the outset. Arghal served first and a 40:15 lead was soon pegged back and Shane faced a breakpoint opportunity but he failed to convert. Arghal had one of his own against Shane in the next game and the point and game went his way. From a finely balanced match, Arghal was suddenly leading 3:0. With the score-line on his side he loosened a little and took the first set 6:1. Shane was too good to allow this to be repeated in the second set. He broke Arghal at the start of the second and held serve and soon he was leading 3:1 and with chances to make it 4:1. 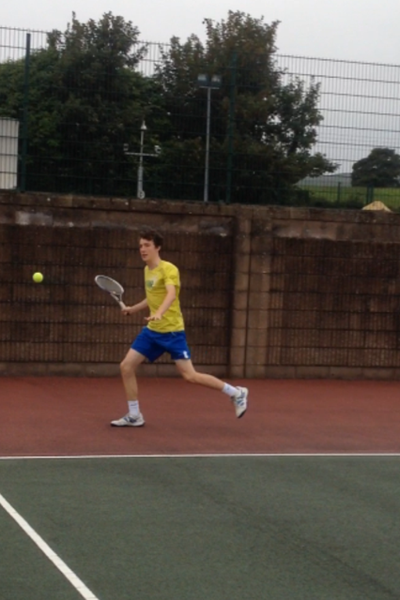 Both have great speed round the court and Shane was quick enough to run round on to his forehand most of the time. Arghal was defending as a result and he didn’t have the same confidence to let rip with his forehand but Arghal has a Federer like arsenal of shots to call upon, including a strong two-handed backhand, some fantastic volleying and feel round the net and a Sampras like second serve. If his forehand wasn’t to be relied on he could wave his wand and call on plan B, C or even D.
Shane failed to take his chances for a 4:1 lead. He was pegged back to 3:3. He was broken and Arghal held and, in a very tight final game, Arghal broke to avoid the pressure of having to serve it out 6:1, 6:3. A thoroughly entertaining match and all three matches drew quite a crowd from onlookers and park visitors and provided a fitting end to Rostrevor’s four open tournaments. 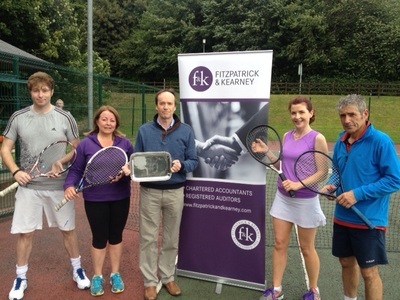 The Fitzpatrick and Kearney sponsored Doubles tournament drew to a close in Rostrevor on Sunday 19th August. 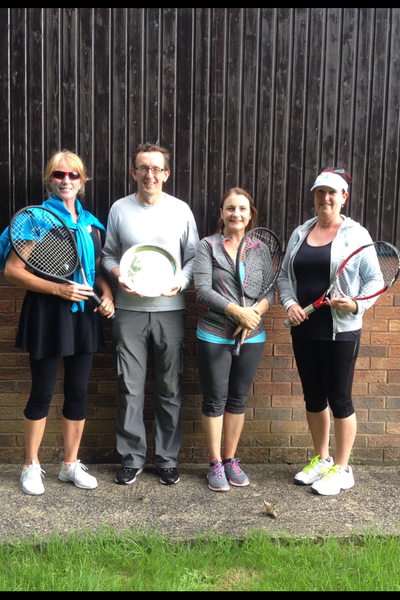 In the Ladies Doubles Plate final, Derval Campbell and Mollie Grant took on Phil Clark and Ellie Murdock. There was some excellent ball-striking from both sides of the net and the difference that separated the two was the error count and for Ellie and Phil this was too high. The scoring system in tennis means one needs only four points to win a game and they can come by winners or by errors and if your error count is too high you leak games. Indeed many good club players rarely hit winners they just avoid gifting points as errors. Derval and Mollie’s consistency saw them clear winners 6:0 6:3. 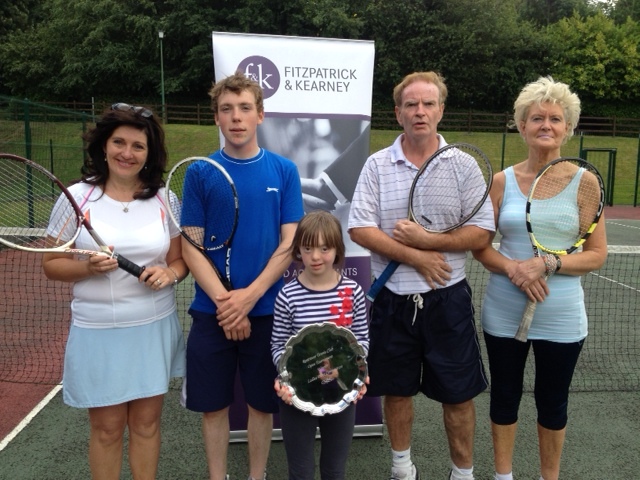 In the Mixed Plate final Kieran Campbell and Mary McGeown faced Derek Laverty and Alison Dunne. All are veterans and all are very competitive. 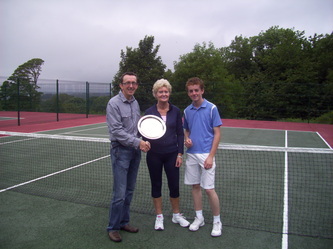 Such competitors normally find themselves in main event finals but Rostrevor often attracts a strong field and an epic match earlier in the tournament saw Derek and Alison knocked out in a ‘Thriller in Manila’ tie-break to, Mother and son, Brigid and Arghal McMahon - 18:16 in the third set tie break. As in the Ladies Plate, the match was more about keeping the ball in court rather than going for winners. Mary has an old school flat forehand and slice and this can knife through the court but there is much less room for error as it sails closer to the top of the net. The pace of Mary’s shots often brings winners and Kieran is a great volleyer. However, their opponents are great retrievers and they kept returning what was thrown at them. Derek and Alison hit much more top spin. This gives lots of net clearance and reduces the error count. They took the first set 6:2. Alison was broken in the second and Mary and Kieran led 4:1. They had game points to take it to 5:2 but failed to capitalise and 4:1 became 4:4. The set continued on serve until Mary was broken and Derek and Alison triumphed 6:2, 7:5. Alison played her part when under pressure but Derek is the strategist and his motto is keep rolling it deep and keep retrieving – making your opponent play one more shot. The strategy saw the two claim yet more silverware! 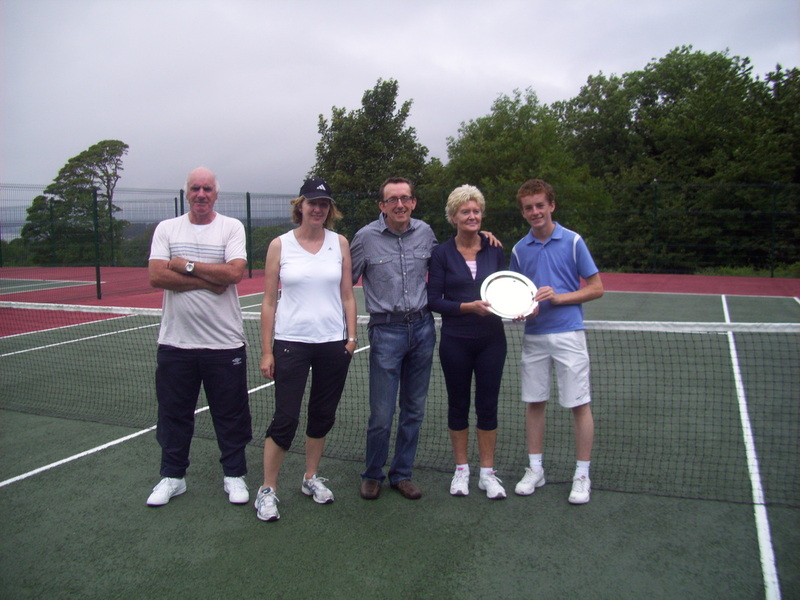 In the Main event Mixed final Ben Laverty and Margaret O’Hare faced Shane McAteer and Deidre Dinsmore. Ben and Shane are top Ulster players. Margaret loves to volley at the net and Deirdre will take every opportunity to volley even taking the ball before it bounces from near the baseline. This is the first time both teams had played one another and the first set was all about getting the measure of the other. Shane hits a great forehand and his onehanded backhand is much improved and isn’t far behind the forehand in pace and his speed round the court is breath-taking. Only one break of serve and a steady head was needed and Shane and Deidre took the first 6:3. Margaret and Ben stepped up a gear in the second. 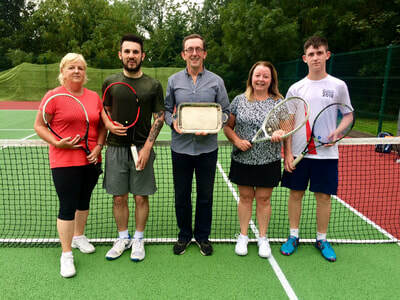 They were more competitive and, frankly, more ruthless with Ben hitting hard volleys directly at Deidre in the service box. They took the second set comfortably without needing to do this and Ben was to lose out on a volleying dual in the third set against Deidre. Perhaps she drew on what had happened earlier! The third set was a tight affair. 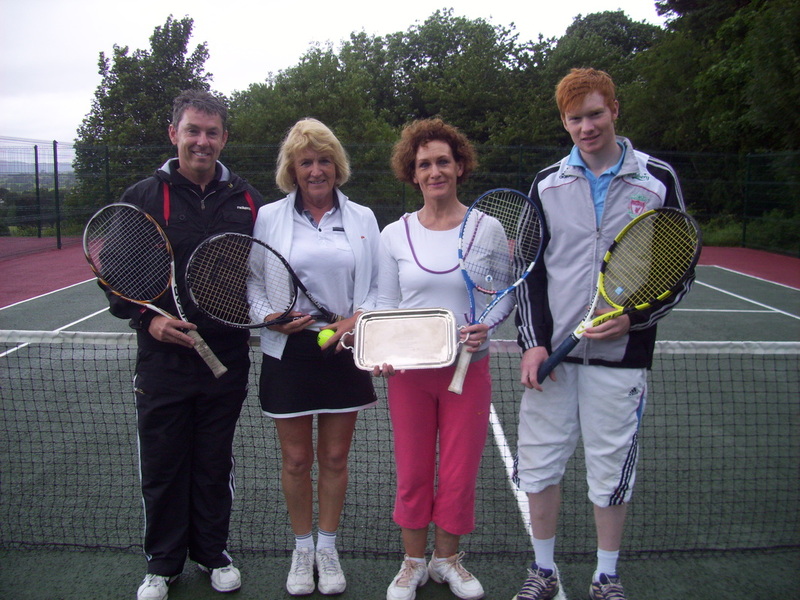 Shane and Deidre earned a break and they had the opportunity to serve out the match at 5:4 but they were broken. At 6:6 all players chose to continue the set rather than decide it by tie-break. 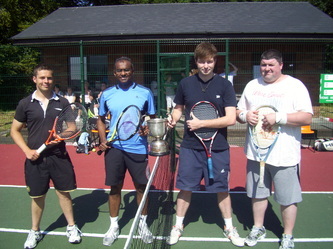 All four players played awesome tennis under the pressure that the last ten games demanded of them. Yes – ten games – the match was finally decided at 10:8 in the third and each of those games from 5:4 was a potential match deciding game. 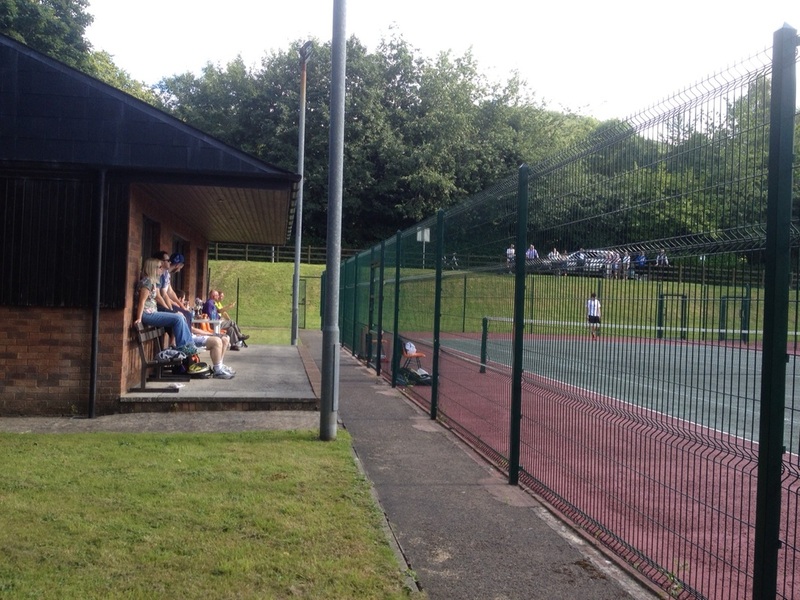 The audience, from family, friends, other tennis players and the growing followers stopping to watch in the park, were all impressed by the quality of the tennis on offer. All desperately wanted it but only one team could win and that was Shane and Deidre, breaking Margaret and serving out the match. For many watching this was the best match they had ever seen. 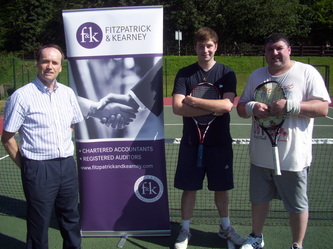 The Fitzpatrick and Kearney Sponsored Rostrevor doubles finalists. The men’s plate doubles match saw James O’Hare and Neil McMahon face the two Malachys in father and son McAteer. The first set was very tight and there were some terrific rallies. All four players hit some hard serves and forehands but all four had been broken. Finally the McAteers held on to serve and broke their opponents to take the set 6:4. After this they kept the error count down and forced their opponents to find winners to get passed them. James and Neil are relatively new to the game and they offered the audience some excellent shots but they also went for several low percentage shots at the wrong time. The McAteers won 6:4 6:0. 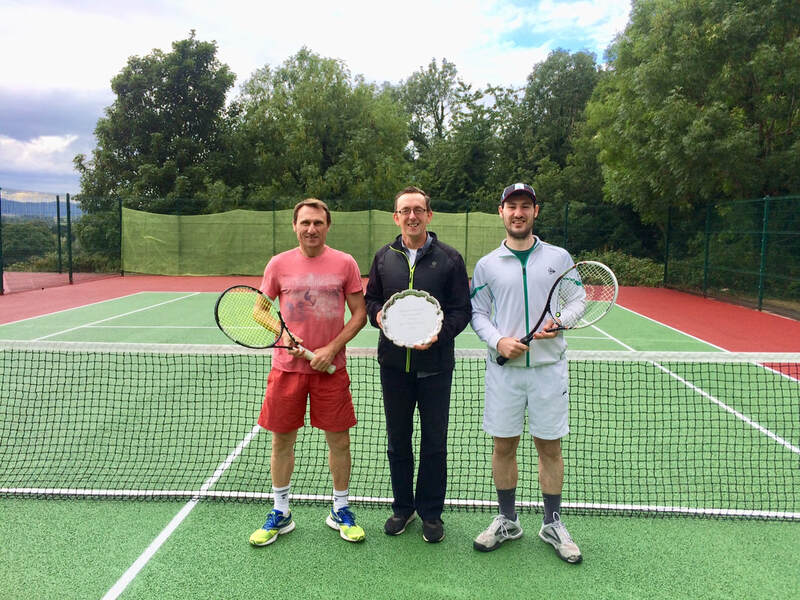 Shane McAteer and partner and tennis veteran Derek Laverty faced Tom Harte and Rory McGeown. Tom and Rory are fabulous ball strikers and they are confidence players – once they build a lead they swing easy and win points quickly. Shane was broken in the first game but they broke back immediately and Derek held serve to lead 2:1. The ball striking on both sides was impressive and it made for great viewing. Shane and Derek broke again but were in turn broken. 4:2 became 4:3. They broke a third time and held on to this break to take the set 6:3. Tom and Rory had a very difficult opening game in set two but they managed to hold. They earned a break of their own and at 4:1 a third set looked on the cards but Shane and Derek held serve, Rory was broken and they held to take it to 4:4 and then they held to lead 5:4. This became 6:5 with Tom and Rory now having to serve to stay in the match. This they did but the story of the tie break was the story of the match – the error count was a little higher from Tom and Rory and Derek secured match point with a brilliant drop volley – 6:4, 7:6. Technically Tom and Rory were superior servers and ball strikers but they needed to mix up their shots more. They didn’t win a single free shot on their serves. This reflects the brilliant returning of their opponents but also a need for a greater variation in type of serve. They hit textbook forehands but far too many were directed at Derek in the service box. Probably against most players it would be a winning formula but Derek is at his best in the service box and most of the time he is going to put volleys away and most of the time he did. Heavier top spin, landing it at his shoe laces, or angled shots so he has to stretch for his volleys, some slices under-spins or some lobes to take him out of the equation were all options that seemed to be missing in the red mist of wanting to stick to plan A. Shane was happy to return anything put to him and he showed a good tennis head in mixing up a lot of his shots. Derek and Shane are a formidable doubles partnership. They complement each other very well. It may have taken Derek 28 years of trying since he was last able to etch his name on this trophy [yes, we checked – 28 years!!] but it might only take him another twelve months before he gets to do it again. Saturday – the second semi-final took place between Giby and Gary against Derek and Shane. It was a terrific match and the intensity was there from the first ball. It was a windy, chilly evening and it had been raining all day – very different conditions from the heat-wave we’ve been used to this week. Derek and Shane adjusted quickest and they broke their opponents in a tough opening game, but they were broken in turn. Another break and a tough hold on Derek’s serve saw them clinch the opening set 6:1. Derek and Shane had several break points on Giby’s serve and on Gary’s after this but they were unable to capitalise and one always knew that Giby and Gary would get their chances. They broke Derek and held and took the second set 6:3. 70% of the games could easily have gone either way – it was such a tight affair. The odd error was going to prove costly and unfortunately more of these came from Giby and Gary. However, the match was overall of a very high standard and fabulous to watch. Derek’s net play and Shane’s scrambling ability and ability to do serious damage on any ball left short meant their opponents often found themselves in a defensive position. Derek and Shane secured the final set with the rally of the match on match point. All four showed terrific speed of hand and Shane hit a thunderous forehand down the line to take it 6:1. Many matches give score-lines that don’t reflect how close it really was and this was one of them. 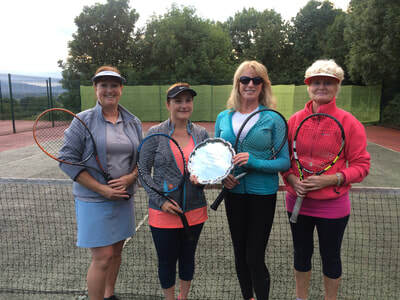 Wednesday 25th July saw a fine Ladies Doubles match with Molly Grant and Derval Campbell taking on the strong pairing in Deidre Dinsmore and Breege Crawford. 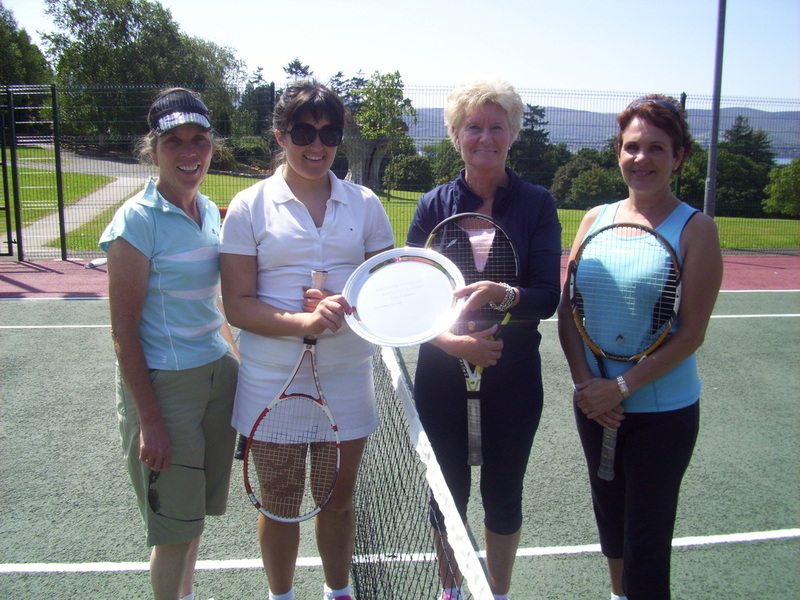 Deidre and Breege made very few errors in the opening set. Breege has a great ability to get her racket on most balls and can often turn a defensive shot into one that can force an error in her opponents. Deidre hits old school slide and loves to take the ball on the full, before it bounces, to take time away from her opponents. Derval and Molly were solid. Molly hits a great forehand and Derval, when she is in her rhythm, is not far behind. With sharper volleys and less errors we could have seen a different result. 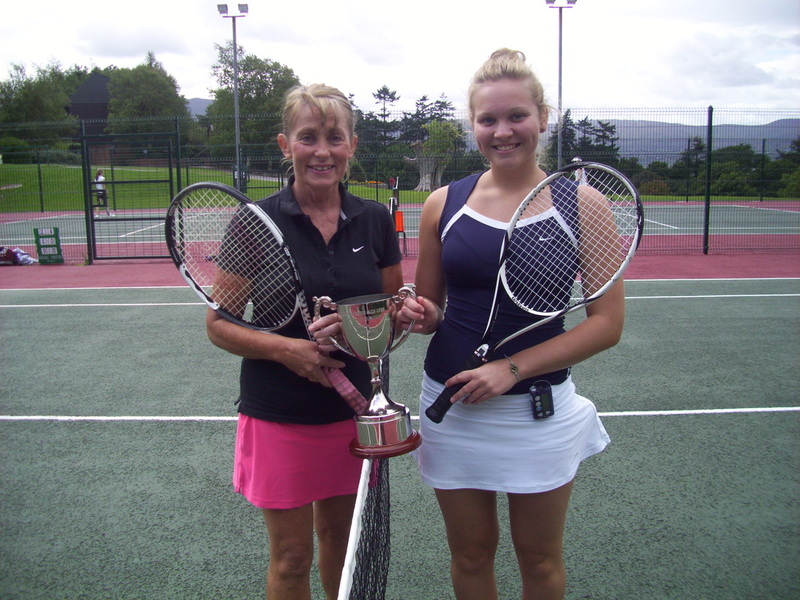 Breege and Deidre won 6:3 6:2. 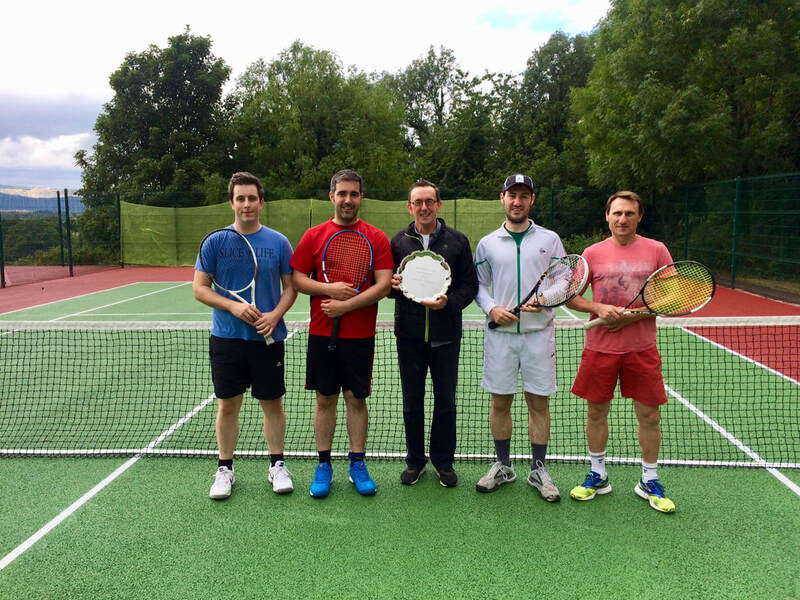 The McAteer family were on court too – Shane and Derek Laverty took on father and son McAteer senior and Malachy. There were some fine rallies and pacey serves and Derek was, as ever, the tactician in his deft volleys, smashes and placement serves. Shane and Derek won comfortably according to the score-line but less comfortably if you watched the match. The earlier match of the tournament has been replaced by a thrilling one between Kieran and Tim against brothers Arghal and Patrick McMahon. Arghal has improved or at least is sharper in all departments of his game now that he plays for his university regularly. Kieran, after the match, said it was like they were playing against three opponents on the other side of the net! It was a tight affair and Tim and Kieran were clearly targeting Patrick but this forced him to soon get his eye in and he was able to get most shots back. Patrick and Arghal are phenomenally quick round the court and they returned what seemed to be clear winners time and time again. Kieran is great once he gets to the service box but he needs more pace on his serve to turn it into a weapon rather than a rally starter! Tim hasn’t lost any of the pace or accuracy on his shots despite a lack of match practice. The first set was close with the McMahon’s taking it 6:4. They trailed 4:1 in the second set but game by game they brought this back to 4:4. Arghal was serving 4:5, needing to hold serve to stay in the set. 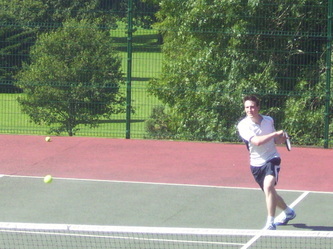 A double fault and a loose shot suddenly saw two set points to Tim and Kieran. Arghal, not unlike Anderson at Wimbledon against Federer earlier this month, took the racket out of his opponents’ hands with booming serves. They scrambled a hold and soon Patrick was faced having to serve to stay in the set. This game and the earlier one were key missed chances for Tim and Kieran. ​The tie-break was thrilling and close, a 3 love lead to the Newry team was brought to 3:3 and eventually secured by the McMahons 7:5. This was a great match not just because of the quality of the tennis on display but because of the respect on lines calls shown across the net and to the acknowledgement shown when anyone hit a winner. For me, from the side-line, the only thing missing was a third set! We’ve already seen some fine tennis on display. The first match saw veterans Tommy McKeown and Michael McKnight take on two keen juniors in Harry McMahon and Rhys James. The veterans used their experience to find their spots on the court but Harry and Rhys on several occasions came on top of several strong rallies. They showed talent, a competitive spirit and real potential – well done! 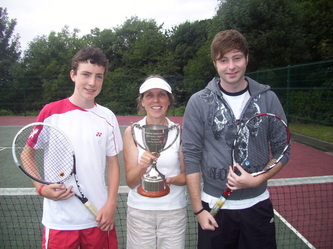 Tommy and Michael were always going to find it a challenge against our top seeds, Tom Harty and Rory McGeown. 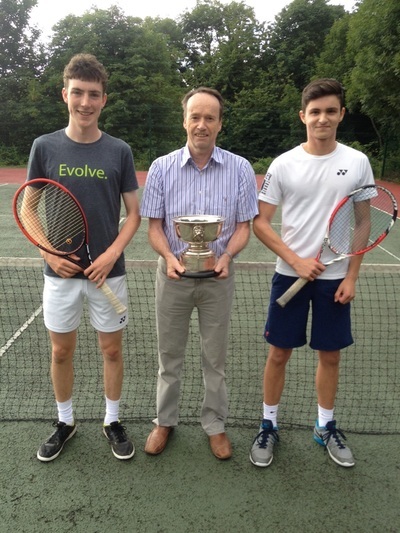 Tom and Rory are among the best players in the area and the combination of thunderous serves, heavy top spin forehands and some deft touches at the net (and that they played like it was the final!) meant there was only going to be one result. However, Tommy and Michael pulled off some great shots too especially when their time was taken away from them and they could easily have secured two or three games in each set – the tennis score line can sometimes be very misleading! Arghal and Patrick McMahon saw off Gary Smith and Brian O’Hare but not without some solid serves and ground shots from their opponents and Gary and Brian could easily have secured even a few more games. 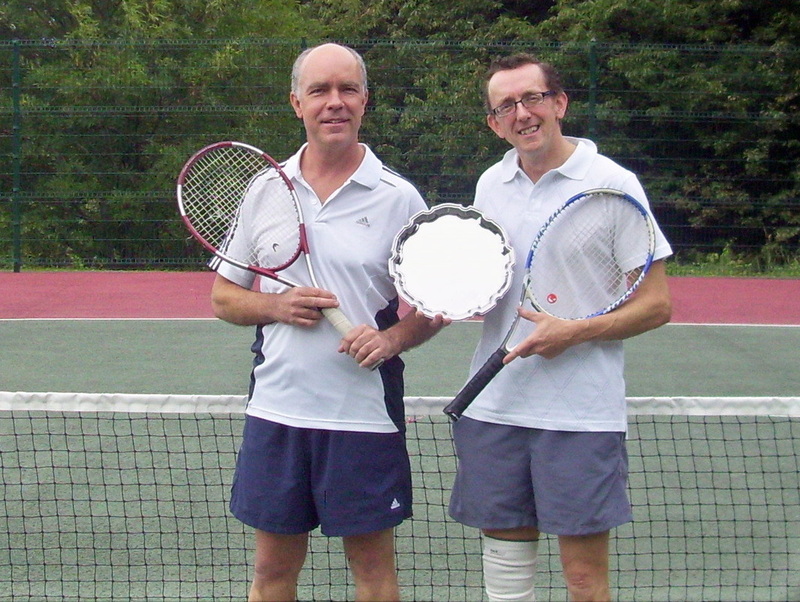 Arghal and Patrick play Kieran and Tim on Wednesday at 6.30 in what promises to be one of two great matches that night. 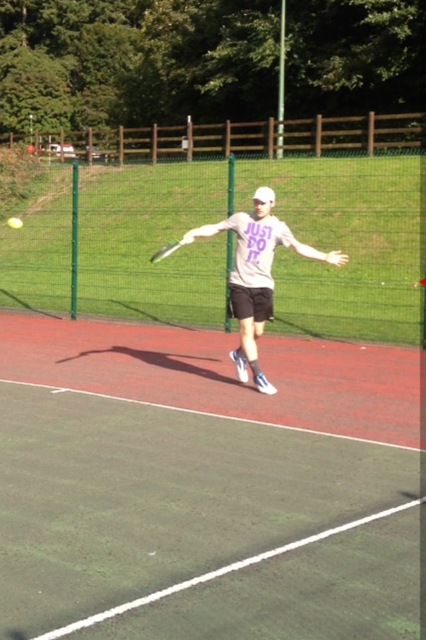 We tried out the serving speed gun on Sunday and Eoghan McMahon clocked a serve at 95mph and Arghal at 110mph!! The match of the tournament so far was a thrilling three setter between Gary Hanratty and Eugene McNulty against James O’Hare and Neil McMahon. Gary and Eugene breezed through the first set but as so often happens a comfortable first set can make the second that much more difficult to secure and James and Neil took it 6:4. They were getting used to the court surface and finding a winning formula. James loves to volley and he was charging the net at every opportunity and they had a break leading 4:3 in the final set, serving to take it to 5:3. This was the turning point of the match and all four players were in the zone, pulling off terrific volleys or finding the angles on their ground shots. Gene hits it hard and low and when angled it can be very difficult to get a racket on some of his shots. Gary is good on both wings too but their opponents were great retrievers and had some great serves, volleys and smashes to call on. 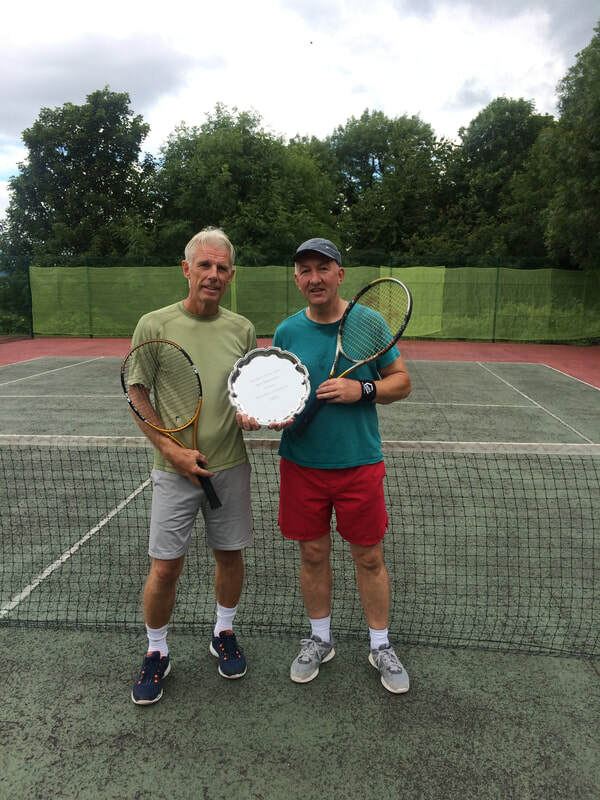 There were game points and break points in this game and the next but Gene and Gary triumphed in the first of our ‘rumble in the jungle’ matches. Ellie and Phil took on Anne Greer and her partner Catherine. Ellie and Phil on paper were the favourites but Ellie is only recently back playing. Anne is one of the most improved players in Rostrevor and she brought her secret weapon in Catherine, in particular – Catherine’s serve. They won comfortably and that serve will give their next opponents something to think about! 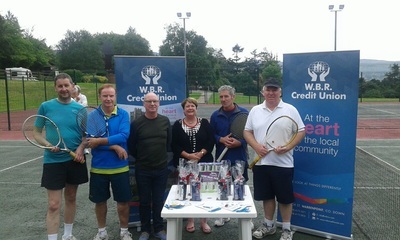 As the courts in Rostrevor are due to be repaired Warrenpoint Tennis Club have kindly allowed us to run our single competition out of their courts. The Tournament referee is Chris Gibbons and if you have any queries or can't make a match please call or text him on 07889374005. Please arrive ten minutes early for your match to allow the possiblity of starting your warm-up early. Each player can make one request only to change the date of one of their matches [except for the times of the finals - these will take place on Sunday afternoon]. If a player is delayed in starting their match by more than twenty minutes the match will be forfeited and their opponent will take a walk-over into the next round. If you would like a referee for your match contact Chris. 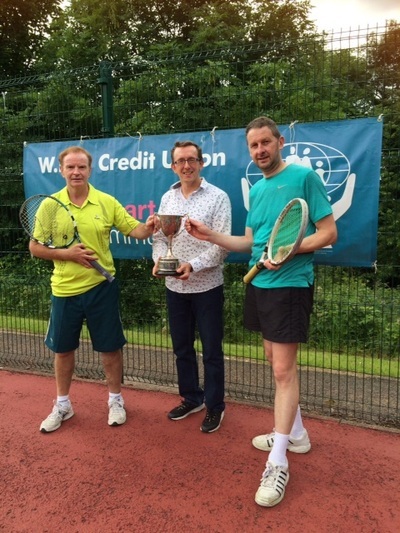 In the Warrenpoint Credit Union sponsored Plate final Patrick O’Kane faced Malachy McAteer. 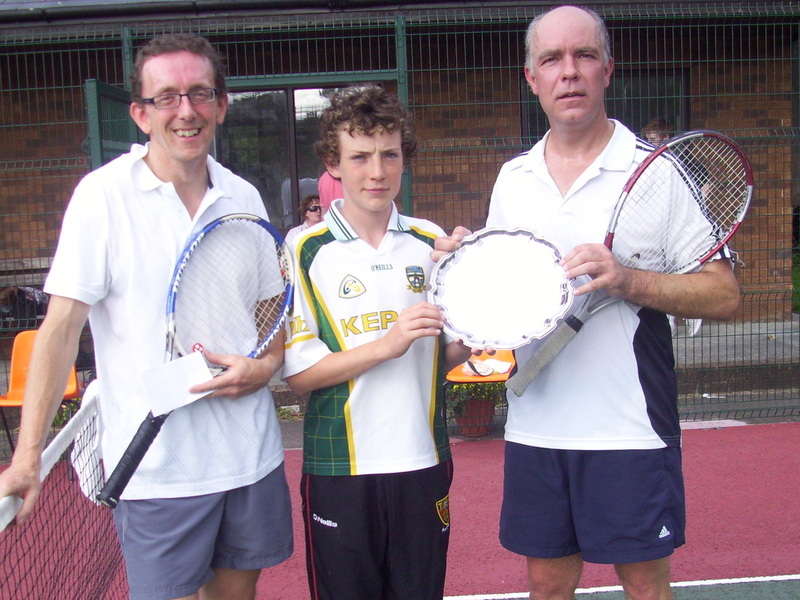 These players brought two very contrasting styles – Malachy is self-taught but he is fit and competitive and his forehand is strong. Patrick is known for having one of the best techniques around thanks to regular coaching in his earlier days with Rostrevor tennis club. Both were striking the ball well but Malachy’s competitive edge saw him take the first set 6:3. Patrick frequently loses the first set but wins the second, perhaps preferring the place of the underdog. In the second he relaxed and let his technique do the talking and he took the set 6:1. The third set saw the best tennis. Patrick took a break and had the opportunity to serve out the match but was broken. The final set went to a tie break and after taking a 4:1 lead Patrick double faulted twice and was pegged back by Malachy. 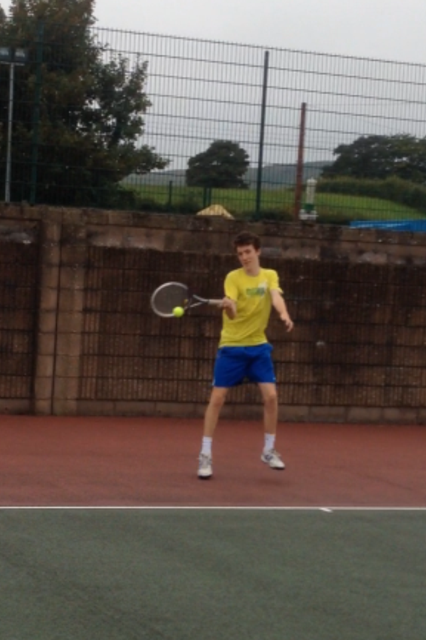 A strong cross-court forehand on his first match point secured victory for Malachy by the closest of margins. In the 3Rmobility sponsored Kilbroney Cup, Eamon Crawford played Chris Gibbons. Eamon started out strong and he took the first set comfortably 6:1. Chris mounted a come-back in the second, breaking Eamon in the first game and he maintained the break using a mix of shots and making good use of the drop shot. He took the second 6:4. The third set was tighter than the score line would indicate and there were a series of close calls that could easily have swung the match in either direction. Eamon was more aggressive throughout and because of that he finally triumphed and deserved to. The John McMahon Accountants sponsored singles final saw defending champion, Giby Vettiantel, face past winner Arghal McMahon. Arghal is the number one player in the area and he has all the shots. His height and increased strength and movement round the court and the range of shots he has make him a formidable opponent. Giby defended well but he was unable to hit winners from the baseline in the way Arghal could. Giby wanted to attack from the service box but the wet conditions did not help and he wasn’t able to get to the net in time to utilise his strengths. He lost the first 6:3. Being a set ahead, Arghal swung more freely and played more aggressively. He won 6:3 6:0. On Thursday Giby and Rory faced up to each other in the first main event semi-final. This was their first meeting and Rory was quickest out of the blocks. His signature shot is his booming top-spin forehand and he has a heavy top-spin serve. Both weapons were earning lots of points and Giby was struggling to find answers. Giby is strongest once he can get into the service box but he was been passed time after time when he tried in the first set. Rory took this 6:2. Giby, ever the strategist, broke Rory in the first game of the second set. He was doing some excellent retrieving and this kept asking his opponent one more question. Rory needed to be patient and trust the swing that had got him so comfortably in front. He became a little defensive. This gave Giby that extra second of time to utilise his volleys and smash shots. Giby at 5:2 faced a resurgent Rory and was broken. Rory held and at 5:4 Rory was a point away from taking Giby to deuce. If he had been able to find an opening here there could have been a momentum swing. Rory is not as familiar with these match pressures as Giby and Giby took the second 6:4 and the third 6:3. Both put on a fabulous display of top class tennis. Aidan Moran is a sports psychologist at Trinity and he has found that those that deal well with crunch moments in sport do so frequently by focusing their attention on the mechanics of their technique – think of what one or two things you focus when hitting a forehand in practise – and focus on these aspects when hitting a forehand during the pressure moments. You are not denying the pressure of the moment, you are finding a way of focusing your attention to help you deliver the shot. On Friday the second semi saw Rostrevor’s Arghal McMahon and Newry’s Shane McAteer lock horns. Shane is unbeaten in 2017. This year Arghal is injury free and he is captain of his university tennis club. Arghal also has gone through spells ranked in the top five or six in Ulster. Arghal played aggressively from the start. From the side-line one could easily have thought he was losing from the error count but this was outweighed by his winners. Shane has never played anyone who can hit the ball so hard from both wings as well as the range of slice shots, touch shots, drive volleys – the list goes on! Shane showed phenomenal fitness and he is a terrific self-taught tennis player but if he wants to take his game to the next level he needs to develop more variation on his serve, to improve the backhand and to develop his volleys. All perfectly possible but when your skill set beats everyone but one player the temptation may well lead to no meaningful change. Arghal won 6:2 6:3. In the Plate semi between Liam Lynch and Malachy McAteer, the first set was a tight affair. Liam has one shot – a spinny forehand and he hits the ball very late. This maximises the time he has which is useful when the ball is coming to you hard but it is not a style of play that ever produces winners. Most of Liam’s points come from his opponents’ errors. Liam is dangerous with his volleys and he loves to get to the net. Malachy battled against this style and took the first set 6:4 and he seemed home and dry at 5:1 in the second but Liam’s strategy began to pay dividends i.e. to keep asking one more shot from your opponent, especially when faced with closing the match out. 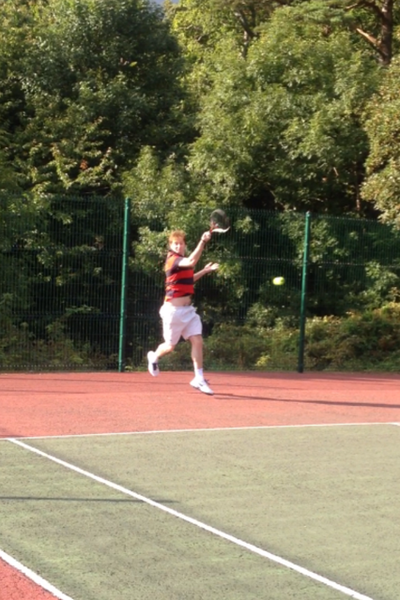 5:1 became 5:6 but Malachy finally held serve and he broke through to win 6:4 7:6. 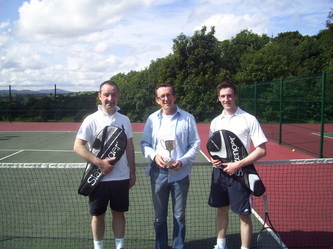 The final semi was between Eamonn Crawford and Michael Sands in the Kilbroney cup. It was a great match with solid ground shots from both. They are of a similar ‘vintage’ and fitness and both are good players. It was a case of who would blink first and it was Michael courtesy of a couple of errors. The first set went to Eamon 6:3. He also broke Michael early in the second but Michael was swinging more freely and he broke back. The second set saw the best standard of tennis. It was very entertaining to watch and there were some terrific exchanges. Michael had a set point at 5:4 but made an error in telegraphing an approach to the net. Eamon dropped the ball at his shoe strings and Michael couldn’t pick it up. 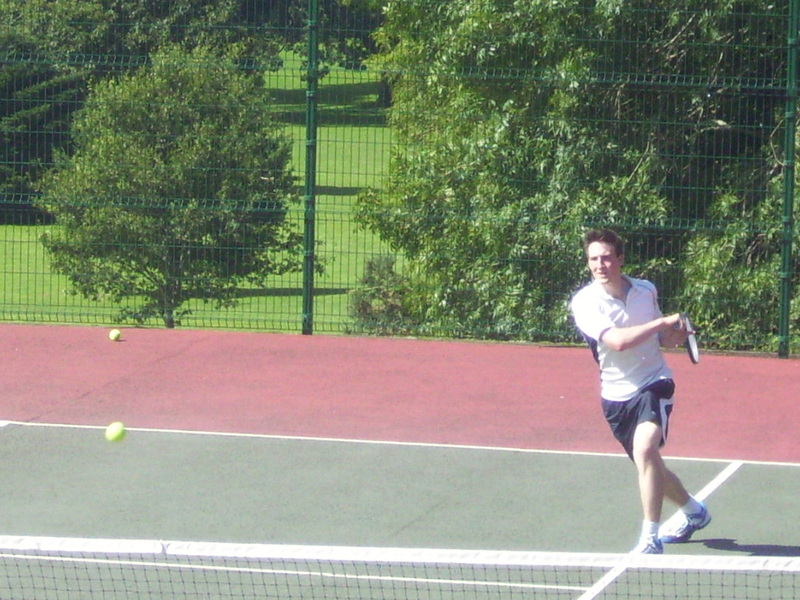 Michael earned more set point opportunities in the tie break but Eamon remained focused. 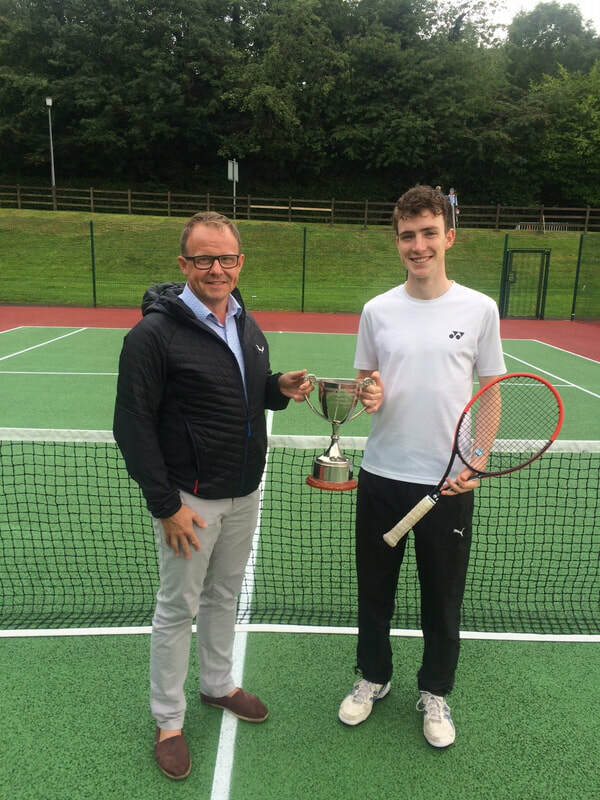 Natural justice would have seen a third set but Eamon is a tough competitor and he won the match and rightly deserves his spot in the final of the Kilbroney cup. The Rostrevor singles open has seen some terrific matches with impressive ball striking from all players in the opening matches. Patrick O’Kane is technically textbook in his serve, strong top-spin forehand and slice backhand. He is quick aound the court and good with the smashes. He is prone to make some unforced errors early in the tournament and after an early lead in the first set against Chris Gibbons, it was the occasional unforced error that cost him the set and as is often the case, mistakes can linger in the mind and this seemed to be the case as he was broken twice to trail 4:1 in the second. However, he rallied and trusted his game and a more attacking style saw him take the second set to a tie-break but this went the way of Chris in the end. Patrick went on to play Gary Hanratty. Gary was unfortunate to have a string on his match racket break just before he started his first match. The replacement was a very different racket and despite some terrific rallies he lost to Patrick McMahon. 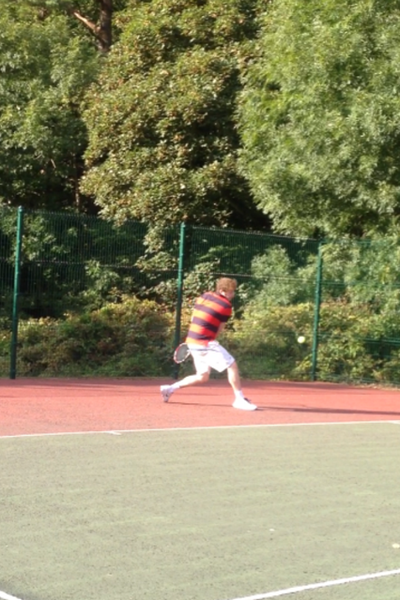 In his Plate match Gary played Patrick O’Kane and he put up a sterling performance. It was a three set match with both players hitting some great baseline forehands. Patrick eventually won out and he faces Eugene McNulty in the Plate semi-final at 6.40pm on Thursday 24th August. Eugene is a great player. He hits the ball hard and flat from the forehand side. He is known for going through purple patches of hitting opponents off the court. He is quick round the court and has a good serve – pacey and he can alter the direction. The backhand is the weaker side and when he makes an error he can beat himself in making more. His fitness and the quality of his play saw him take the number three seed, Shane McAteer, to a tie-break in their opening match. Shane rallied and took the tie break and then the second set. Eugene then played Shane’s father Malachy McAteer senior in the plate. 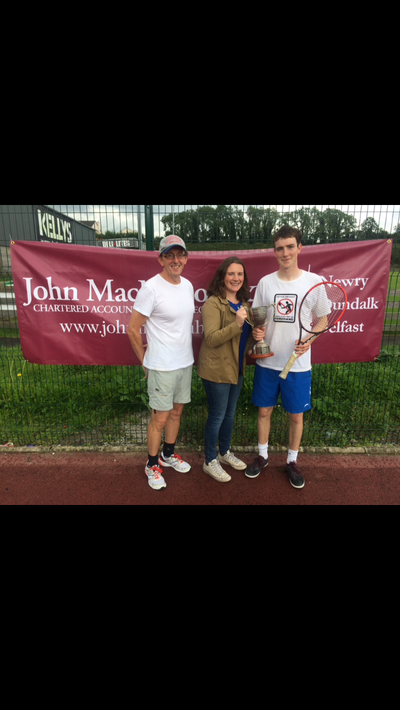 Malachy is more an Ironman in fitness and only an occasional tennis player but he can play and you will only beat him by hitting winners. In the Plate semi-final, Eugene might blow Patrick off the court with his forehand but Patrick will get chances and if he can be confident and trust his swing when attacking chances are offered he could take it too. 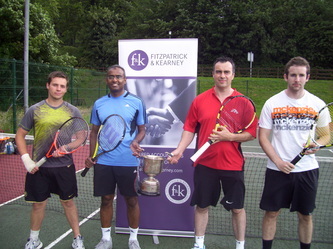 After beating Patrick, Chris faced defending champion Giby Vettiankel. Giby has been in the top two or three players in South Down for well over twenty years. He beat Arghal McMahon last year in the final here. One runs out of superlatives to describe the arsenal of shots Giby can play. Chris was never predicted to get close and losing the first set 6:2 was actually two more games than many in the field would get against Giby. However, that score line hides the fact that many of Giby’s service games were taken to deuce and Giby was eventually broken in the first game of the second set. A break is not a break until you’ve held your own serve and Chris did hold serve. 2:1 became, 3:1, 3:2, 4:2 and then another break - Chris was leading 5:2. One more game and the set would have led the already disbelieving onlookers dumbfounded! For the next three games Giby did not put a foot wrong. Chris also hit some loose shots but at 5:5 with Giby serving to take the lead for the first time in the set he was broken again and Chris had another opportunity to serve out the set but he was broken and Giby played better in the pressure of the tie-break and won 6:2 7:6. 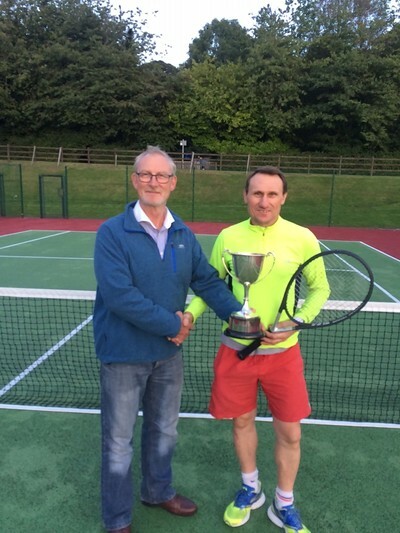 Chris now meets Patrick McMahon at 4.30pm Thursday in the Kilbroney Cup semi-final. They have played each other many times. Chris has the stronger record but Patrick beat Chris last year and Patrick is his most dangerous when coached by younger brother and number two seed, Arghal. This will be a close match. Chris tends to be more consistent but if Patrick can keep the error count down and if he continues to use those wonderfully safe top-spin forehands and rely on his fitness he could win. Newly qualified coach Rory McGeown is the one talked about least when Arghal, Giby and Shane are in the mix but he is getting stronger all the time and he swept passed Malachy McAteer in the first round and again against Patrick McMahon. His serve, forehand and backhand are textbook and few hit it harder than he does. He hasn’t yet tasted victory over the top three players but it is only a matter of time and this week their time might be up. He plays Giby Thursday at 6.40pm. Eamonn is a past winner of the Kilboney Cup and he played well against Malachy senior in the opening round. Malachy makes very few errors and often retrievers win matches on the back of the error count from their frustrated partners. 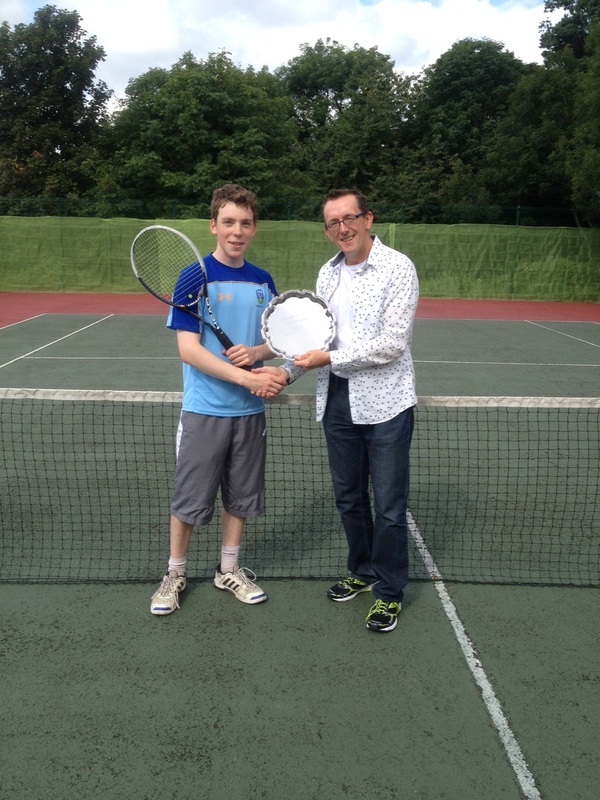 To Eamon’s credit he stuck to the game plan and played aggressive tennis throughout. In his second round match against Shane there were some great rallies but Shane hits the ball hard and he is quick around the court. Shane double bagelled Eamon but I think we will see a completely different level of play between Eamon and Michael Sands in the Kilbroney Cup semi-final on Friday at 5pm. Michael beat Liam in his first round but lost to Arghal in his second round. As with Eamon and Shane’s match, the score line in Michael’s match against Arghal does not reflect the quality of the ball striking from both sides. Michael and Eamon have not played each other before and this match has the hall marks of being a key one to watch, along, of course, with our two main semi-final matches on Thursday and Friday evening. 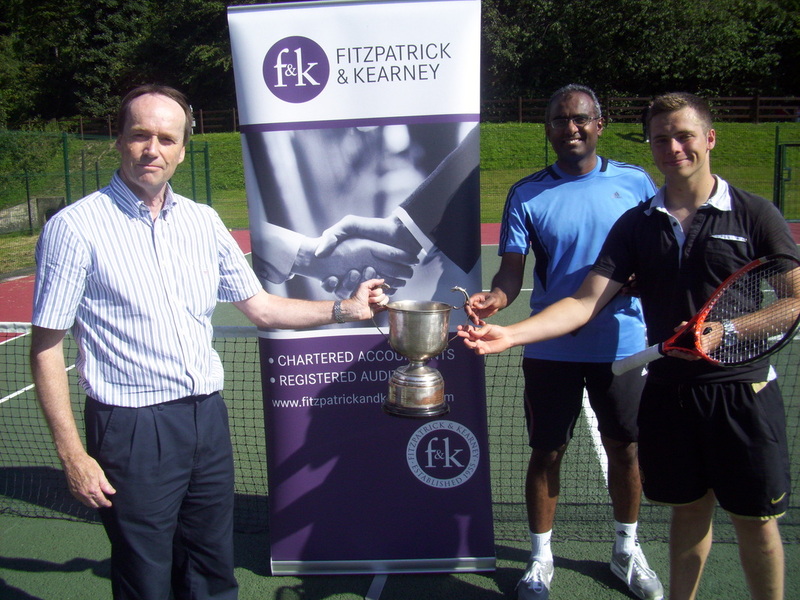 The 30th July saw the completion of the Fitzpatrick and Kearney sponsored Open Doubles tournaments at Rostrevor tennis club. 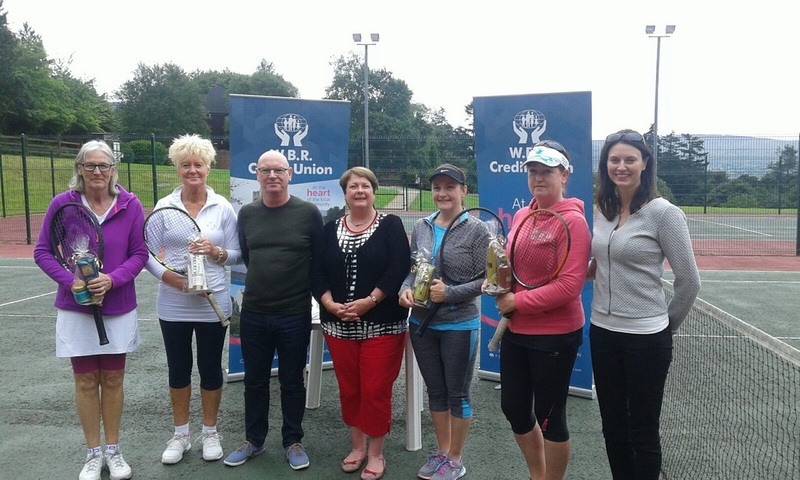 In the Ladies’ Doubles, the defending champions, Patricia White and Mary McGeown took on the mother and daughter combination of Derval and Eve Campbell. The first set was an epic battle with some great exchanges. All four ladies held their serve and a tie break ensued. The defending champions took an early break and with a steady nerve this was all they needed to secure the first set. The second set opened with some terrific shot-making and hard fought rallies and it was evenly poised at three games all. In the seventh game the Campbell’s faulted and, as so often is the case in tennis, a small lapse in concentration, a couple of errors and the momentum shifts. Mary and Patricia took the single break needed to win the second set and the match 7:6, 6:3. In the Men’s Doubles, past champions, Giby Vettiankel and Jamie Campbell, faced the new combination of Rory McKeown and Tom Harty. Tom had won last year with Arghal McMahon but this year partnered Rory. Giby and Jamie broke their opponents opening service game and led at 4:2 before Tom and Rory rallied with a mix of defensive and attacking play. They won the next three games to lead 5:4. Giby and Jamie are too experienced to buckle under the pressure and they held serve and soon we were into a tie break. All four players can take credit for powerful baseline rallies and exchanges at the net and only one mini-break separated the two. Rory and Tom took the first set. They sustained the momentum into the next set by breaking early. From then on they both grew in confidence and they won the match 7:6, 6:2. 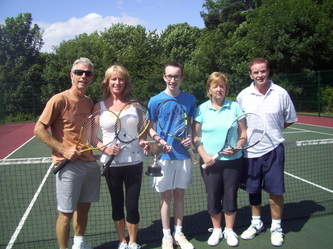 The mixed doubles saw Derek Laverty and Alison Dunne take on Tim Smith and Deidre Dinsmore. 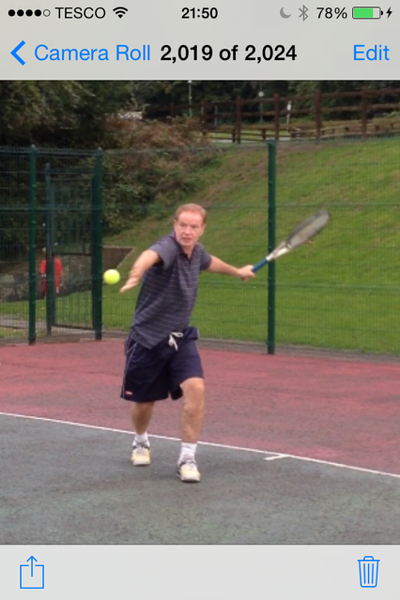 Derek is one of the elder statesmen in South Down tennis but he is still regarded as one of the best volleyers and tacticians of the game. Tim has all the shots. His signature shot is his booming forehand but not far behind is his two-handed slice backhand and some deft touch drop shots. Deidre loves to volley and will take any opportunity to hit the ball in the air, before it bounces, to take time away from her opponents. Alison has a pacey and solid forehand. 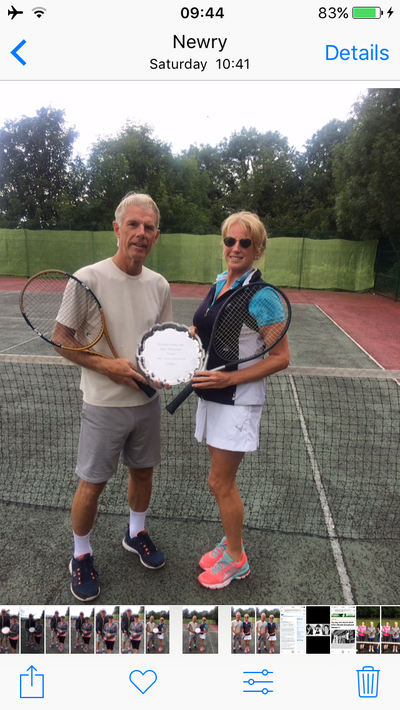 Tim and Deidre are a great combination – their strengths complement each other and while a lot of the games went to deuce they bagelled their opponents 6:0. Such a one-sided scoreline can easily become a curse - The momentum of those leading often drops and where the points difference is actually very small, as it was here, this drop in momentum may be all their opponents need to mount a challenge. Combine this with Derek’s tactical ability to read his opponents’ weaknesses and the onlookers were not surprised when the second set went to Derek and Alison 6:4. Tim and Deidre fought back and throughout the match, and especially in the latter part of the third set, there were some terrific rallies with shots from all parts of the court. From a 5:2 lead to Tim and Deidre their opponents were only a point away from restoring this to 5:5. At 5:4, with Tim serving for the match all four players hit clean winners on different points. Tim had four match points that each were defended but, finally, with one wayward forehand from their opponents they won 6:0, 4:6, 6:4. It was a terrific match and a fitting conclusion to the tournament and to the trophy that bears the name of our sponsors and which now marks the names of players from the last 30 years that the Club has been fortunate to be sponsored by Fitzpatrick and Kearney Accountants. 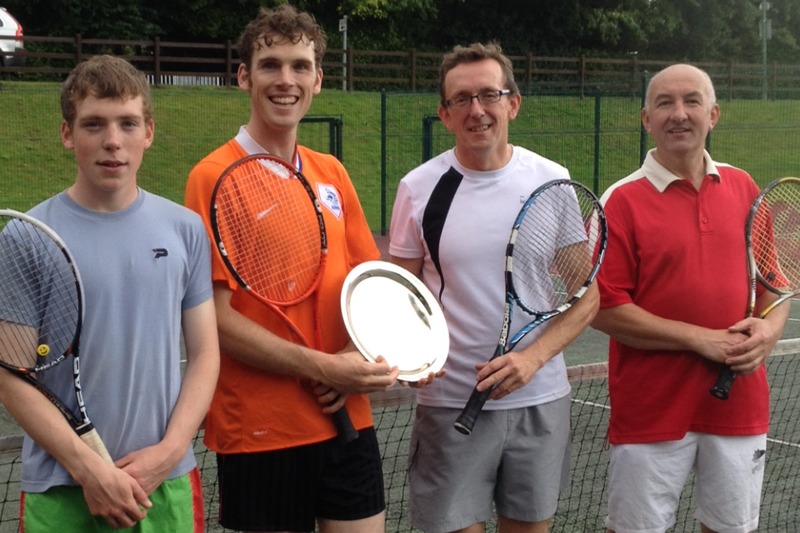 Men’s Doubles plate – Eugene McNulty and Liam Lynch took on Chris Gibbons and Patrick McMahon. The first set was a tight affair and both teams had opportunities to take the initiative but Liam and Eugene kept the error count down and took it 6:4. Chris and Patrick took a leaf out of their book and played with a greater margin of error and took the second 6:4. 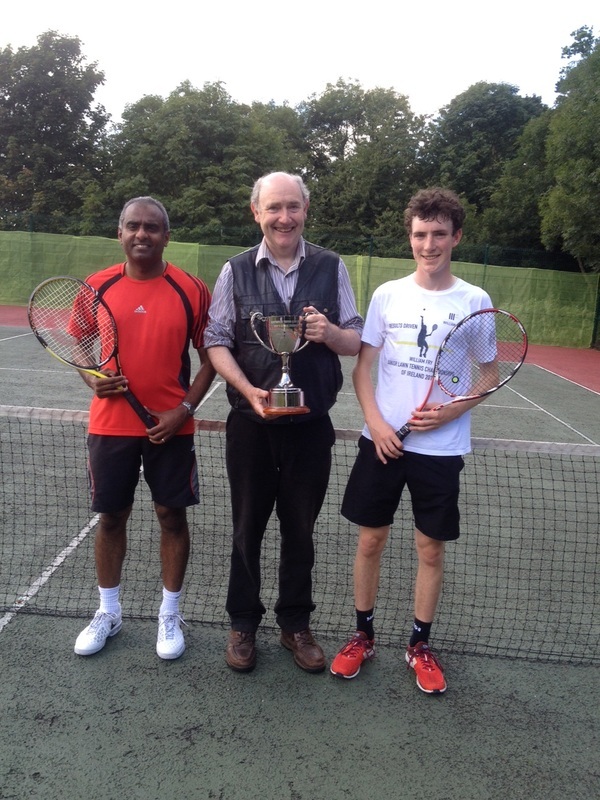 The third was similarly tight but Liam and Eugene won 6:4, 4:6, 6:3. Ladies plate – Ellie Murdock and Briege Crawford took on Dolores James and Anne Greer. The first set was closely fought and a tie break was required with the more experienced pair, Ellie and Briege, winning the tie break and then the match 7:6 6:2. 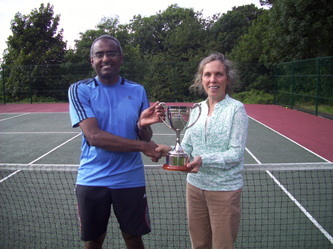 In the mixed final Ellie and Eugene faced Chris and Dolores. Ellie is very good at the net and Eugene hits the ball with real pace. Chris and Dolores are both good counter-punchers and will often ask just more one shot of their opponents and from that draw an error. The first set went to Eugene and Ellie 6:4 and leading 5:4 and with Eugene serving to take it to 5 apiece Eugene netted a cross court forehand on break point and the set went to Chris and Dolores and through injury it was decided to tie the match. Please pay your £5 entry fee at the start of the match. Please arrive 10-15 minutes before your match to warm up. If you would like your match to be umpired let Chris G know at the start. 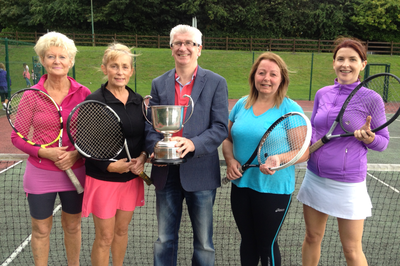 ​The Rostrevor Open Singles will take place 22nd-28th August. ​Thanks to our sponsors - McMahon and Son Accountants for the supporting the event. The price is £5 to enter, payable at the first match. The tournament referee is Chris Gibbons. Each player can make one request to change a match time, otherwise they must forfeit the match. If a player arrives more than 15 minutes late their opponent has the right to claim the match. The finals will take place on Sunday 29th August. There are three events in one here - the main event; the Plate event, for those who get knocked out in the first round and the Kilbroney Cup, for those who get knocked out in the second round. Enjoy some great tennis! Sunday 28th August saw the Singles Finals day at Rostrevor Tennis Club. First off was Eoghan McMahon against Rory McGeown. Rory’s signature shot is a thunderous forehand and a high-kicking top spin serve. 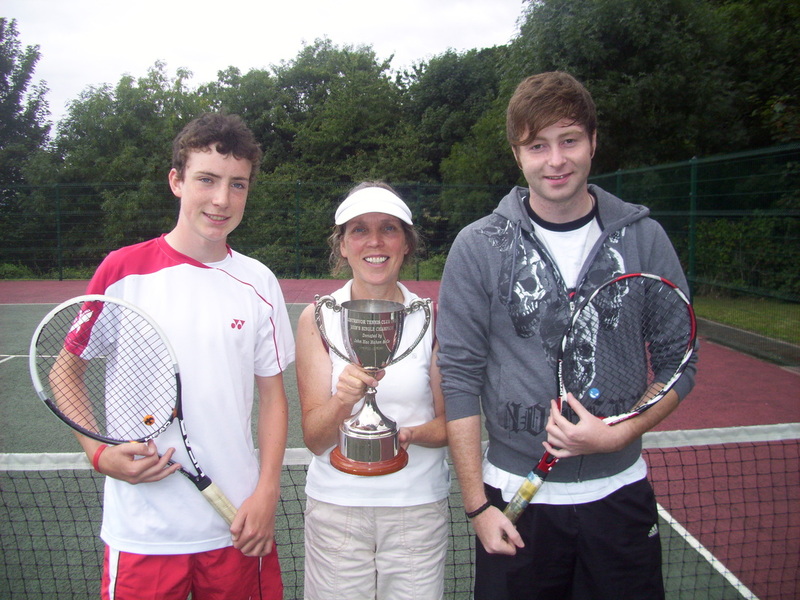 Both had served him well up to this point but Eoghan is a great returner and he was able to go toe to toe in forehands with Rory. The ball-striking was exceptional and the quality of the match was as good as one would see in most Main event finals rather than a Plate final. Eoghan took an early break and he showed his metal by not allowing Rory a single break point opportunity in the set. Eoghan served it out. Boris Becker said in his autobiography that he always tried to sustain the pressure whenever he won a set to try and establish an early break in the next. Eoghan did just this as he broke Rory at the start of the second set. Rory’s weakness is to press too hard when he wants to pressurise his opponents - he tries to hit the ball even harder. This is high risk because it reduces the margin for error and against someone who is able to retrieve as well as Eoghan it was never going to be the winning formula. 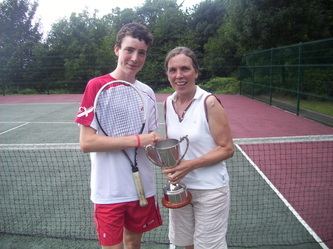 Eoghan won 6:4, 6:3. For those who get passed the first round but knocked out in the second round there is the 3RMobility sponsored Kilbroney Cup. 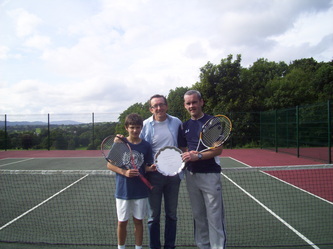 In the final this year was Eamon Crawford against Malachy McAteer. Malachy has never been coached but he is a natural sportsman and he has youth and fitness on his side. Eamon hits strong serves and forehands but age meant he was never going to be able to cover the court as well as his opponent. Malachy always had the upper hand. However, the scoring system in tennis means one is never far away from an opportunity to turn the match around and Eamon had half chances that could have added more pressure to Malachy but as quickly as those chances arrived they went through Malachy’s ability to get the ball back and ask one more shot of his opponent. Malachy secured victory 6:2, 6:3. 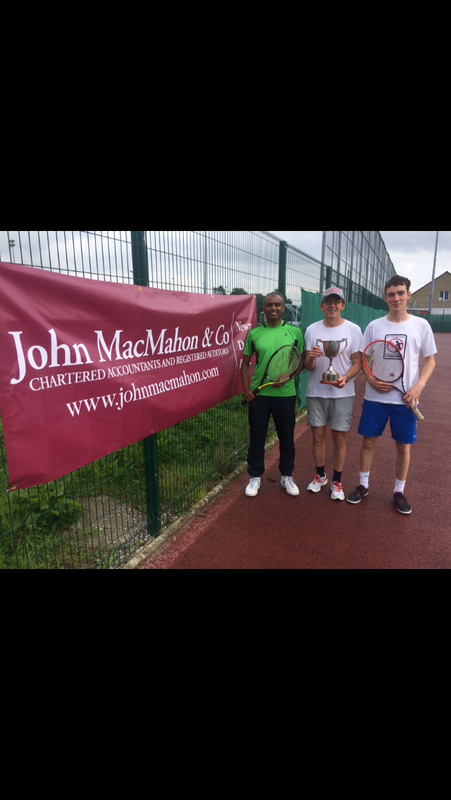 In the main final, sponsored by John McMahon and Son Accountants, Arghal McMahon was defending his title against Giby Vettiankel. The two have met twice before in the final. In 2012 Giby won and last year Arghal won. Giby seems to define the laws of nature in his ability to continue playing at the top level for what is now well over twenty years. He reads the game very well and has an arsenal of shots that you don’t see others play. 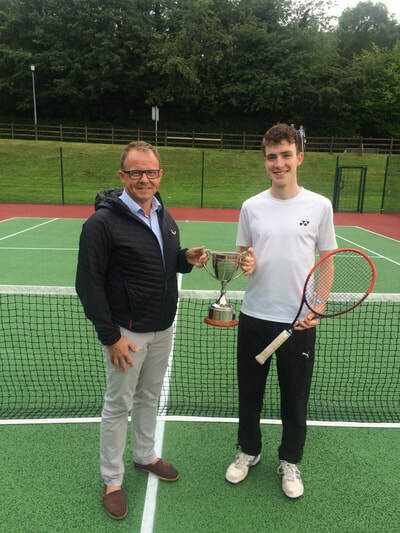 He is able to put opponents in awkward spots on the court; to hit outright winners and to retrieve as well as anyone in South Down tennis. This year Arghal was carrying an injury. This meant he was only able to serve under arm and he wasn’t able to smash overheads. His ability to adapt his play around his injury and his speed round the court had secured his route to the final but losing his serve in the opening game suggested today might be a different story. All the onlookers must have felt sure of this as Giby raced to a 4:1 lead. But good players are able to change their game plan and Arghal did and he brought the set back to 4:4. He needed to hold his serve to go 5:4 but Giby put his partner’s injury out of his mind and went on the offensive. He broke Arghal and held serve to take the set 6:4. Arghal had given what he could and there were signs that he may be straining his injury. Giby secured victory 6:4 6:0. 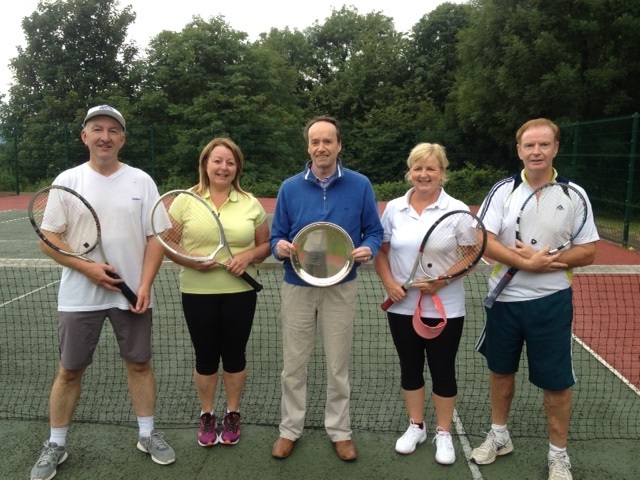 Monday 22nd August saw the first day of the singles tournament in Rostrevor. This year has attracted a very strong field. There was a strong opening match with Shane McAteer taking on Eoghan McMahon. 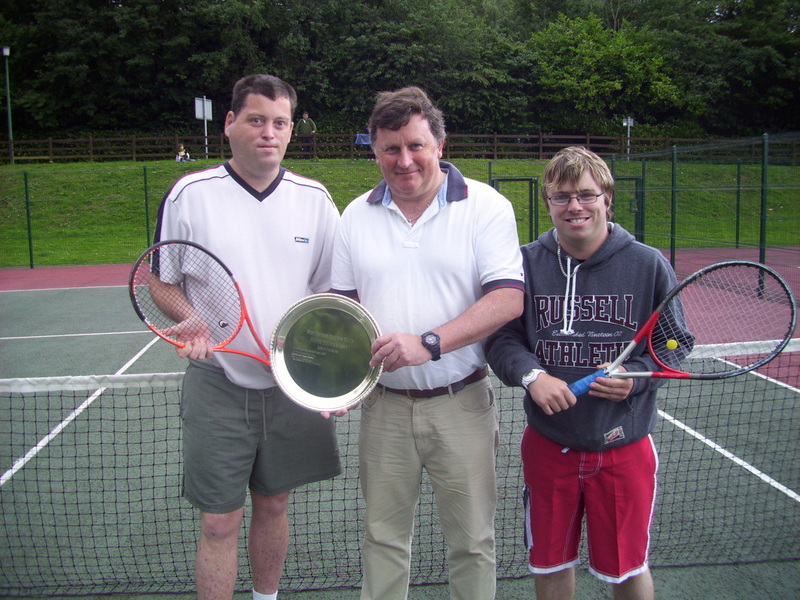 Shane, and brother Malachy, are great athletes, they have a real determination to win and Shane’s tennis has gone from strength to strength. Eoghan is a fine player too and what would have been multiple winners against most other players Eoghan found were being returned with interest. Shane has great court coverage and he is increasingly able to silence more and more of the better players around. Today was no exception – he won 6:1, 6:3. For Patrick McMahon Chris Gibbons has always been his nemesis – he has never beaten him in a competitive match. In this match Patrick showed great consistency with a low error count and his fitness and ‘wall-like’ ability to return meant that he had match points in the first game and he had a further three in Chris’ next service game but Chris he shorten the rallied. Patrick’s resistence paid off and he broke back and then took a break of his own. Chris then made the mistake of being too defensive – while this kept the ball in play for longer it was a style Patrick’s fitness could easily manage. At 4:4 in the first set the ninth game could easily have swung either way. That it went to Patrick and with it in the next game and the set was probably a fair reflection of the match. Patrick kept on the offensive and broken Chris in the first game of the second set, held and broke again. At 4:1 it looked all but over but Chris quickly broke Patrick to love and held his own. It was 4:3 and Patrick was serving again but despite a couple of shaky serves he held his nerve and won the match 6:4, 6:3. Another evenly balanced match was between Ryan O’Hare and Michael Sands. Ryan is a fine player but he has been out of tennis while undertaking his degree. Michael, while much older, is a fine player and he has all the shots. It was no surprise that it was going to be close. Ryan pipped the first set 6:4 but Michael held his nerve and broke Ryan in the second set and held on to the break having an opportunity at 6:5 to serve out the second set. Ryan grabbed one of only a couple of break point opportunities in the second set and took it to a tie break or the ‘penalty shoot-out’ of the tennis world, before we knew it Ryan had two mini-breaks and he didn’t look back – winning 6:4, 7:6. 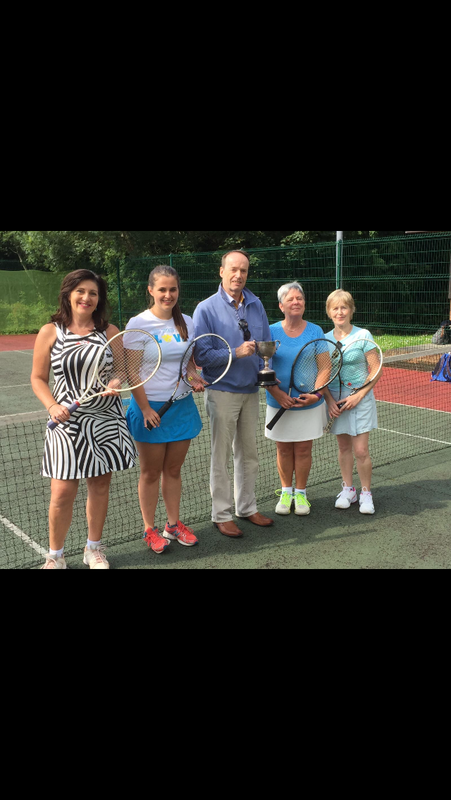 Rostrevor Singles Final's Day, August 28th, 2016. From left to right - Eoghan McMahon and Rory McGeown with Club Chairperson , Chris Gibbons in the Plate final; Eoghan receiving his trophy; Eamon Crawford and Malachy McAteer with Myrthin James, MD of 3RMobility, sponsors Kilbroney Cup; Malachy McAteer, receiving the trophy; Giby Vettiankel and Arghal McMahon with John McMahon, MD of John McMahon and son Accountants, sponsors of the Main event; Giby receiving his trophy. Results from the Ladies and Men's Doubles 2016 - running clockwise - Ellie Murdock [and Breege Crawford] beat Dolores James and Anne McGreer [Chris Gibbons, Chairperson]; Trisha White and Mary McGeown, with sponsors Mark Reynolds, on behalf of Fitzpatrick and Kearney Accountants, Emily Grant and Megan Harty; Trisha and Mary, victors with Mark; Malachy and Shane McAteer, Plate winners; Tom Harty, Arghal McMahon, with Mark, and Rory McGeown and Ben Laverty; Arghal and Tom with our sponsors. 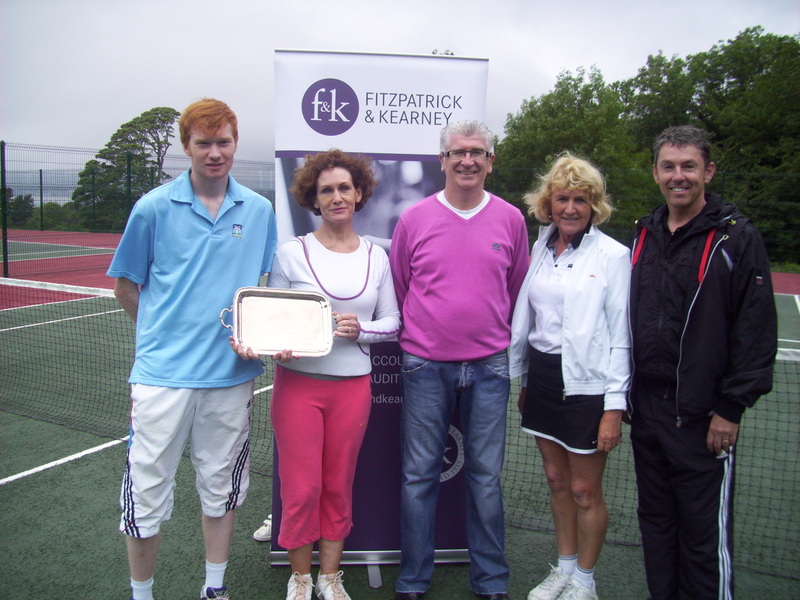 Results from the Mixed Doubles 2016, with Mark Reynolds on behalf of our sponsors, Fitzpatrick and Kearney Accountants - running clockwise - Liam Lynch and Margaret O'Hare and Deidre Dinsmore and Eamon Crawford; Plate Winners Eamon Crawford and Deidre Dinsmore; Mixed doubles finalists June McEvoy and Giby Vettiankel and Derek Laverty and Alison Dunne; Winners June and Giby. The draw for the doubles first round matches are listed below. Just a few ground rules - Please bring £5 entry per person to pay before the first match. A ten minute warm-up is allowed. Please refrain from any bad language and show respect to your opponents. Part of this process is to arrive on time and to play in a timely fashion. Each team has only one opportunity to request a a change in match time. They must forfeit the match if they cannot accommodate the second match time. Similarly, if one is more than 15 minutes late in arriving for a match on more than one occasion then their opponents can choose to take a walkover. 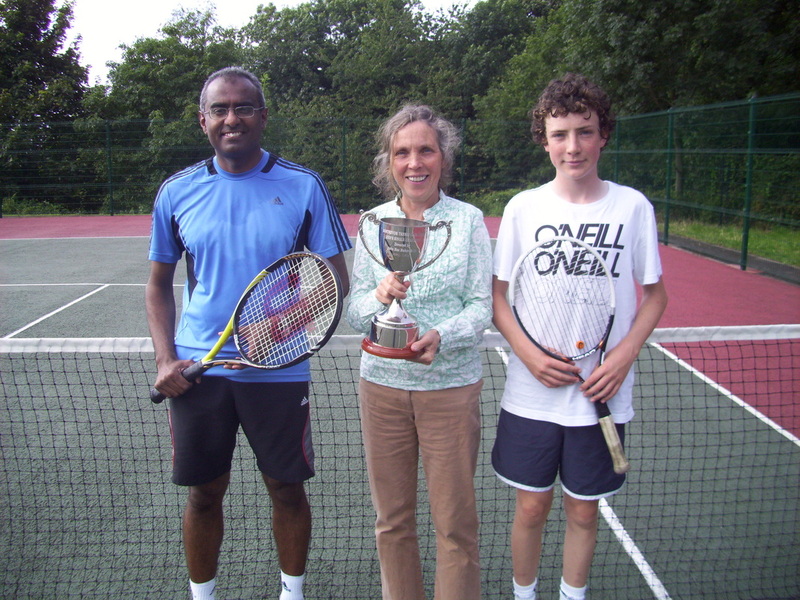 Results - Eamon and Deidre beat Liam and Margaret 6:3, 6:2; Giby and June beat Derek and Alison 6:2, 6:3. Below is the draw and match results and is followed by match report highlights. The ladies' Doubles Plate and main final will take place at 2.30pm and the Men's Doubles Plate and main final will take place at 4.30pm Sunday 24th July. 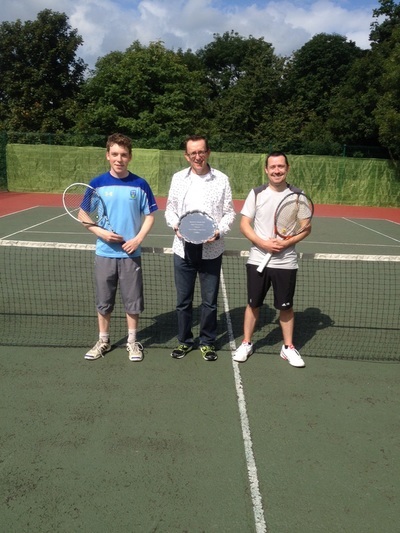 Plate results - Shane and Malachy McAteer beat Derek Laverty and Ryan O'Hare 6:1, 6:3. 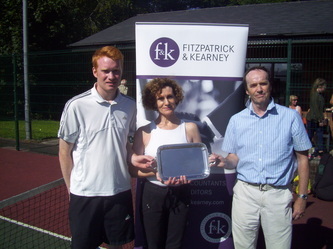 Sunday 24th July saw the ‘Fitzpatrick and Kearney’ sponsored Mens’ and Ladies’ Doubles finals. In the ladies plate final Dolores James and Anne McGreer took on Ellie Murdock and Breege Crawford. 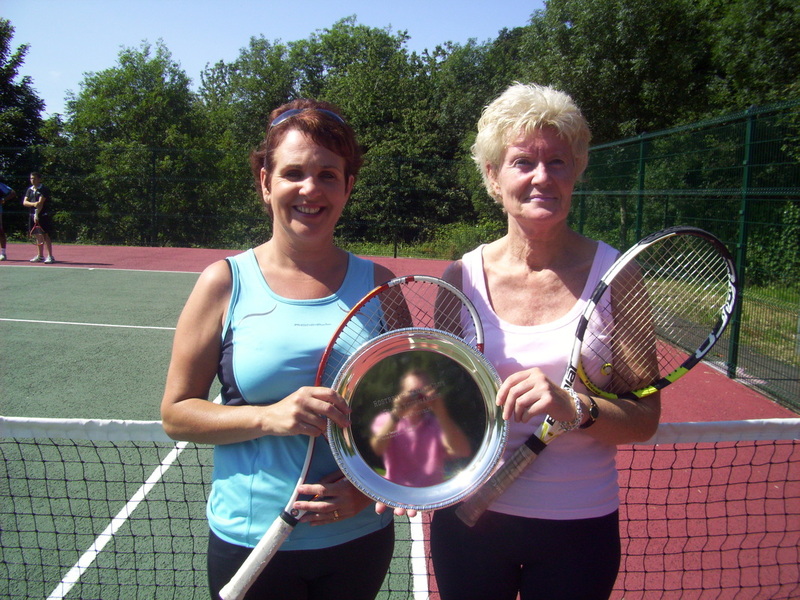 The first set was closely contested and this was a credit to the much improved tennis game from Dolores and Anne, both relatively new to the game. The set, however, went the way of the more experienced pair. As is often the case when a set ahead, Ellie and Breege relaxed more and began to find their mark and they took the second set with ease. The final score 6:4, 6:1. 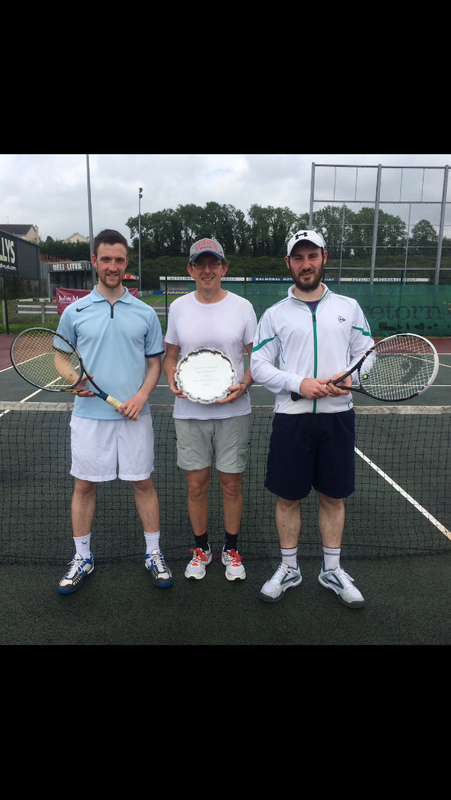 In the Men’s Plate final the veteran Derek Laverty with his young assistant, Ryan O’Hare, took on Shane and Malachy McAteer. 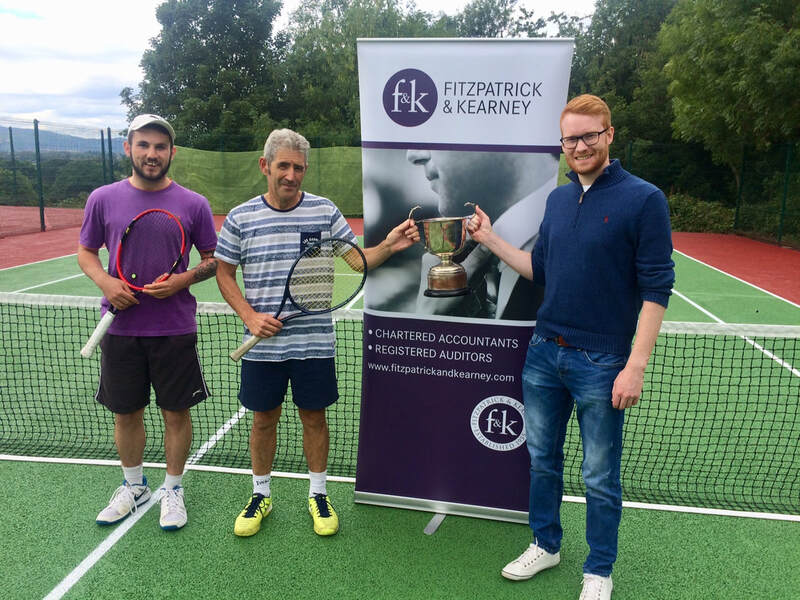 The odds were always going to be stacked against Derek and Ryan – Shane and Malachy had lost in three very tight sets against opponents who were to make the main event final. They are both incredibly fit and have good natural sporting ability. Ryan has dramatically improved over this last year but he struggled to handle the pace from his opponents. Derek is one of the best volleyers in the area but he has to get into the service box quickly and his opponents did all they could to force him back. 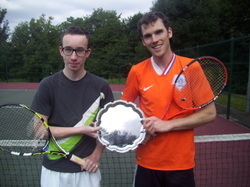 Shane and Malachy triumphed 6:1, 6:3. In the Ladies Main event it was experience versus youth in the form of Trisha White and Mary McGeown against Megan Harty and Emily Grant. Megan and Emily are very talented players and they hit great serves and forehands and their opponents did well to get the ball back in court in many of the early rallies. The first set was very tight with only a couple of points separating the two. Emily and Megan took it 6:4. Mary and Trisha used their experience to remain patient and to wait for their chances. This was tested when they went a break down but their moment came and they took the second set 6:4. A crowd had gathered to watch the final set and it was again close – good tennis is a balance between hitting shots that keep your opponents on the back-foot and then waiting for a mid-court reply that you can attack. If you are too defensive good opponents will attack and win. Trisha and Mary prevailed and pulled off a terrific win 4:6, 6:4, 6:4. 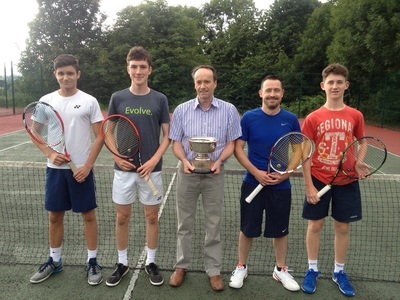 In the Men’s final Rory McGeown and Ben Laverty took on Arghal McMahon and Tom Harty. Rory and Ben had come off a thrilling three set semi-final match, knocking-out the cup holders. 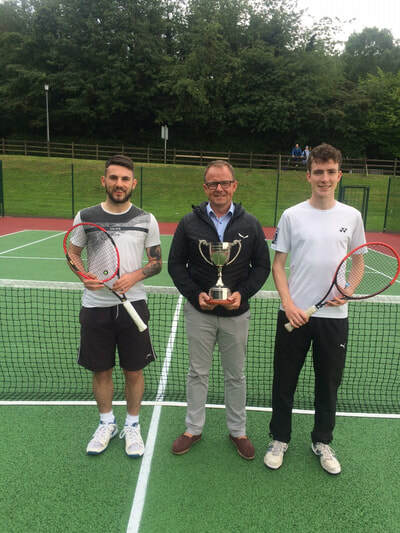 Their tennis then was exceptional and it was asking a lot to maintain this standard and indeed to up it, which they needed to, against two top Ulster players in Tom and Arghal. 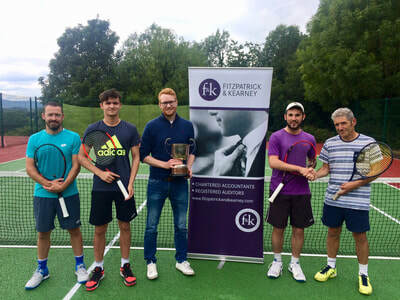 The tennis was of a high order – booming serves and the ball striking on forehand, backhand and volleying was impressive from all but Tom and Arghal were just that little bit better than their opponents in most departments – they won 6:1, 6:4. 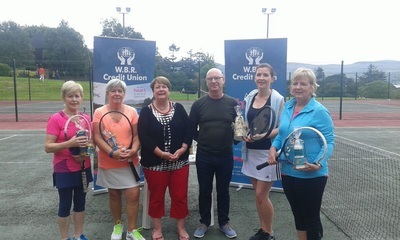 The second of the ladies semi-finals saw a great match between Mary McGeown and Trisha White against Margaret O’Hare and Alison Dunne. Margaret and Alison hit the ground running and took an early lead, in large part to being error free in their shots. 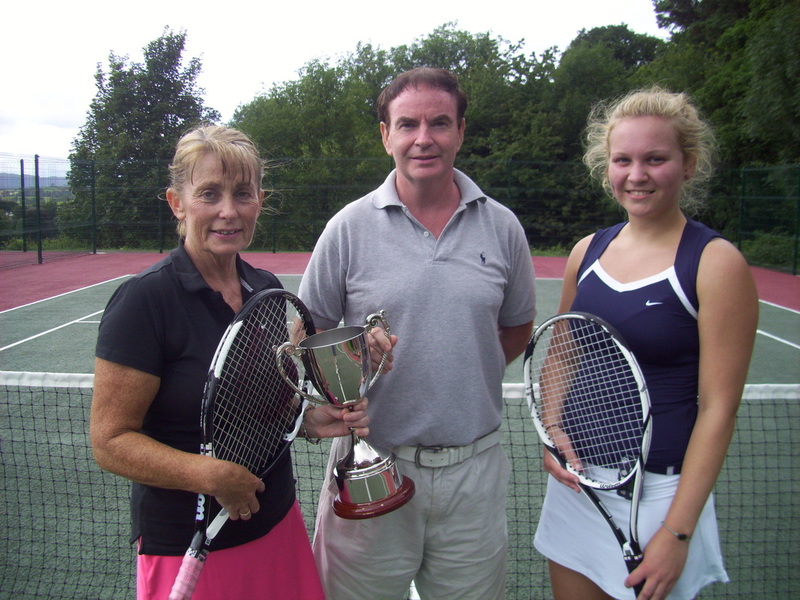 Margaret was sold from the baseline and Alison was impressive at the net. They took the first set comfortably and a break early in the second left many thinking the match would soon end. However, the error count dropped from Trisha and Mary as they began to find their range. They broke back and took the second set. 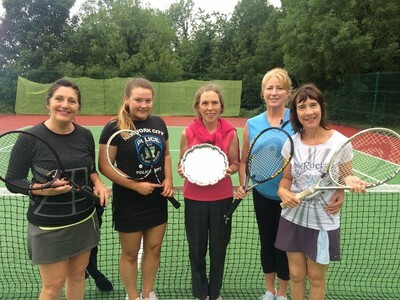 The third set was very close and was a repeat of the second with Margaret and Alison taking an early break only to lose it and at one set a piece and at 4:4 Mary and Trisha used the momentum they’d gained in breaking back to see them through. The final score 3:6, 6:4, 6:4. Thursday also saw Eamon Crawford and Tim Smith take on Arghal McMahon and Tom Harty. Arghal and Tom are top Ulster players. Eamon is a fine player and very competitive and Tim has won more of the trophies at the three local clubes than the other three put together. The match saw some terrific ball striking from all four players and when the quality is so high it was always going to be the team that takes the half chance that is going to win. The first opportunity – one break point, came and was taken by Tom and Arghal. They took the first set 6:3. 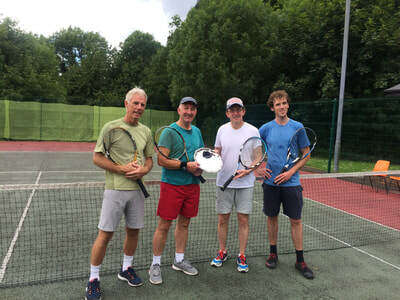 Tim and Eamon mixed up their game plan and varied the shots and broke back and led the second set 4:1 but they could do no more as Tom and Arghal found a new gear with backhand winners, drive forehands and deft volleys. They won 6:3, 6:4. Defending champions Jamie and Giby had demolished Derek and Ryan in an earlier match and they were the favourites going into this match. However, their opponents were not to be intimidated and they took an early lead and a score of 4:1 left many writing off this first set. However, Jamie and Giby fought back and 4:1 soon became 4:4. Rory and Ben took the next, 5:4, Giby and Jamie fought back 5:5. Rory served and was love 30 but came back to hold at 6:5. The momentum switched and Giby was serving to take it to a tie-break but Rory and Ben earned two break points, one of them coming from a fierce forehand winner from Ben. Giby saved the first set point but at 30:40 Ben pulled off a second bullet-like forehand to clinch the set 7:5. They followed this up with an early break in the next set and at 4:1 a stunned audience had all but given up on Giby and Jamie. However, they have held the Cup for four years and, as in the first set, they found a way to bring the games level at 5:5. They then broke their opponents and took the second set 7:5. The third set was no different – an early break by Ben and Rory was clawed back by the defending champions. Giby is regarded as the most naturally gifted player in the area and he regularly plays and beats opponents twenty or more years younger than him. Once he gets into the service-box he wins 8/10 points and it was the increased aggression from Giby and Jamie that helped pull them back. Ben is the youngest of the four and this was the biggest match he’s ever found himself in. He had shown several mini-outbursts and this usually signals a player’s demise [unless you’re called John McEnroe] and it looked like this might well happen here. Rory and Ben were leading 5:4 and their opponents had to hold to stay in the match. This was repeated at 6:5, and then at 7:6, at 8:7, at 9:8. Ben and Rory showed real grit and went on the offensive to earn two match points on Giby’s serve at 15:40. Giby saved the first but Ben produced another blistering forehand to take the match 10:8 in the final set. The match ended to a standing ovation. Many thanks to the credit Union and to Breege Crawford for sponsoring the main event and the Plate event. From clockwise Tricia White and Mary McGeown beat Alison Dunne and Deidre McGeown in the Ladies main event; Helen and Breege Crawford beat Dolores James and Anne McGreer; Sean Sloan and Eamon Crawford played Derek Laverty and Jeoff in the main Men's event final and Michael Sands and partner beat Liam Lynch and Pat O'Neill in the Plate final. 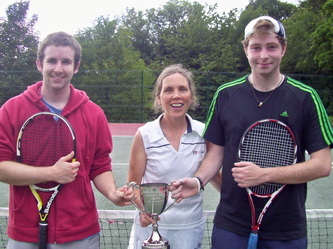 Eamon and Sean beat Derek and Jeoff in an excellent display of tennis from both sides of the net. 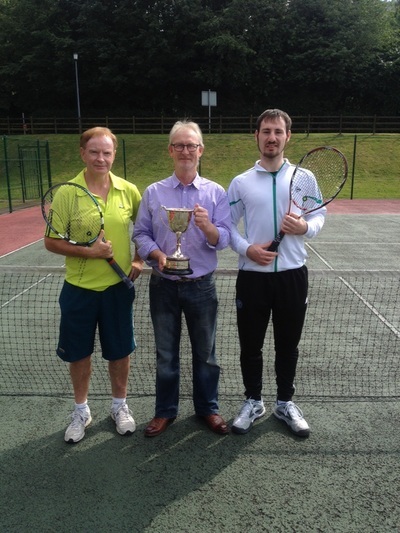 Saturday 22nd August saw the final of the Men’s Singles tournament at Rostrevor Tennis Club. 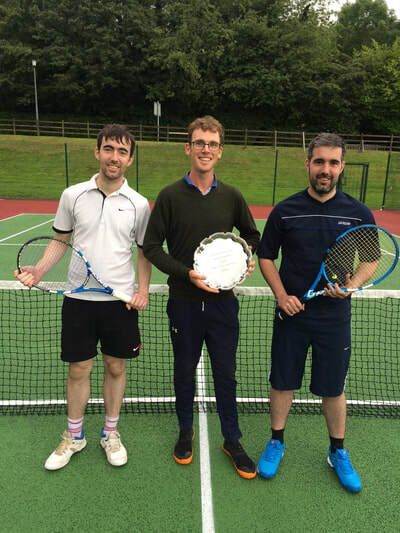 Unlike the other Clubs in the area the Singles event involves three competitions - those who get to the traditional final; those who get knocked out after the first round and get entered into the Plate and those who get knocked out after the second round - the Kilbroney Cup. 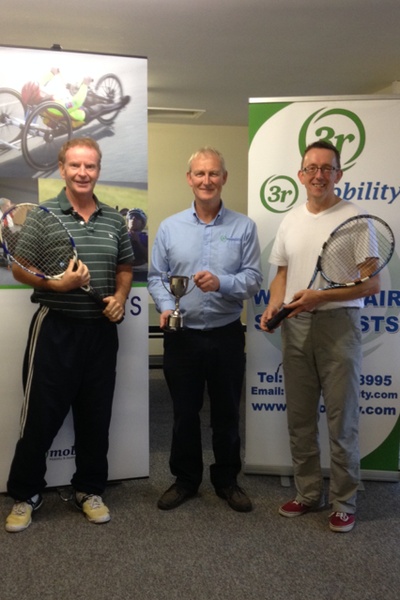 The main event is sponsored by John MacMahon and Co Accountants and the Kilbroney Cup by 3rmobility. The tournament this week saw two rising stars - Tom Harty and Shane McAteer. Tom is one of the growing talents in South Down tennis and for tennis connoisseurs, Tom’s technique and style of play is Federer-like. He is the only player around who hits his backhand topspin like his idol. One of the most entertaining matches was the semi-final between Tom and veteran Gibby Vettiankal. Gibby showed terrific defensive skills to keep in the rallies against pounding forehands and backhands from his opponent. Tom knows well Gibby’s tennis reputation and he made the mistake of playing the person rather than the ball. Tom lost the first set 6:2. 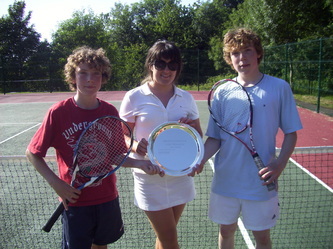 In the second both players produced their best tennis and the rallies were terrific. Tom showed his metal by saving a break point with a powerful drive volley into the corner at 4:4 but he was eventually broken. Gibby came out to serve for the match 5:4 only to be broken by Tom with some terrific play but Tom was broken in turn and Gibby didn’t make the same mistake twice winning 6:2, 7:5. In the Plate final, Liam Lynch celebrated his 55th birthday taking on an opponent half his age in Gary Hanratty. Gary has developed a strong serve and regularly aces his opponents and his forehand and backhand have improved too but he is vulnerable if out of position. Liam learned this having lost the first set 6:2. He changed his strategy and hung in the rallies more and ground out a 6:2, 4:6, 2:6 victory. 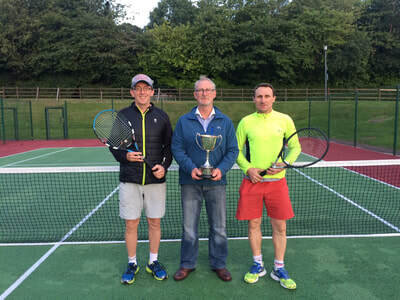 In the Kilbroney Cup, Shane McAteer produced the shock of the tournament defeating Eamon Crawford, the defending champion, in the opening round. Shane was knocked out of the main event and the Plate in early rounds last year but this time he was in the final and Chris Gibbons wasn’t able to find any weaknesses in young Shane’s arsenal - many of the games were deuce games but Shane won comfortably 6:1, 6:1. Defending champion and Ulster player, Arghal McMahon had made all his very talented opponents in the earlier rounds look decidedly ordinary as he went about his business. In the final he faced Gibby. The last time they had met, three years ago, Gibby won, but Arghal is much improved and he is not only able to hit the ball harder he has more shots at his disposal and can match the best around the net. The two players produced some excellent rallies. Both like to attack the net and both showed a deft touch as well as the ability to about turn and race to the baseline to deal with some excellent lobbing. Arghal out-gunned Gibby to take the first set 6:3. In the second Gibby remained focused and earned a break to lead 4:2. Arghal took this back and a tie-break followed. Gibby earned a couple of mini-breaks and had three set points. Arghal saved two but not the third. In the third set Arghal was back with a vengeance and he produced a strong performance to win 6:3, 6:7, 6:2. Monday 17th August saw the first day’s play. Liam Lynch took on Patrick O’Kane, Kilbroney Cup winner in 2012. Patrick technically is the complete player and many years Liam’s junior. 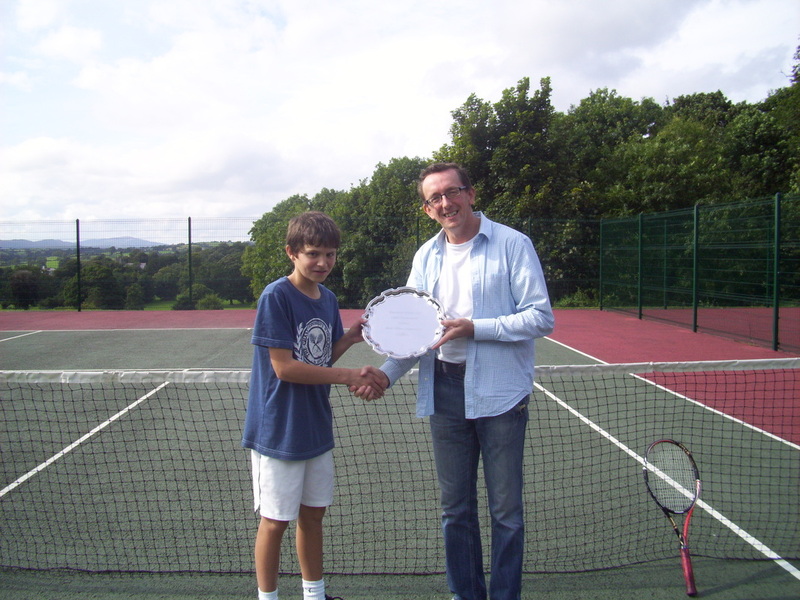 Liam is very competitive and is the most improved player in the Club this year. Liam’s style is to hit the ball late. This gives him more time on fast balls and he slices everything. This means he rarely hits clean winners but he gains a terrific number of points from his opponent’s errors. His opponent has to win the shot to get the point. These contrasting styles made for a great competition with Liam slicing back Patrick’s heavy forehand and frustrating him by tenaciously hanging in. All was on serve and tight up to 5:4, with Patrick to serve to stay in the set. Patrick was down 15:40 and Liam had two chances to take the set. The first he lost on an uncharacteristic error and with the second Patrick hit a clean winner, just catching the line. Patrick held serve and then broke Liam and held his serve to take the set 7:5. As is so often the case with closely fought sets, the energy toll on both sides was huge and to the loser the psychological affect often costs him the match. Such was the case here - Patrick won 7:5, 6:1. Gary Hanratty has developed a serve that regularly aces opponents and he hits a hard forehand and strong backhand and he’s a leftie - a great advantage in tennis - unless your opponent is left-handed too, as is the case with Chris Gibbons. Chris has the advantage of never having lost to Gary, despite some close affairs, and he deliberately targeted Gary’s backhand with kicking serves. This and mixing up the serve earned him many free points. Gary was hitting it harder in the baseline rallies but Chris was able to stay in long enough to force an error or to ghost into the net to put away a volley. Gary’s frustration was obvious and this cost him points too in some unwise attempts at winners from the wrong place on the court. Chris won 6:1, 6:2. This result may well be reversed against the youthful Jamie Campbell for whom it can be said, as Agassi said of a young Federer - ‘He has no weaknesses’. The McAteer brothers were also in action. Both have taken a leaf out of the Tim Smith school of coaching - they wait for the ball to drop down on the bounce until it is low and then they rip a forehand low over the net. Malachy faced Patrick McMahon and showed no mercy in a love and one victory, although many of the games were deuce games so the score line didn’t reflect the worthy battle Patrick offered. Patrick can match the best for fitness but the better timing that comes from regular play usually assures victory and that was the case here. 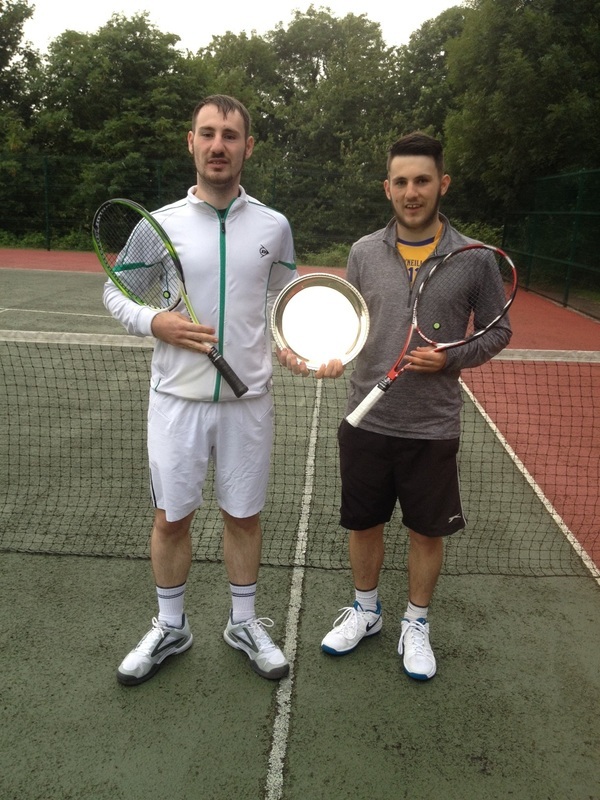 Defending Kilbroney Cup champion, Eamon Crawford took on Shane McAteer. Eamon was giving Shane forty years but that also means that while slower, Eamon has a range of shots to get him out of difficult spots. Eamon was the strong favourite before the match but Shane is a different player from the one that was knocked out in first round last year. He was always extraordinarily fit and would return everything but now he hits a terrific forehand and a consistent backhand that isn’t far behind. Eamon soon found himself 3:1 behind. He battled valiantly but the set went Shane’s way 6:3. The second set, indeed the whole match, had the quality of the some of the best finals at any level in Rostrevor. They were both in the zone in the second set and were going toe-to-toe in baseline rallies. Eamon’s experience and competitive instinct saw him take a 4:1 lead but he let slip two opportunities to go 5:2 and Shane did the unbelievable in clawing his way back a game at a time and winning 6:3, 6:4. It may turn out to be the shock of the tournament that Eamon was dispatched in the first round but he holds his head high - Shane had to play the match of his life to win. Please find the draw sheet to download below. Each match is the best of three sets. In place of a third set a Champion's tie-break can be played. If players differ on their preference then decide by the toss of a coin. All finals will be over three sets. The Tournament referee is Chris Gibbons. Please pay your £5 at your first match. All players are guaranteed at least two matches. There will be a Plate competition for those who lose in their first round and the Kilbroney Cup for those who lose in their second round. 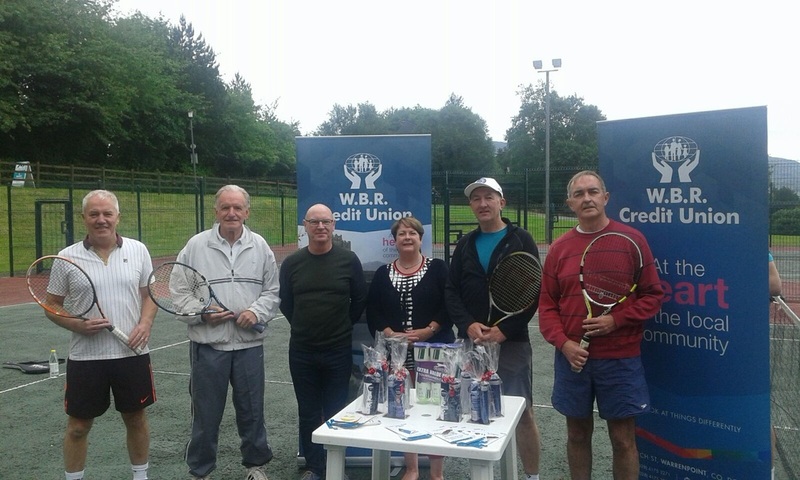 Rostrevor Mens Singles Draw 16.8.15. 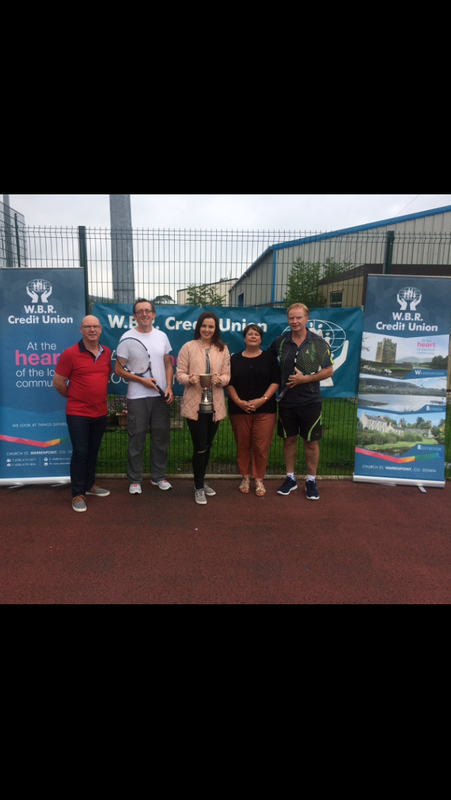 The first finals match got off to a cracking start with lots of strong net play from the ladies and swift serves from the men holding fort at the back. Giby and June kept the pressure on and took the first set 6:2. In the second set Eamon and Mary held their own and fought back hard in the first game and produced the best rally of the match. 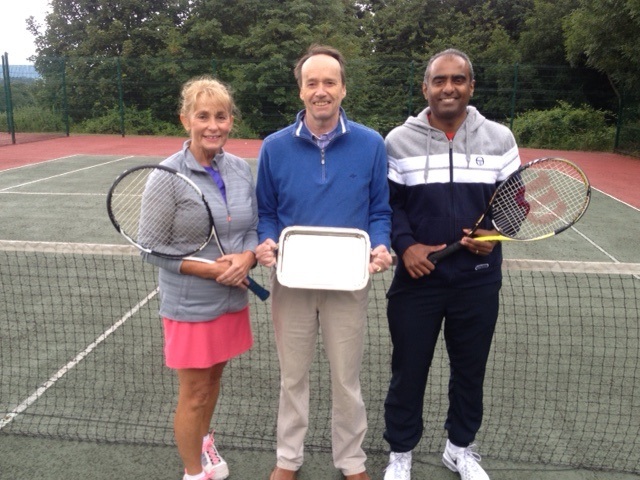 June and Giby kept up a steady flow of long volleys which found the right spot and the score went to 3:2. Mary fought back with some excellent return of serves to break Giby's serve and score a few points. The set was close at 5:3 and the next game was dominated by sharp chips over the net by June and powerful cross court volleys by Giby. Despite some brilliant aggressive attacks at the net by Eamon, June and Giby went on to win the second set at 6:2, 6:4. After her first mixed match, June had little time to draw breath before taking on her second match of the day. It was 1:1 at the beginning of the set then Alison and Margaret got into their stride and played steadily with Margaret displaying great cross court volleys and Alison giving very strong backhands to take the first set 6:1. In the second, June fought back with some great accurate down the line shots and Breege played some cracking net shots to push them ahead 3:0. 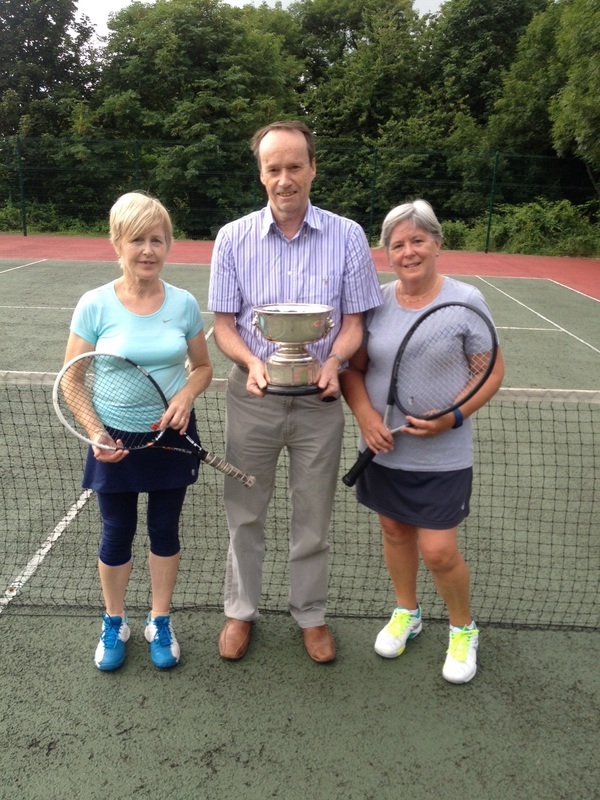 Alison and Margaret rallied back winning points by excellent interceptions at the net to catch up to 3:3. This second part of the set was dominated by long, tense rallies where both sides were picking their spots and playing carefully. Margaret and Alison then began to edge ahead to 3:4. 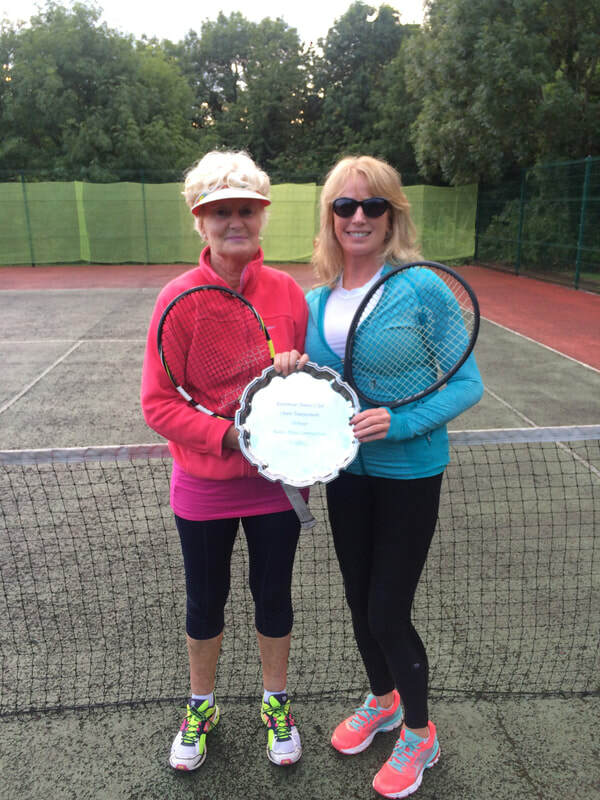 June and Breege won another game displaying some great cross court shots and Breege gaining several fantastic side angle shots at the net. 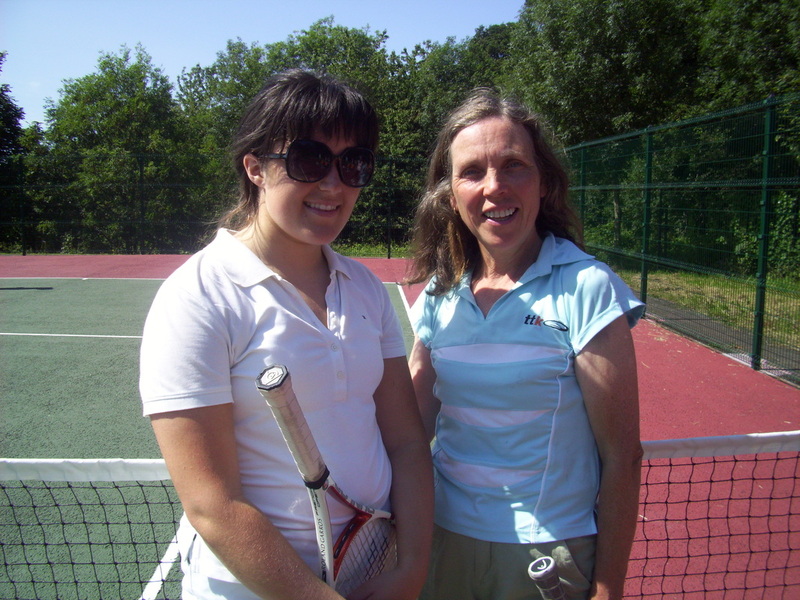 Alison and Margaret continued to play steadily. Margaret picked up some more points with high, well placed lobs which went over her opponents' heads landing smack on the line and combined with some great shots at the net by Alison. The duo went on win the second set and the match at6:1, 6:4. ''Fast and furious'' best describes this epic cross-border match! The pace was frantic and the pressure relentless from both sides. Our local number one seeded lads put the pressure on from the start, bringing the score to 3:0 in a short space of time. However this score belied the aggressive attack that the Dundalk pair meted out on the Newry boys. In the fourth game the momentum moved to the Dundalk side as they gained more steam with quick reactions at the net to win the game. In the fifth game Giby hit some aggressive volleys to win back another one. Stephen Broadhurst, from Dundalk, showed great net play to bring the score to 5:2. Jamie Campbell was hitting fast and furious, winning lots of cross court forehands and also losing several balls over the fence! The first set ended 6:3 for our local pair. The second set was a much more closely fought affair with the home team constantly keeping ahead by one game. Both teams were using every shot in the book and Garrett Smyth won points for Dundalk with his powerful backhand. The set was very tense and close at 6:5. Jamie continued with his powerful cross court forehand to gain points (and lose another ball over the fence!) and Giby picked up some more with his double backhand. 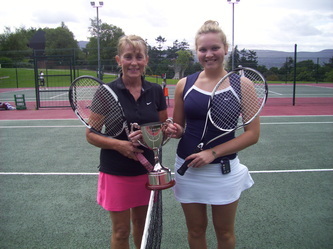 Giby served a killer shot to win the match 6:3, 7:5 and retain the trophy for this local duo. An epic, three hour, Plate match was fought out in glorious weather. The opening game was played out in long rallies, with every ball fought for and nothing given away. Indeed the opening game set the stall for what was to come a close contest. Maureen and Helen were quickest out of the blocks, and managed to come out on top more often, especially on the important points. They took the first set 6 :1. Derval and Julie started to find some form as the second set unfolded. Some great rallies, and a few improvised instinctive reaction net shots had the crowd gripped as the balance of power shifted across back and forth across the net until Derval and Julie grabbed their opportunity. They took the second set 7-5. With the match poised at one set each the third set started nerviously for both teams. Bouyed by the advantage of having taken the second set Derval and Julie were the first to relax and they started to take control of the game. The match was a thrilling three setter. 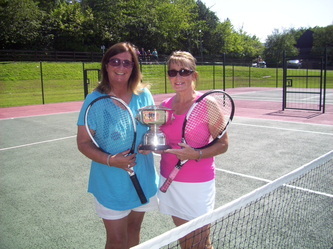 Maureen and Helen refused to give their opponents anything easy. 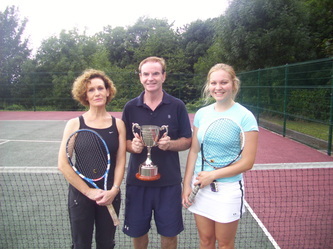 Derval and Julie seemed to relish the tough challange and stood strong and evetually clinched the match. 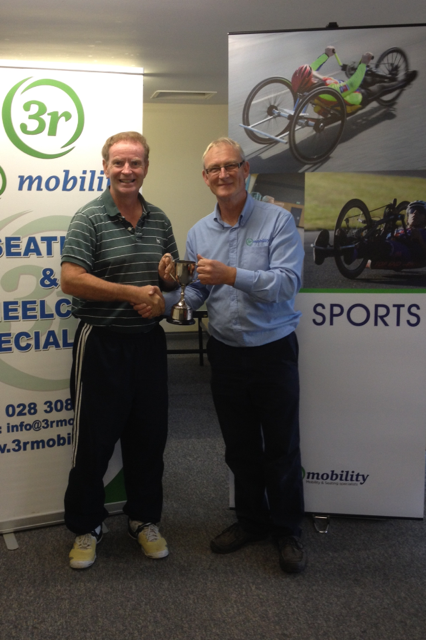 ‘3rmobility’ [www.3rmobility.com] is a wheelchair specialist manufacturer and sponsor of the Kilbroney Cup. This final was an epic battle between Chris Gibbons and Eamon Crawford. A repeat of last year’s final. Chris’ goal was to make Eamon work for every point with more defensive forehand and backhand slices to the lines and shorter balls and lobs. It was the right strategy - 3:1, became 4:2, then 5:3, but Eamon clawed back. At 5:4 Chris had an opportunity to serve out the set. It was a key game and both players had game points, which for Chris would have been set points, but Eamon stepped up the game and took this game and the next two closely fought games to take the set 7:5. The second set was equally tough and Chris broke Eamon in the opening game and held serve and took a 2:1 lead. He held on to the break and in a very evenly balanced match he took the next set 6:4. The opening game of the third set was close but Eamon held serve and he broke Chris in the next. It was a war of attrition and a very long match but Eamon stayed aggressive. Chris’ shots didn’t push Eamon out of position as they had earlier in the match and 2:0 became 4:0, 4:1. The sixth game was close but went Eamon’s way. He sealed the defence of his title 7:5, 4:6, 6:1. The McMahon accountants sponsored Rostrevor Open pitted defending champion, Arghal McMahon against Tim Smith - a re-run of last year’s final. Arghal is number five in Ulster and for the first time was favourite. It was a spectacular match - the ball striking from both players and the shot selection quickly drew a large crowd of on-lookers along with the large number of tennis devotees from Rostrevor and other clubs. Arghal is used to playing top regional and national players and while Tim is a terrific player he hasn’t been exposed to the level of play in the way Arghal has. Moreover, Arghal has phenomenal defensive skills and he returned so many shots that to almost all opponents Tim faces would have ﻿been clean winners. He didn’t just return them he returned them with pace or spin or great court positioning. Arghal was able to neutralise some of Tim’s terrific forehands with his volleying skills and he punished Tim’s second serve. Arghal took the first set 6:3. Jonathon received a bye in his Plate semi-final match and Tim faced Malachy McAteer in the Main event semi-final. Tim has made the final in three years and has won it twice. Today he showed his pedigree with an almost faultless performance in all elements of his game. Malachy couldn't match Tim in all departments but his dogged determination to stay in rallies meant Tim often had to step up to finish the point. Tim won 6:0 6:1. On Friday 22nd August Gene faced Liam in one of the Plate semi-finals. Liam is much improved in his play and is very consistent. He doesn’t hit with force but aims to keep returning until there is an opportunity to get to the net and here he is very strong. However, Gene’s pace on the ball and good serving was too much for Liam and on facing match point Gene conceded, unable to play the Plate final. By default Liam finds himself a finalist but be in no doubt - he poses a real threat. Gary Smith played Liam’s brother - Jimmy. It was a hard fought match and both had missed opportunties to get ahead. Jimmy’s patience and fitness proved too much and he won and will now face Jonathon Reynolds in the second Plate semi. In the Kilbroney Cup, what had all the hallmarks of a terrific match between Eoghan and Eamon began living up to expectations. Both were hitting strong forehands and topspin backhands and backhand slices and mixing this with moon-balling and drop shots and both served well. Eoghan’s patience and speed around the court meant that four of the five Deuce games went his way and he led 4:1 before an unfortunate knee injury meant he had to withdraw. 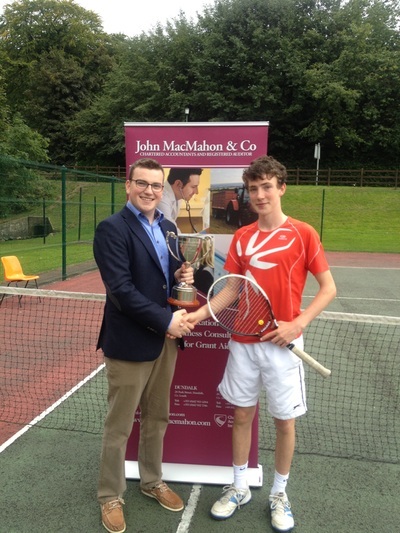 Eamon is now in the Kilbroney Cup final and has a chance to defend his title. Chris played Gary Hanratty in the other Kilbroney Cup semi. Gary broke Chris early in the match but half-way into the set Chris broke back. Gary defended well on his own serve and saved several break points. In the early games he struggled to read Chris’ serve but as the match progressed he stopped giving free points on his returns and he played consistent and went for and got clean winners from both sides on short balls. At 4:4 Chris battled hard and converted on one of his break point oportunities to lead 5:4. Serving out for the set wasn’t easy and he had to save break points before securing an opportunity to take the set. himself. He lost the match 6:4 6:4. The Rostrevor Open went up to a different level when Patrick and Arghal walked on court. From the start they hit the ball hard and deep. Patrick broke Arghal in the opening game and then held his serve but Arghal’s lazy and relaxed looking swing produced thunderbolts that left Patrick motionless on the baseline on several occasions. However, Patrick is a warrior and he left nothing in the bag as he gave Arghal his arsenal of shots and he produced some terrific forehands to the corner and some winners on short angles. Unfortunately, for Patrick, Arghal’s arsenal has a greater mixture of shots and it soon became clear that while Patrick didn’t lack conviction, nor a powerful heavy top-spin shot from both wings, he did lack a killer slice and put-away drop shot. Arghal soon adjusted to Patrick’s weapons and won 6:2, 6:1. What is worrying for whoever it is who faces Arghal on Sunday is that I thought Patrick was very fit and is playing his best tennis. A terrific match - the clips give you a taster of what was on display. Saturday sees Jimmy Lynch face Jonathon Reynolds in the semi of the Plate at 5pm; Tim Smith plays Malachy McAteer in the final semi match at 5pm. 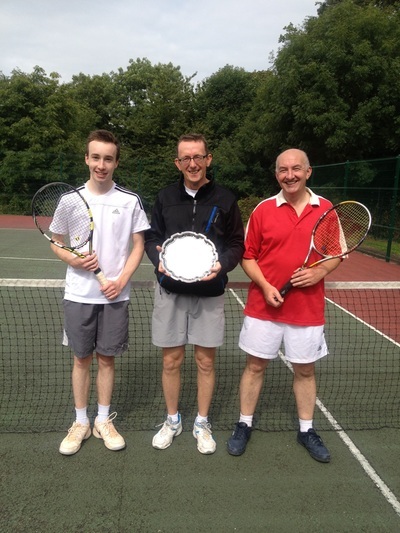 Thursday 21st August saw Gene McNulty face Shane McAteer in the Plate match. Gene lost the opening game in both sets but regained the upper-hand with a mixture of shots that ran his much younger opponent around the court. It was a tight match - for ‘McAteer’ read Duracell - they run for everything but it wasn’t quite enough - Gene clinched it 6:4 6:4. Liam Lynch took on Brian O’Hare. Brian was much improved from his first match and hit some terrific heavy forehands. 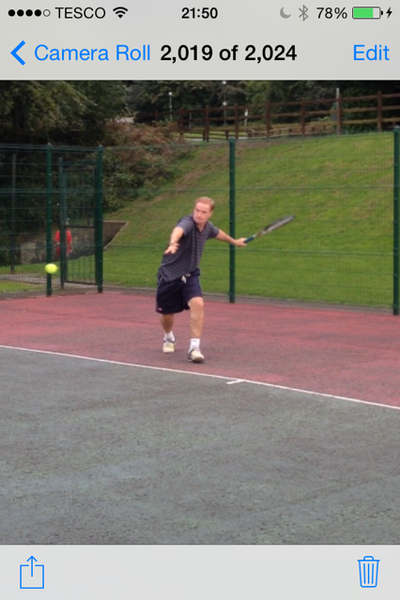 Liam hits tricky, slice forehands and slice serves and these often caught Brian out. However, at 4:4 Brian broken Liam and served out the first set. There was a rain delay at the start of the second and Liam came out with a more attacking game. He took the second 6:3. A champion’s tie-break followed and Liam kept on the front foot and was soon 7:2 up. He sealed it 10:4. Gary Hanratty shocked everyone, including number one seed, in playing some great tennis to take several games from Arghal. At 4:3 Arghal moved up a gear and took the set 6:3 and then the next 6:2. Gary is now in the semi-final of the Kilbroney Cup. 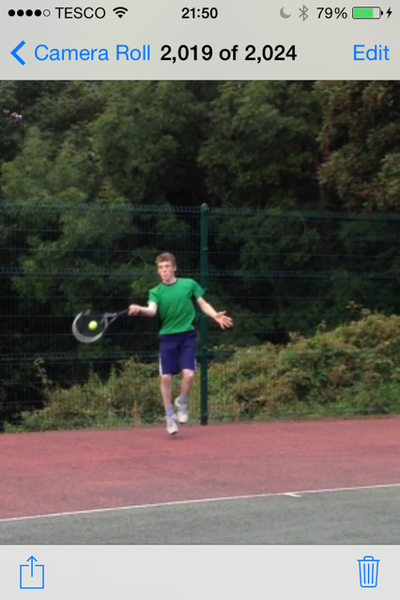 Eoghan’s efforts to serve out the set. At five apiece Eoghan came back and broke Malachy and held serve to take the first 7:5. In the second set Malachy held serve in a very tough opening game. This could easily have gone Eoghan’s way. Great players don’t let missed opportunities get in their way and Eoghan played fabulous tennis - a mixture of patience and tactical short shots and shots to the baseline corners. Malachy was playing well but not well enough - soon he was 4:2 down. Eoghan had chances to take it to 5:2 but failed to convert, 4:3 became 4:4, then 4:5 and then 4:6 to Malachy. He played in the dogged way his hero Rafa does. In the third set this titanic battle continued. At 3:3 Eoghan went for winners when patience and more tactical shots targeting Malachy’s backhand might have been better. He was broken and Malachy served for the match at 5:3. At 40:15 he had two opportunities to seal the match. He failed with his first attempt but not the second. A fabulous game to watch. 4pm Gene v Liam, Plate semi; 4pm Eoghan v Eamon, Kilbroney Cup semi; 5.30pm Chris v Gary H Kilbroney Cup semi; 6pm Gary S v Jimmy Lynch, Plate match; 7pm Arghal v Patrick C, main event semi. 5pm Tim S v Malachy McAteer, main event semi; Jonathon v Gary S or Jimmy Lynch, Plate semi. The tournament has so far seen some excellent tennis. In the early stages of the tournament Gary Hanratty seemed to be comfortably beating Jimmy Lynch, taking the first set 6:2 and being 4:1 ahead in the second but Jimmy fought back, taking it on a tie break. Gary regained the momentum in the third set only for Jimmy to start to claw back the games before Gary used his last opportunity to serve it out 7:5. 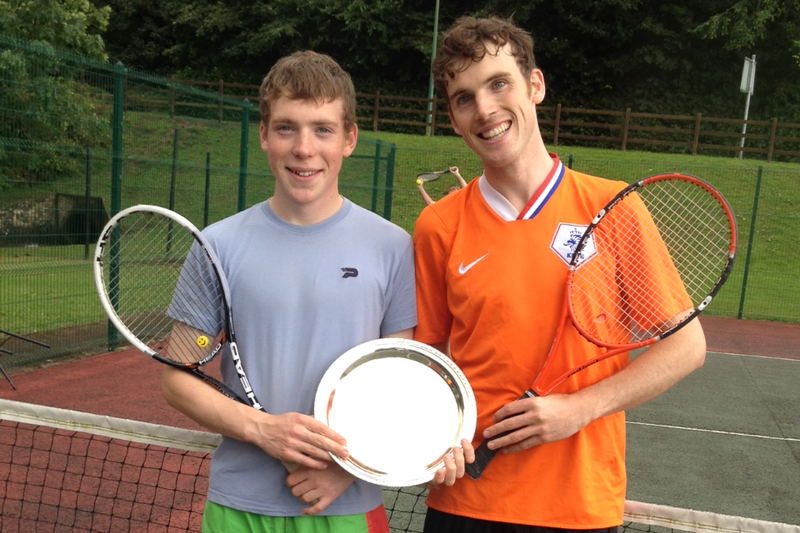 The two McAteer brothers are proving a force to be reckoned with on the court. Shane has enviable fitness and pushed Eoghan McMahon all the way. He surprised everyone with his dogged commitment to chase down every ball and to make so few errors. Eoghan had to work hard, very hard to seal his 7:5, 6:3 victory. Shane’s brother, Malachy, faced Eugene McNulty. Eugene hits the ball low and hard and he has a strong serve and is very fit but he was giving way to equal strengths and youth in Malachy and, like the other McAteer, Malachy plays like his life depends on it. He took the match 6:2, 6:3. The bad news for Gene is that he now faces Shane and the bad news for Eoghan is that he now faces Malachy in the Quarter final. Both matches are on Thursday. was another game in which small margins made the difference- Jonathon took it 6:4. He now faces Gary Hanratty in the Plate semi-final and he won’t be the only one who will have him as favourite for that match. Sunday 17th August saw a fabulous finale to the Fitzpatrick and Kearney sponsored Rostrevor Doubles Tournament. In the Mixed Plate final Eamon and Briege Crawford took on Eoghan McMahon and Derval Campbell. 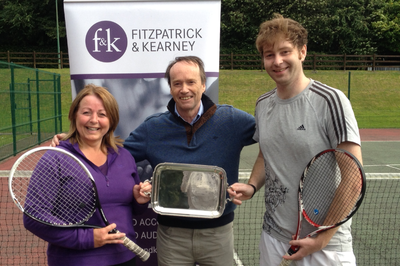 The first set went to a tie-breaker, with Eamon and Briege holding their nerve and taking the set with fewer errors. Eoghan and Derval came back in the second and took it 6:2. The third set was a tight affair - there were breaks on both sides and with each break one thought the momentum had swung in the direction of those who stole the break but only for it to swing the other way. 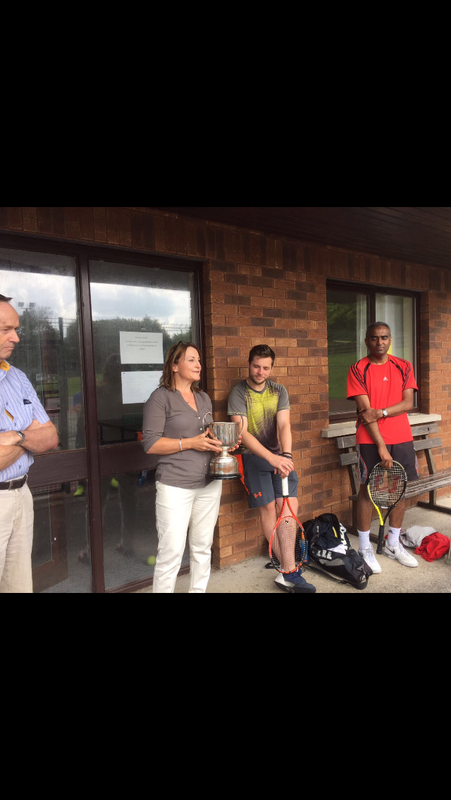 There was good serving and tactical play from both teams and, as is so often the case, it was small margins that decided the result - Eoghan and Derval took the third set 6:3. In the Main draw, Tim Smith and Margaret O’Hare faced Derek Laverty and Alison Dunne. Derek is a great volleyer and one of the smartest Doubles players in the area and had they taken the first set they would have been favourite for the match. 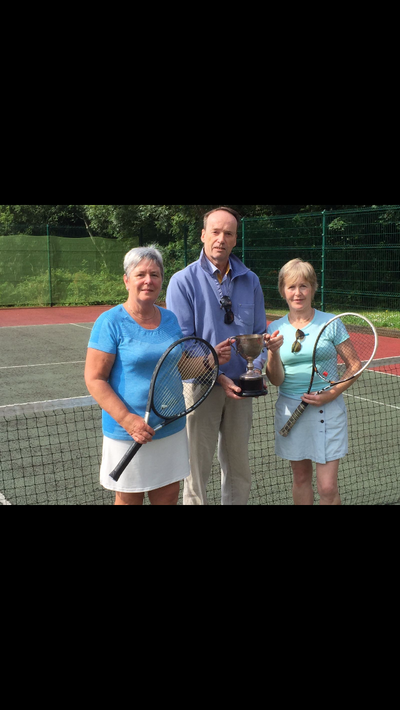 This looked likely as they led their opponents in the first set but Tim and Margaret clawed back and took the set on a tie-break. Tim hits thunderbolts from the baseline and his serve is hard and flat. 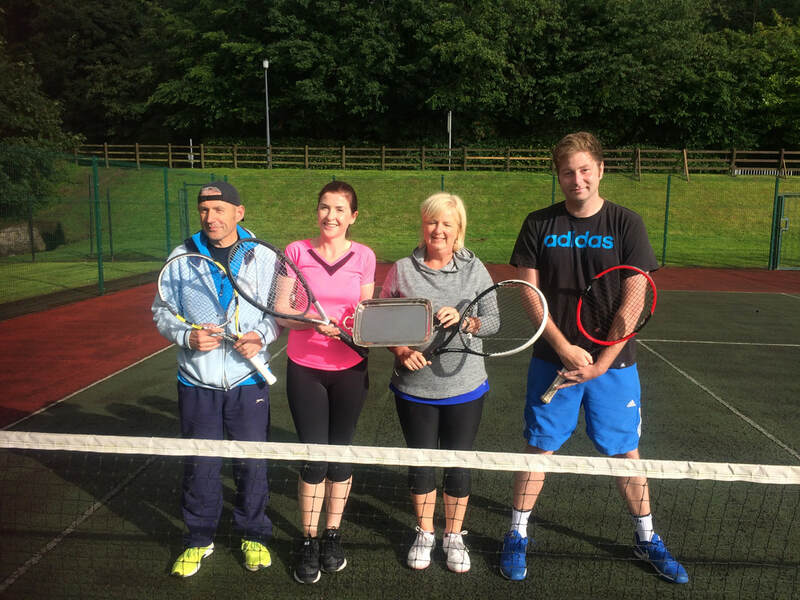 He is renowned for hitting baseline winners and it was clear that Derek and Alison wanted to get him out of his comfort zone but this proved difficult despite some excellent defensive play. Margaret is strong at the net and in several rallies she went toe-to-toe with Derek in a string of volleys. Margaret and Tim’s strengths made for a formidable combination but the second set, like the fist, was very tight and Derek and Alison had set point at 5:4 but it was snubbed out by Tim’s power and touch under pressure. The final score 7:6 7:5 to Tim and Margaret. Click on the image to see the capture for each image. 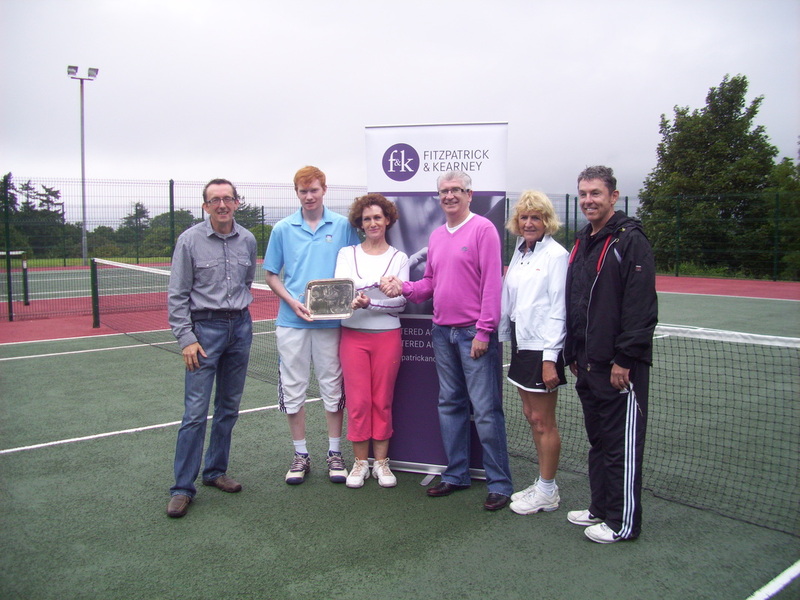 Sunday 3rd August saw the finale of the Fitzpatrick and Kearney sponsored Men’s and Ladies’ Doubles tournament at Rostrevor Tennis Club. For the first time all the final matches were taken the distance in often compelling tennis. 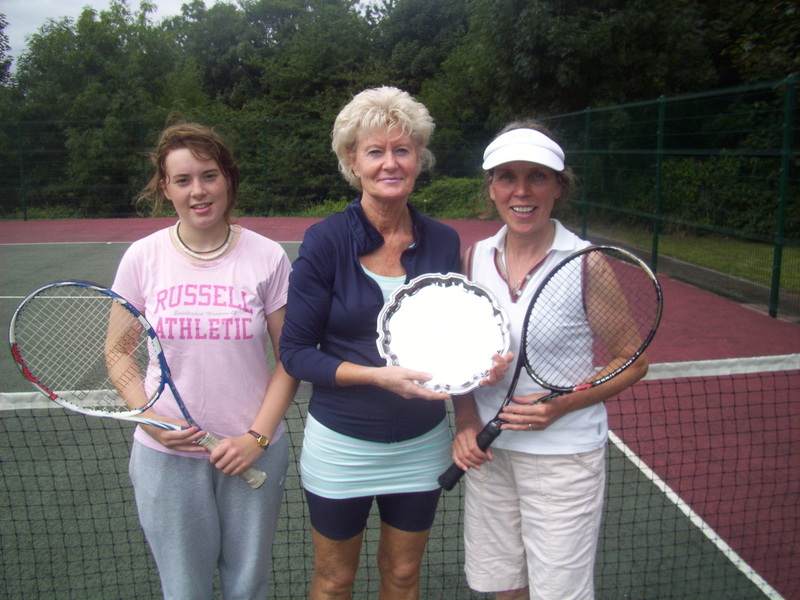 In the Plate event Dorothy Blaire and Pauline Meehan took on Julie Grant and Tricia White. Dorothy and Pauline took the first tight set holding on to one break but lost the second. Both pairs had chances in the third set. It was tight, but Dorothy and Pauline found the gaps in the court to take the match 6:4, 3:6, 7:5. In the Men’s Plate the McMahon brothers have dominated for three of the last four years. They took the first set, 6:3, with a mixture of strong forehands, good serving and fewer errors. Their opponents, Chris Gibbons and Liam Lynch, mounted a comeback after being a break down in the second set and Chris served it out 7:5. There were tight games at the start of the third set but they went the way of the McMahons and once they were three ahead they relaxed more and took the third 6:0. 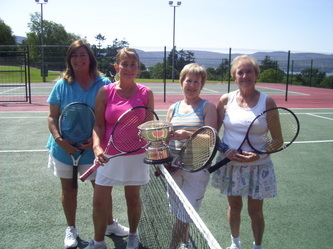 The Ladies Final saw June McEvoy and Breige Crawford take on Margaret O’Hare and Alison Dunne. 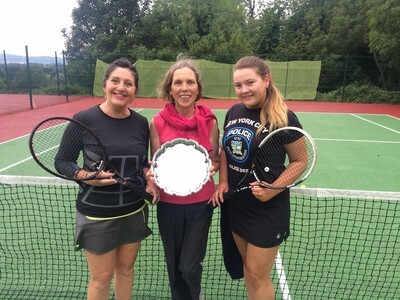 June and Breige took the first set comfortably, 6:2, but Margaret and Alison mounted a comeback and played a game of patience, moon-balling and hitting the ball deep. It is a type of play that frustrates opponents and it saw them take the second set 6:3. 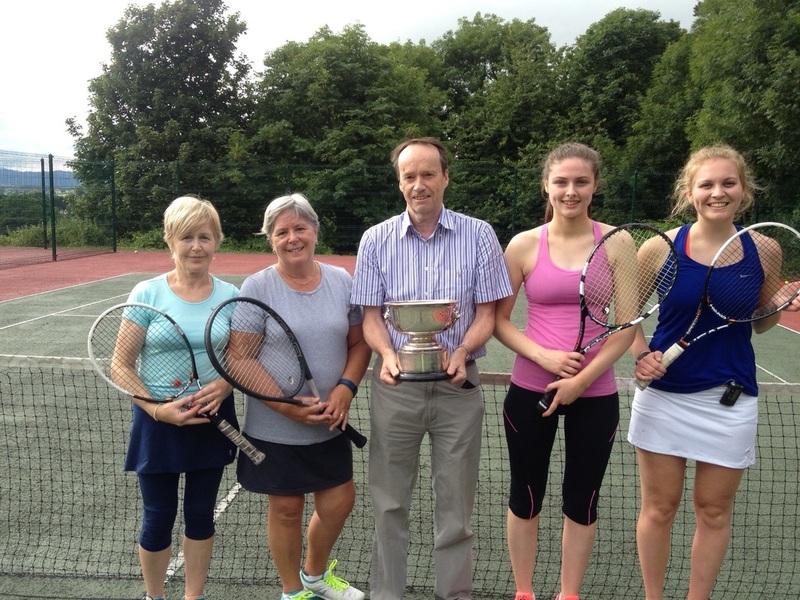 However, June is one of the best players in South Down and Breige was playing very well too and they soon held a 5:1 lead in the third but Margaret and Alison took the next game and the next and got it to 5:4 before losing it 6:4 in the third. The Men’s final saw defending champions Gibby Vettiankel and Jamie Campbell take on veterans Eamon Crawford and Derek Laverty. Eamon and Derek were the underdogs going into the match and they lost the first set 6:2. Derek is a great reader of his opponents’ game and he found the gaps with some fabulous volleys not just from the net but from near the baseline too. 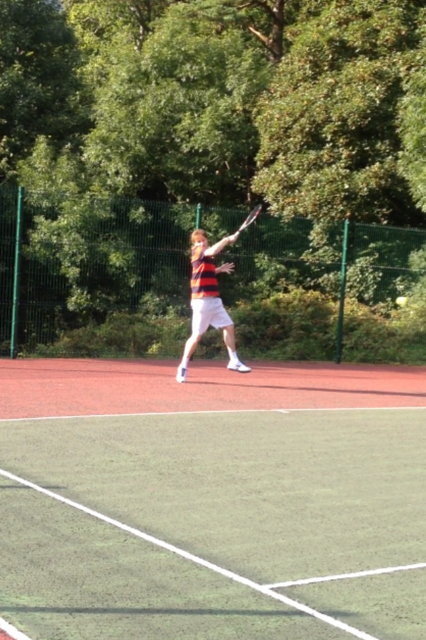 Eamon also played well, hitting strong slice serves and powerful forehands. They led 5:2 in the second before Gibby and Jamie came back to 5:4. Derek served for the set but was broken, 5:5. Gibby was then broken in turn, 6:5 and Eamon served it out to take it into the third set. The first game of the third set was the most important in the match. Eamon and Derek had had the momentum going into the third and they had two break points at 15:40 but Jamie, serving, held his nerve and served well especially on one break point on second serve. They had to face another break point but the deft touch of Gibby at the net and a wayward forehand return by Eamon meant they held serve and regained the momentum - 1:0 soon became 3:0 and, growing in confidence, they took the final set to love. an opportunity from trailing 3:0 to take it to 3:3 in the first set but he didn’t capitalise and 4:2 soon became 5:2, 5:3 and then the first set to Eamon. The second set was closer than the score line of 6:2 with all but two games being deuce games but Eamon deserved the victory for holding his nerve and taking an aggressive game to his opponent. the score line. Leo won 6:2, 6:2.
match points and Arghal secured victory on his final opportunity. 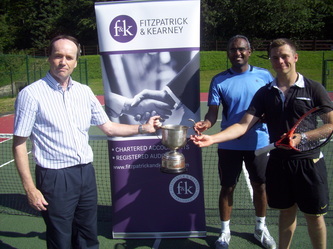 Jonathon Reynolds [left] and Patrick McMahon locked horns in the Singles Men Plate final. They hit solid ground shots from the start and the finalists of the main events would have been impressed with the pace and accuracy of the shots displayed in many of the rallies. It seemed only right that the first set should be settled by a tie-break. Patrick had had set points earlier in the set and Jonathon had defended well and on one occasion hit a terrific winner to save a set point. In the tie-break Patrick had set points again and eventually secured the set. Had he not the match could well have turned in Jonathon's direction. As it was Patrick grew in confidence and took more opportunities to come to the net. It was another thrilling match and a worthy one to finish the tournament with. Patrick triumphed 7:6, 6:3 but Jonathon will be a force to reckon with in future competitions. Please see the Draw sheets for the Singles tournaments. Players will be text re their first match time but please check the web-site for the times of future matches. Please contact the Tournament Referee if you have any queries - Chris 07889374005. The matches can be played over three sets or the third set could be played as a Championship tie-break i.e. the first to ten by two clear points. If there is no agreement on a third set or a tie-break players can toss a coin to decide. This should be done at the start of the match. We welcome teenagers and adults into our tournament so please behave in a considerate and respectful way on and off the court. Here's to a great week's tennis! 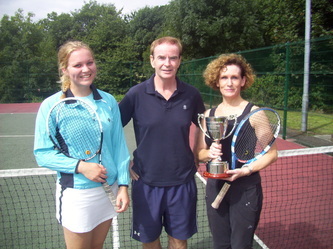 Megan Harty clinched the second final spot in the Ladies singles after a tough match against Philippa Reynolds. This was the only match of the sixty so far played to be marred by rain and they both became more conservative in their shots under the conditions. On two occasions Philippa was only two points away from taking the first set but losing the big points made all the difference. She knuckled down in the second and it was close too. Megan secured an early break but Philippa broke back to draw 5:5 but Megan broke back and held her serve to take the match 7:6, 7:5. Jonathon Reynolds played Gary Hanratty in the second plate semi-final. 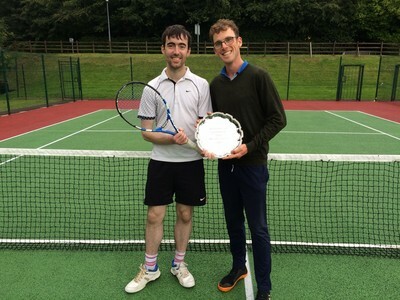 Gary played well but Jonathon rightly deserves the accolade of the most improved player this week and his strong forehand won him many points and helped secure a 6:3, 6:2 result. 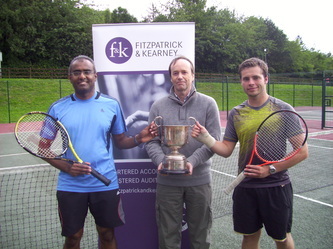 Patrick O’Kane and Chris Gibbons played in the second Kilbroney cup semi-final. Patrick is defending champion and he has all the shots. He has a technically superb forehand and backhand and his serve is strong. Almost every game was close and Chris was getting few free points on his serve. Patrick battled hard and won the first set 7:5. Chris battled back and took the second 6:4 and his ability to retrieve seemed to frustrate Patrick and a period of weakness in his own serve meant the final set went to Chris 6:1. 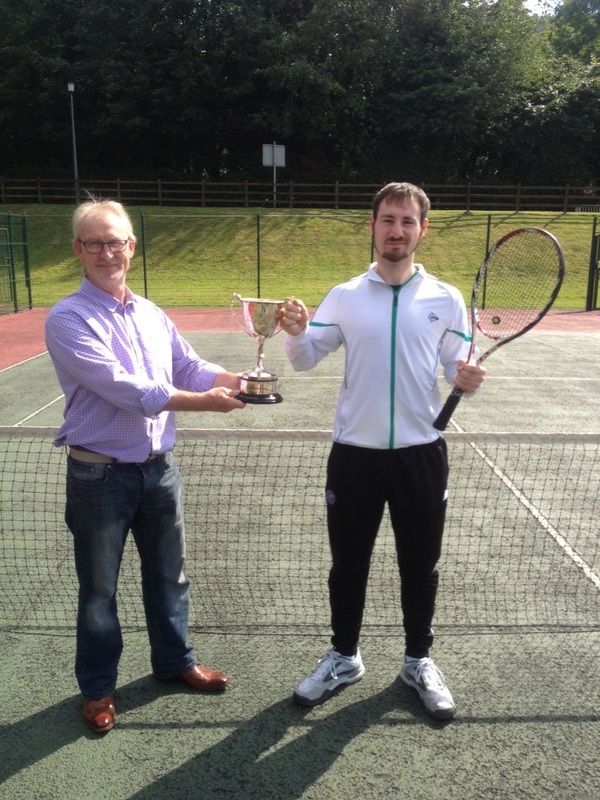 Tim Smith stamped his dominance on the tournament with a 6:0, 6:0 victory over Eoghan McMahon. Eoghan had several game opportunities that would have brought a score line that reflected the closeness of the rallies but Tim not only hits it hard from both sides, he is not only able to land the ball on a stamp, he is consistent! This will make the final all the more interesting. We’re coming to the business end of the week and all the matches today were far more even and there was little to separate the winners and the losers. Ryan and Patrick McMahon played their Plate semi-final and Ryan’s game was much sharper. He took the first set 6:4. Patrick battled the second to a tie-break and clinched the second. They played a championship tie-break which Ryan eventually took 11-6. Jonathon Reynolds had a very tough match against Brian O’Hare. Brain was hitting very heavy top spin shots that flew off the court. Unfortunately, for Brian he wasn’t varying his shots and Jonathon was getting the measure of his topspin. Jonathon took the match 6:3, 6:2 and he has shown a real talent and fighting spirit in his matches. In the Kilbroney Cup, Eamon Crawford had a tough match against Peter Madden. Peter hits the ball deep and low and often with lots of under-spin but Eamon has played tennis for a long time and he didn’t panic in the points lost as he made his adjustments. He won 6:4, 6:3. He is now in the final on Sunday. Chris Gibbons played Michael Sands in the other Cup match and his ‘never say die’ retrieving and solid serving, with an ace to finish saw him take it 6:4, 7:6 (7-2). 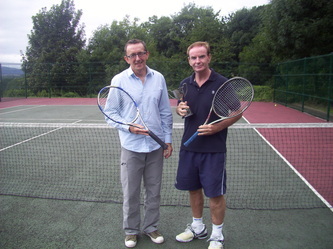 The duel of the day and of the tournament so far was the semi-final match between Patrick Clements and Arghal McMahon. Patrick hits the ball hard and with heavy top spin. His strength is toe-to-toe rallying from the baseline. This has got even stronger thanks to some coaching and to his single-minded determination to improve. For the same reasons his serve is now stronger but today his serving wasn’t as consistent and he was often relying on the second serve to get the rally going. But that aside he played valiantly. Arghal is showing the talent many predicted. He has a greater variation of shots than Patrick and he is the only other person in the competition who can match Patrick’s fitness. Arghal’s style means he plays using minimal energy and he gets his racket on almost every shot. Having more shots available to him, Arghal was able to dictate play in many rallies and it was a clear strategy at times to bring Patrick in and then to lob him or pass him. Some of the rallies were breath-taking and there were periods when they were both in the zone, producing the best tennis of their life. When it is like this it is a shame that there has to be a loser. remember the final rally. Patrick threw everything at Arghal. Against almost anyone else he hit what would have been five clean winners but Arghal somehow, I’m still not sure how, got his racket on the ball to stay in the rally and to eventually clinch the match. Arghal is in the final and Patrick knows he played exceptionally well, he didn’t lose it, Arghal had to win it. Today’s matches include the resumption of the Ladies semi-final between Megan Harty and Philippa Reynolds at 2pm; the plate semi-final between Jonathon Reynolds and Garry Hanratty at 4.30pm; the second semi-final between Tim Smith and Eoghan McMahon at 6pm and the second Kilbroney Cup semi-final between Chris Gibbons and Patrick O’Kane at 7.30pm. Tuesday saw a full schedule of matches. Tim Smith and Patrick Clements showed their superior class in convincing wins. Michael Sands was made to work hard to beat Brian O’Hare. Patrick O’Kane produced some quality shots to fend off Ryan McMahon and Eoghan McMahon and Manus O’Hagan produced the match of the evening. Eoghan hit the ground running and took the first set comfortably but Manus came back in the second with consistent and powerful serves and a series of successful volleys at the net. In the end Eoghan held his nerve to take the only break of serve in the second set leading 5:4 and this also meant he won the match 6:0, 6:4. 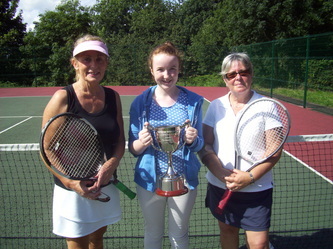 Wednesday saw two terrific ladies semi-final matches at 4pm. Emily Grant showed she is the one to watch in the future as she pushed Leo Reynolds to her limit, Leo just held on for a 6:3, 7:5 victory. Philippa Reynolds and Megan Harty had a titanic first set that had to be stopped at 6:5 to Philippa. That match will resume at 2pm on Friday. The top seeds, Arghal, Tim and Patrick made short shrift of their opponents. Joseph McCartney was playing Patrick and he hit some wonderful shots and often some clean winners but his inconsistency meant he was left frustrated. The match of the evening was between Patrick O’kane and Eoghan McMahon. Eoghan’s game is getting sharper and his confidence is growing. However, Patrick hit some strong ground shots. Both made errors with their volleys and that meant the match became more of a baseline contest. Eoghan showed his dominance in the first set, taking it 6:2, but Patrick replied in the second taking it 6:1. They opted for a championship tie-break and Eoghan showed his growing confidence on the big points and took a 9:4 lead and took match point with a strong volley to the corner. 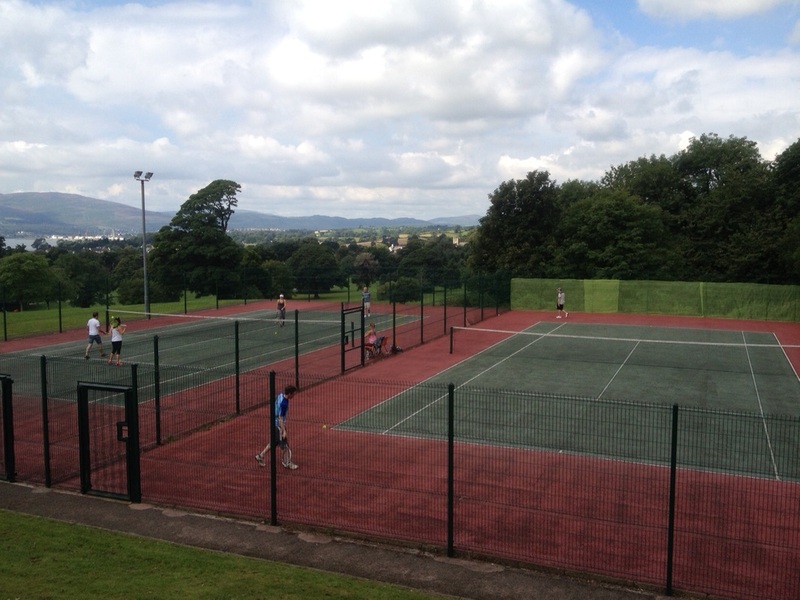 Today, Thursday sees plate matches and Kilbroney Cup matches and the first of two semi-finals. Eoghan will play Tim at 6pm on Friday and today at 3pm Patrick Clements looks to set the record straight against Arghal McMahon. This may well be the match of the tournament. Below are the matches for Thursday and Friday together with updated draw sheets. * A good time to be passing the court! The tournament kicked off on Sunday with some good singles play. The Reynolds - Leo and Philippa hit terrific forehands and deceptively powerful serves in their wins and Megan Harty and Emily Grant hit powerful shots that were technically superb. These semi-final matches will make for excellent viewing. The pick of the matches so far was probably Eamon Crawford’s valiant efforts to put dints into the seemingly impervious defences of Arghal McMahon. Arghal played sublime. Eamon hit some terrific wins but he was forced to try these too often and, sometimes, when trying to stay in the rally might have been a better move. Arghal was loose and focused and consistent. This doesn’t bode well for his opponents! The updated draw sheet with match times for Tuesday are below. A match not on the draw sheet is between Gary Smith and Garry Hanratty. They lock horns in the plate semi-final at 2.30pm today, Tuesday. 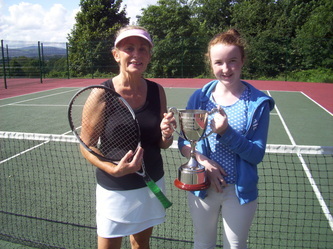 Sunday 4th August saw the final of three weeks of tournaments at Rostrevor Tennis Club. third thanks to some early breaks. The final result was 7:5, 2:6, 3:6. - it was a tough game and the Reynolds faced break points but managed to hold. regained the trophy they won two years ago. The final result - 6:2, 6:4. Result - Giby Vettiankel and Jamie Campbell 7:5, 6:3. 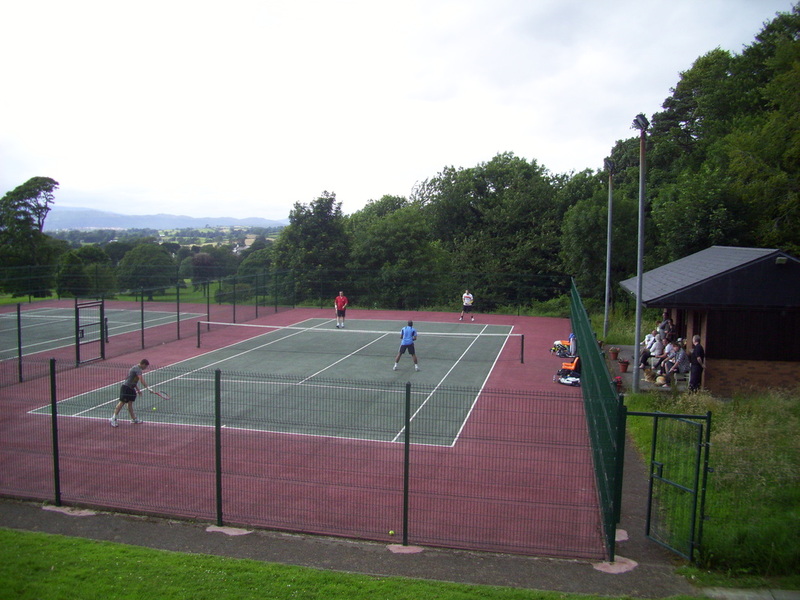 Please find attached details on the Doubles tournaments taking place in Rostrevor in July and August. 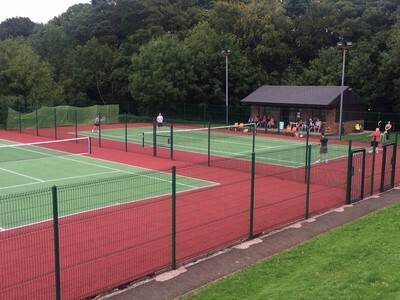 The Ladies' Doubles takes place from the 15th July - 21st July; the Men's Doubles from22nd July until 28th July and the Mixed Doubles from 29th July until 4th August. Contact details can be found on the attachment. If you are interested in taking part in the Singles Open beginning on 17th August please register your interest by texting Chris Gibbons on 07889374005. There will be a Women's and Men's Main event and Plate event and the Kilbroney Cup for those men who get passed the first round but [like Federer :-( ] don't make it passed the second round. There are several summer coaching schemes taking place in July and August in Rostrevor, Warrenpoint (Milltown); Newry and Kilkeel. Details on all can be seen on a leaflet on all sports summer schemes available from the reception desk at the caravan entrance gate, under the bridge, in the park. Alternatively you can call Kilkeel leisure centre for information on their programme, on 02841764666; information on all the others can be obtained by calling Newry and Mourne District council on 02830313264 or 02830313137. 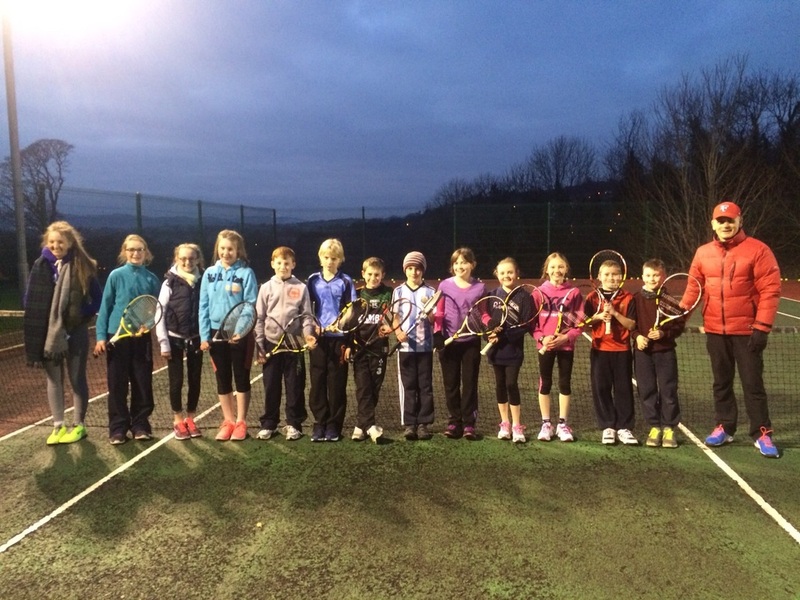 Jim Pringle is offering summer coaching to Rostrevor Tennis Club junior members. Please contact Jim on 00353894224224. Dates for 2013: July 22nd to 26th And July 29th to August 2nd. Times 9 to 11 & 11 to 1pm. Please contact Jane on 00447704466828. 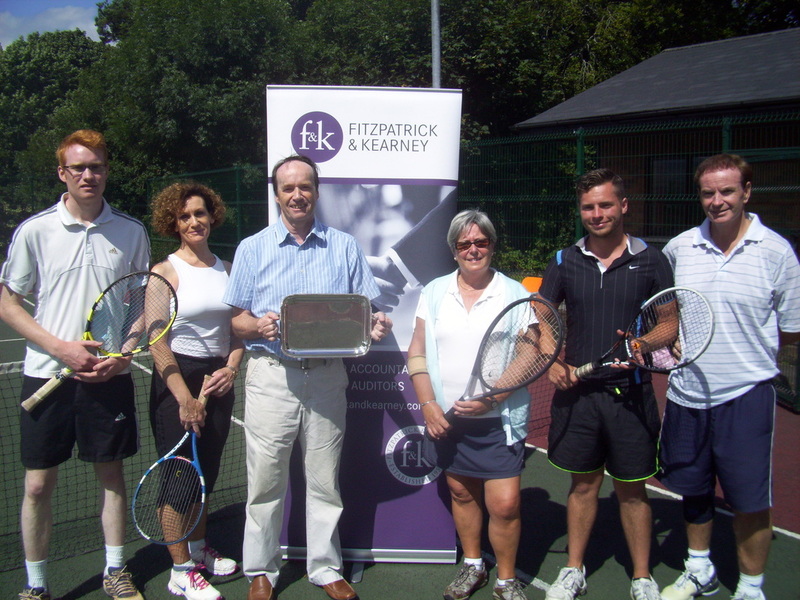 From Left to right, Patrick O'Kane in action in Kilbroney Cup, Finalists Mark Lynn and Patrick O'Kane with Chris Gibbons, Club Chairperson; Tom Harty, Chris Gibbons and Peter Madden in the Plate final; Winner Tom Harty with Chris Gibbons; June McEvoy, Naimh Crawford [sponsors] and Mary McGeown, Ladies final; June McEvoy with Naimh; Giby Vetiankal, Briege McMahon [sponsors] and Arghal McMahon, Men's final; Giby with Briege. 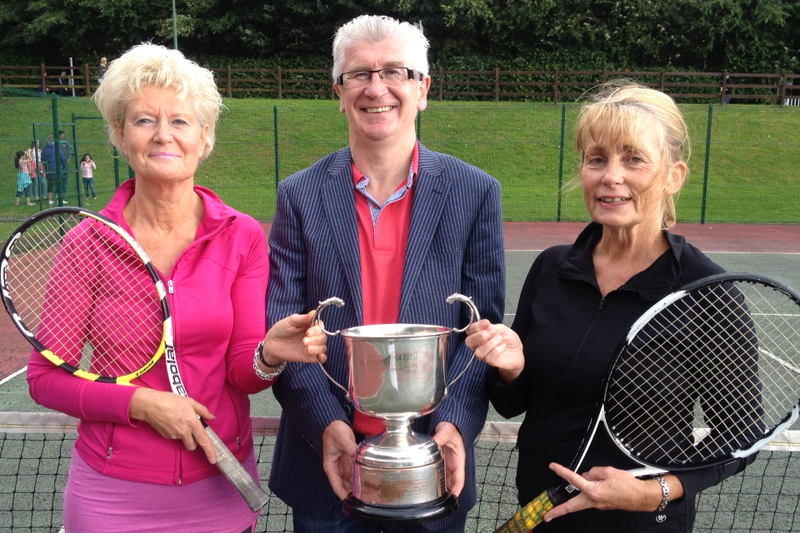 Close of play on Rostrevor's Singles events. 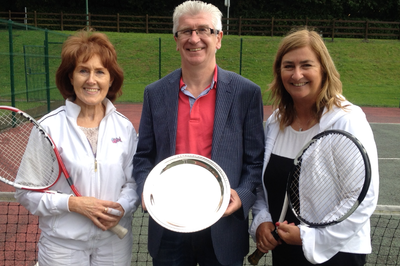 Sunday 26th August, Final’s day - saw June McEvoy and Mary McGeown in the Ladies’ final. They had a terrific match - June took the first set comfortably but Mary is an experienced player and she broke June early in the second and had game points to take a three love lead but June battled hard and broke back and she held on to a 6:0, 6:3 victory. 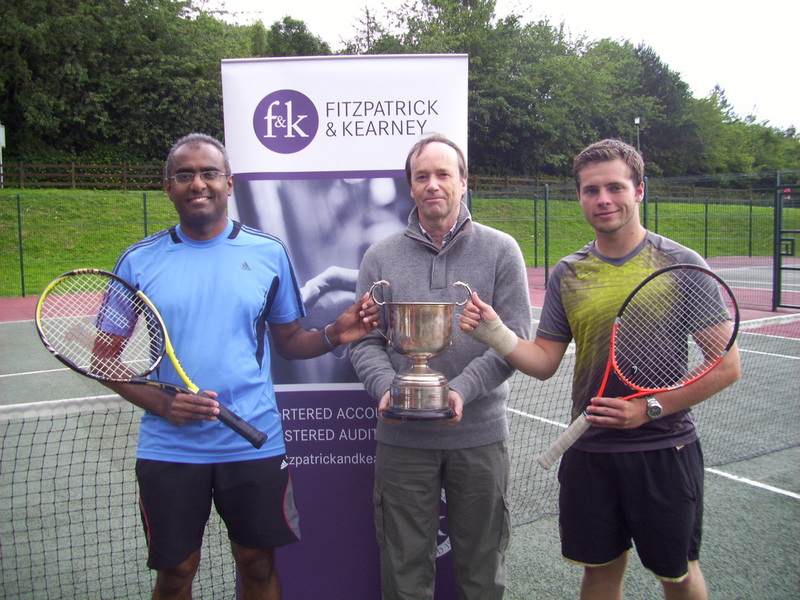 In the Kilbroney Cup Mark Lynn took on Patrick O’kane. Both had beaten tough opponents to get to the final and it was a very close match. Patrick’s fitness and all round shot-making ability neutralised Mark’s powerful forehand. Patrick won 6:3, 6:3. 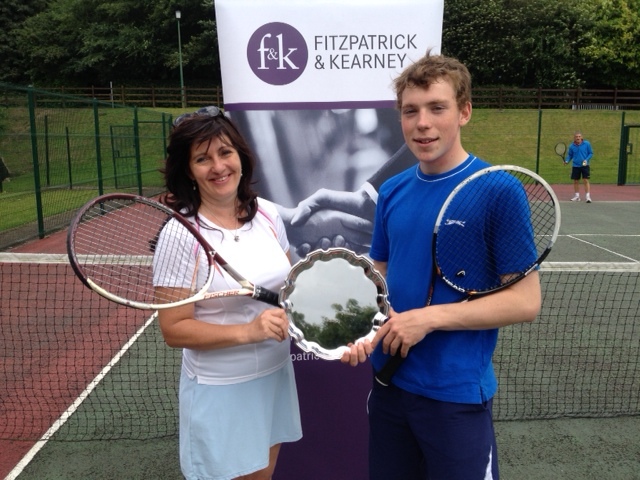 Tom Harty pulled off a terrific victory against Peter Madden in the Plate final. Pete played well but Tom has an impressive array of shots to call on and if he maintains his tennis he will be challenging for the main event in a year or two. 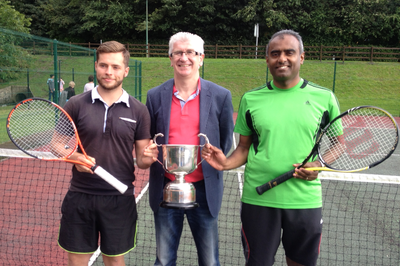 Arghal McMahon had taken two huge scalps in Tim Smith and Patrick Clements on his way to the final. Giby had faced a tough match against Dundalk’s Seamus Haughey but had a more comfortable defeat over Gary McLoughlin. This was Arghal’s first main event final and the nerves seemed to be a factor in the first set and Giby took it to love. In the second Arghal broke Giby’s opening serve and a new player emerged. His court coverage was better than Giby’s and he was able to control much of the rally and tactically he was outwitting his opponent. He went on to break Giby two more times but Giby doggedly held on to break back, even twice defending two break points that would have left him trailing 2:5 if he hadn’t. Had Arghal converted one of those points he may well have taken the second set and the third may have gone his way too, but Giby held on and won 6:0, 6:4. He now holds the Mixed Doubles; Men’s Doubles and Men’s Singles titles in Rostrevor! 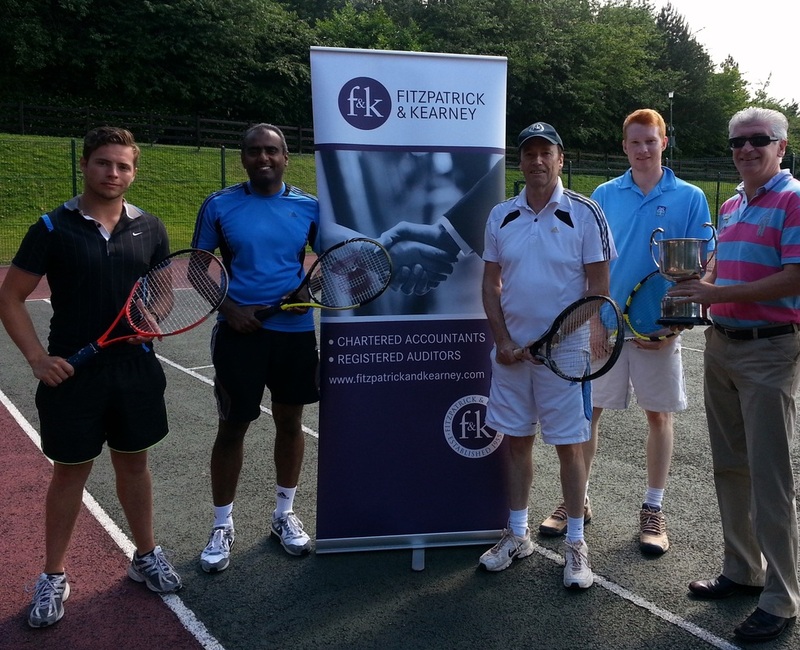 On Wednesday evening the tennis devotees stood agog as Tim Smith was beaten by an in-form Arghal McMahon. Last night those who thought Arghal would be stopped in his tracks by the consistency and strength of Patrick Clement’s ground shots were left asking could young Arghal go all the way? He stood confident at 5:4 in the first with Patrick serving to take it to 5:5. He had a plan and it was to hit four winners from each serve and he did just that! He’d taken the first set 6:4 and needed just one break of serve to take the second 6:3. On-lookers rated Patrick’s tennis the best it had been in the tournament but he admits he doesn’t like the courts when they get wet but this didn’t seem to worry Arghal, whose movement and ball striking just got better. The question then is - can the young maestro complete the week and put both hands on the trophy? Today Giby plays Gary at 3pm in the other semi. This will make for an equally gripping match but whoever it is that faces young Arghal tomorrow he will need to bring his very best tennis. 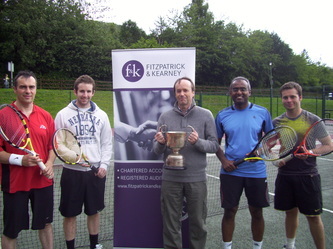 Rostrevor Mens' Singles Kilbroney cup 25.8.12. 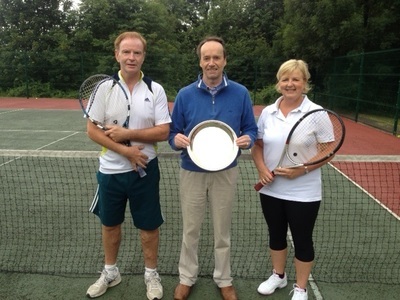 Rostrevor Mens' Singles Plate 23.8.12. The 22nd July marked the Men’s Double final at Rostrevor Tennis Club - the final event following three weeks of tournaments. 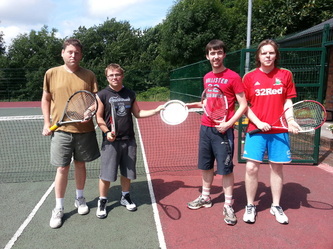 In the Plate Final were Gary Smith and Gary Hadrad taking on Richard Flood and Stanilaus. Whilst the two Garys may not have had the youth and fitness of their opponents they had experience on their side and knew the importance of keeping the error count down. Richard and Stan would produce some fine shots but inconsistency and frustration replaced the tactical play needed to compete. Gary and Gary proved victors 6:0, 6:1. 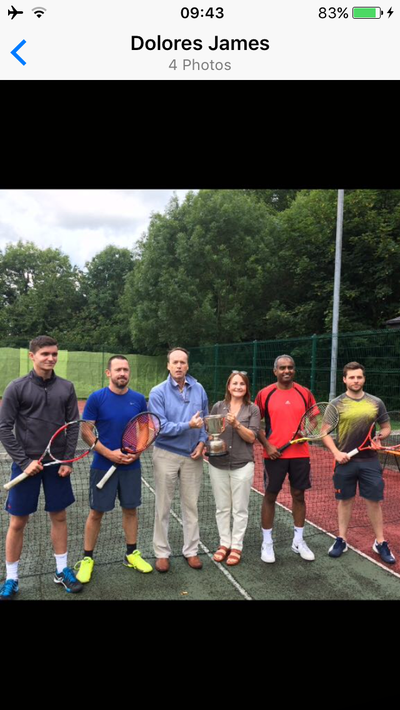 From left to right - Plate finalists Gary Smith and Gary Hadrad with Sponsors Richard Flood and their opponents Richard Flood (Junior) and Stanilaus; victors Gary and Gary with sponsors; Jamie Campbell and Giby Vettiankal and their opponents Gary McLaughlin and Patrick Clements, main event finalists. The Main Event Final with fans and family nervously watching! The Main event final was between defending champions Giby Vettiankal and Jamie Campbell against Gary McLaughlin and Patrick Clements; Gary and Patrick having knocked out two times champions Tim Smith and Lee Ryan in a terrific three set tussle the day before. Giby and Jamie seemed to be on cruise control taking the first set 6:1 but Patrick and Gary have a long pedigree of final appearances and victories as singles players and whilst this was their first appearance together in Doubles, they left the court after the first set and returned with a new game plan: While all four of the finalists are experienced players, Gary and Patrick were trying to pressure Jamie, the younger of their opponents, with ground shots and shots with pace when he was at the net. 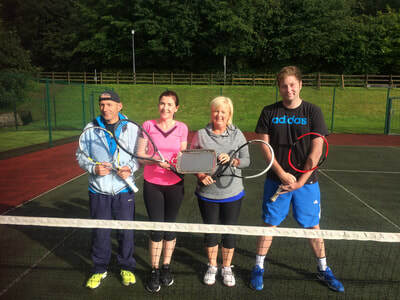 Jamie is a fine tennis player but he is only recently breaking through in this top level in South Down tennis and they wanted to see if would show any signs of nerves. For a time they seemed to have found a way back as Jamie’s error count rose under the pressure. Giby also seemed to tighten on some shots, perhaps feeling the pressure was on him to help out his partner and produce winners. Gary and Patrick took the second set 6:2. As singles players Gary and Patrick have strengths from the baseline but in Doubles whoever rules the net is king. 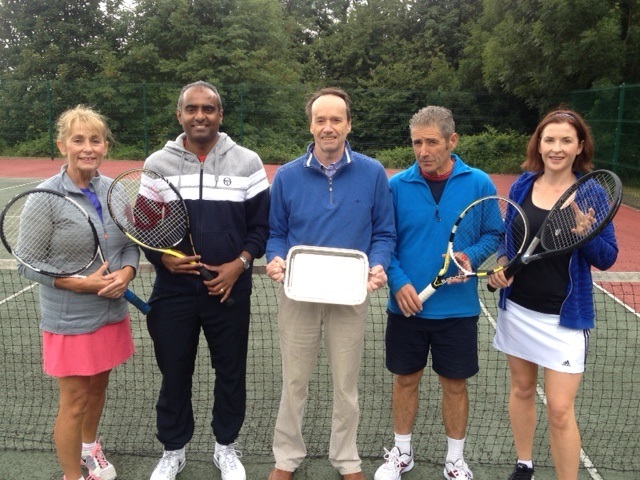 The connoisseurs of tennis on the sideline were doubting their game plan to stay back. Giby is renowned as an excellent volley player and at every opportunity he was looking to come to the net and the pressure put on Jamie in the second set was producing fewer errors from the maestro as he began to find his touch executing some excellent volleys. The match looked all but over as Giby and Jamie took a 5:1 lead in the third, but their opponents stepped up a gear and 5:1 became 5:2, then 5:3. They faced match points and saved the first but not the second. Giby and Jamie remain defending champions 6:1, 2:6, 6:3. The success of the three weeks would not have been possible without the support of our sponsors - the Flood family supported the plate events for all three tournaments and Fitzpatrick and Kearney sponsored the main events and that is now for the 25th consecutive year! Our thanks also to Irene McManus, Eamon Crawford and Sinead O’Reilly for their help in the background organisation needed to make these events possible. 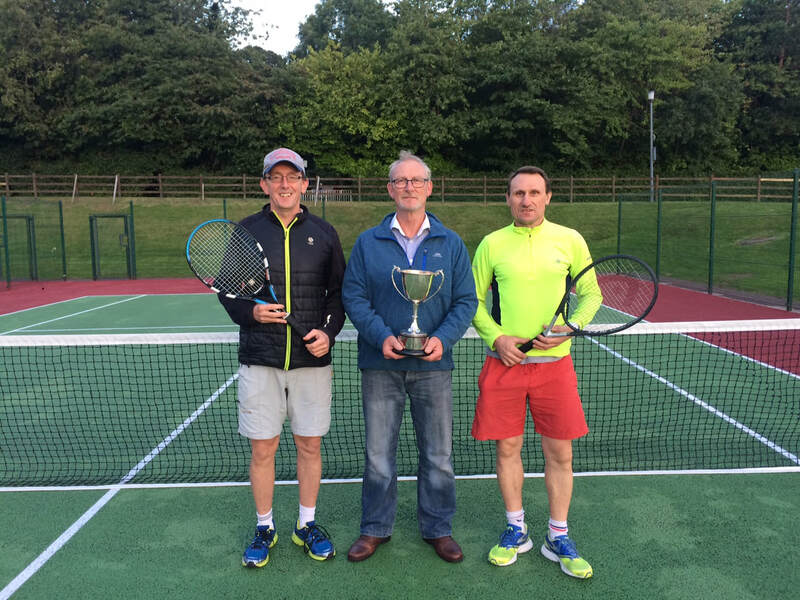 The respite from competitive tennis is, however, only brief with the Rostrevor Singles Tournament and Kilbroney Cup taking place from 18th - 26th August and entries are already mounting! 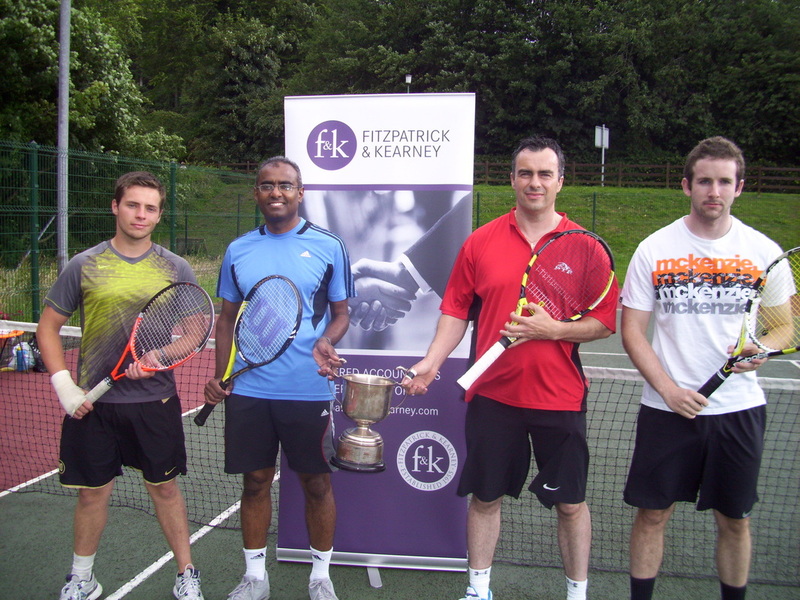 From left to right - Gary and Patrick with Giby and Jamie with Mark Reynolds (centre) on behalf of our sponsors Fitzpatrick and Kearney; Victors and still defending champions Giby and Jamie receiving their cup from Mark. As well as the men and womens single main event and plate events we'll also be running the Kilbroney Cup for any men who make it passed the first round [and are therefore ineligible for the plate]. 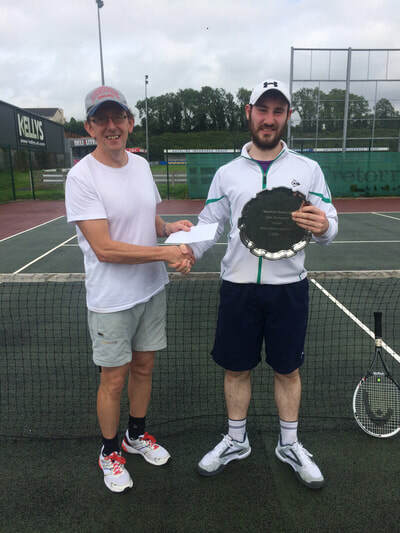 With just two courts and running both men's and women's events, along with the plate and the Kilbroney Cup it means we're only able to take a limited entry on a first come first served basis so please make contact as soon as possible if interested. The finals are scheduled for Sunday 26th August. The committee will endeavour to get all sections played within the time-frame set out above. It follows that participants may be requested to forfeit when they cannot accommodate any of a maximum of two match dates agreed to by their opponents. On this matter, should it arise, the committee’s decision is final. 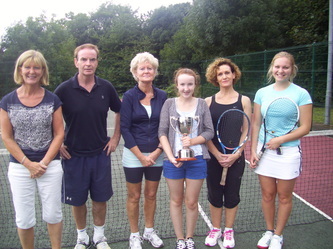 Ladies Doubles 7.7.12. to 15.7.12. Mixed Draw 30.6.12 to 8.7.12. We are now taking entries for the 2012 Rostrevor Open. Contact details for each event are enclosed in the attachment. 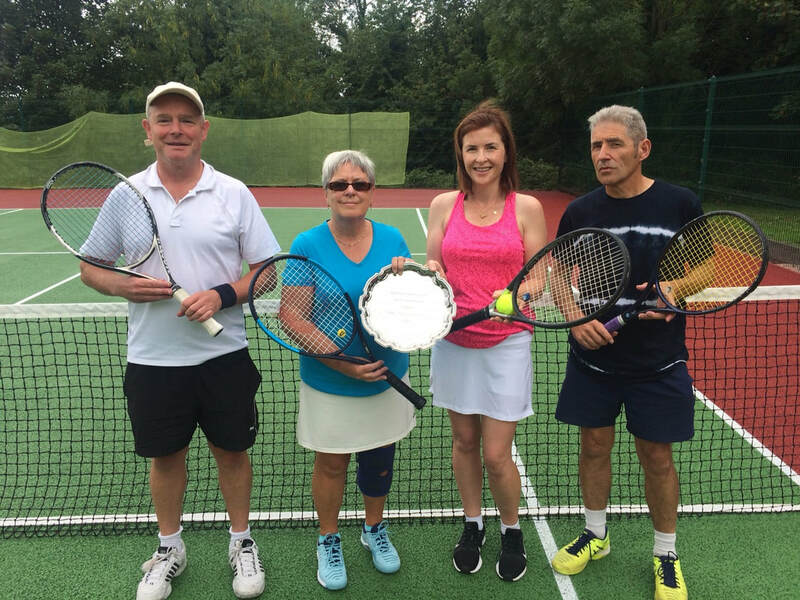 The Mixed Doubles runs from SAT 30th JUNE - SUN 8th JULY; the Ladies' Doubles from MON 9th JULY ­– SUN 15th JULY; the Men's Doubles from MON 16th JULY – SUN 22nd JULY. Going left to right - Plate finalists, Breige McMahon and Megan McGuigan with sponsors Eamon Crawford; Plate finalists Tony Kinsella and Chris Gibbons; Chris and Tony with Arghal McMahon representing the sponsors, the McMahon family; Ladies main event, June McEvoy and Megan Harty; June and Megan with sponsor Eamon Crawford; Patrick Clements and Tim Smith with sponsors Breige McMahon; Patrick and Tim. 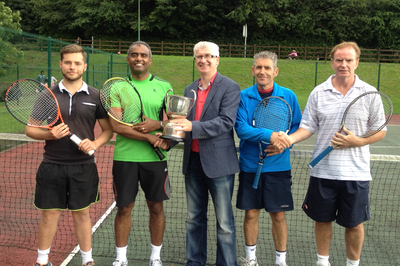 Sunday 21st August saw the singles finals for another year. 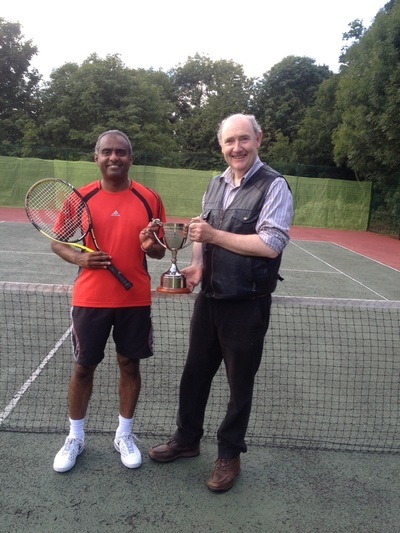 The weather was great and the tennis lived up to the high standard of last year’s event. 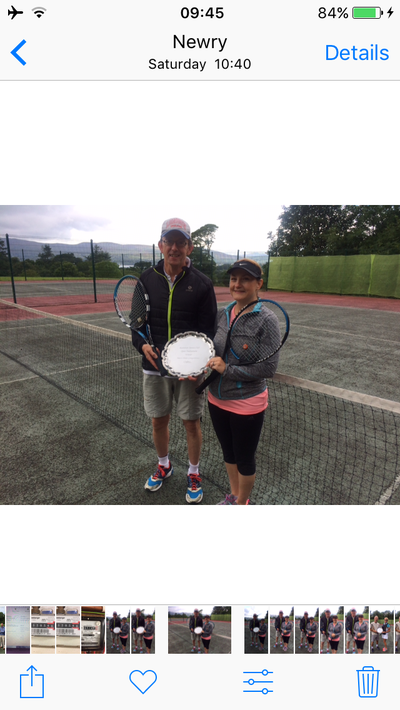 Megan Harty took on defending champion, June McEvoy at 1pm with the Ladies Plate taking place between Breige McMahon and Megan McGuigan. In the Plate Megan offered a wonderful display of forehand and backhand shots. Breige almost matching her and trying to find the open spaces in the court but Megan finally prevailed 6:2, 6:4. In the Ladies main event Megan Harty had game points for the first three games but the experience of June McEvoy meant the error count was going the wrong way for Megan who displayed some fabulous ground strokes and the defending champion had to retain her composure against her younger opponent’s pace. This she did prevailing 6:1, 6:2. 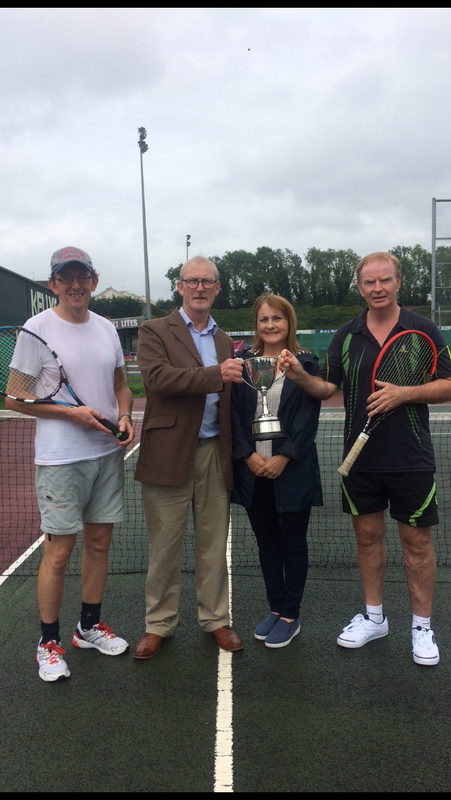 The Club have introduced a new Trophy this year – the Kilbroney Cup for the Mens’ singles – those eligible to play are those who get past the first round but who don’t make the final. 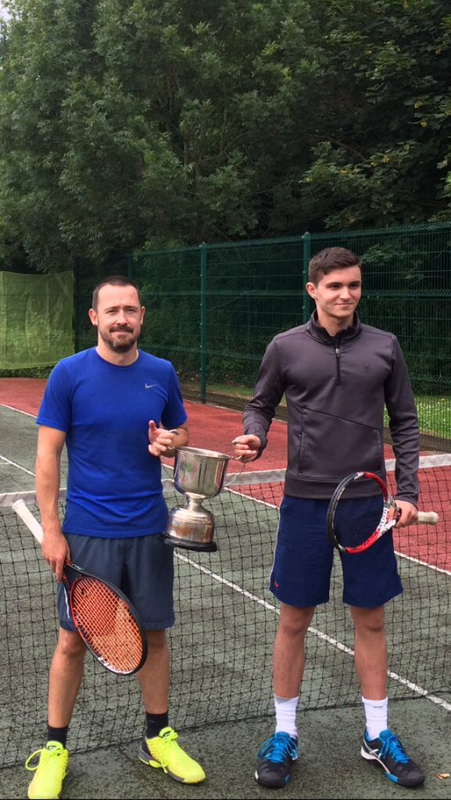 Given the logistics of running the event this year and with only two courts the decision was made to invite the two losing semi-finalists – Arghal McMahon and Ryan O’Hare - to play for the Cup. It was a thrilling three set match which saw Arghal take victory. Below are the results from our recent Doubles events. 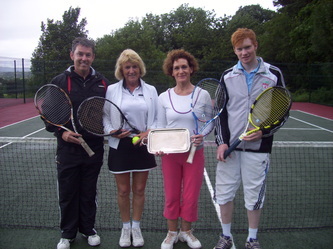 Ladies Doubles and Men's Doubles Final. Running clockwise: Ladies finalists, Dorothy Blair and June McEvoy and Tricia White and Bell O Loughlin; Winners Dorothy and June; Ladies Plate finalists, Briege McMahon and Emma Flood, and Breege Crawford and Grainne Delahunt; Plate winners; Plate runners up; Men's Doubles finalists, Jamie Campbell and Gibby Vettiankel and Tim Smith and Lee Ryan; Winners receiving their trophy from Mark Reynolds, Director, Fitzpatrick and Kearney sponsors; Mark with runners-up; Plate winners Arghal and Eoghan McMahon, trophy presented by Emma Flood on behalf of the Flood family, sponsors of the Plate events. What a difference a week makes. 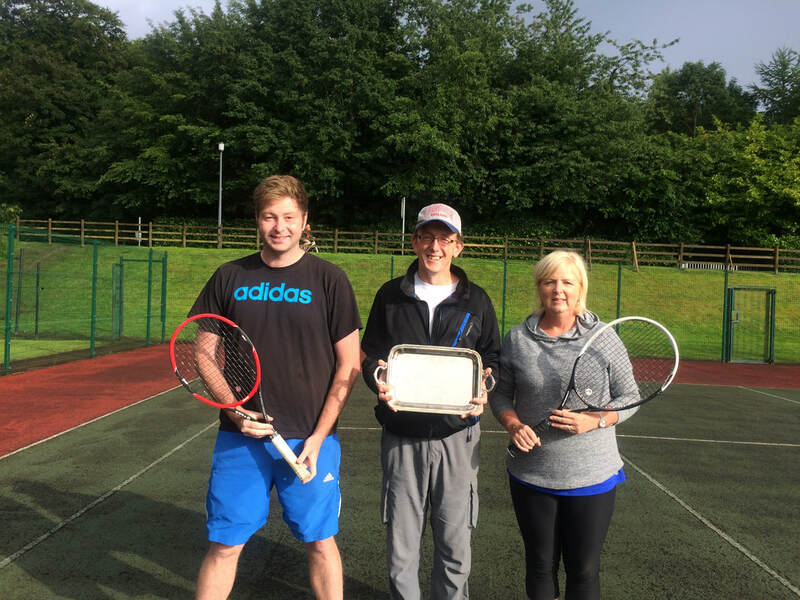 Rostrevor Tennis Club held the finals of their women’s and men’s doubles tournament last Sunday after the women’s had been postponed the previous weekend due to wet and windy conditions. This time it was a scorcher. emerge victorious with a 6-3, 7-5 win. Club chairman, Chris Gibbons along with Mark Reynolds, of Fitzpatrick and Kearney Accountants, (sponsors of 24 years), presented the Cup to the delighted winners June and Dorothy. Emma Flood presented the Plate sponsored by the Flood family to the equally delighted Plate winners Grainne and Breige. 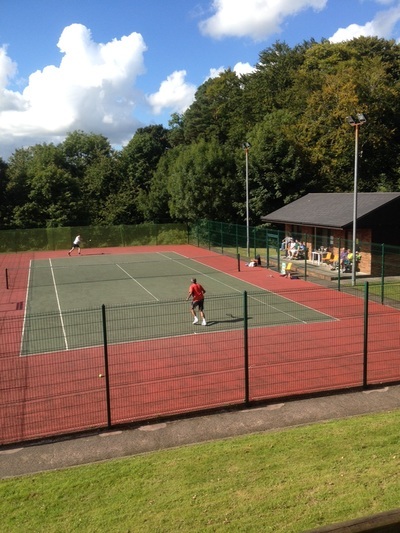 While the ladies escaped the relentless heat for a well-deserved cup of tea and bite to eat in the club house, the men warmed up for their matches. Jamie Cambell and Gibby Vettiankel made it through to the final when Eamonn Crawford and Derek Laverty were forced to retire in the early stages of their semi-final after Eamonn suffered an unfortunate calf injury that left him moping around the clubhouse on crutches regaling his tale of woe to all. This reporter even overheard someone telling him how he had received the exact same injury, in the same manner, on the same court!! More strange forces at work? (Hope you recover soon Eamonn). Jamie and Gibby however, were determined to prove their worth and they did so in spades when they came out on fire taking the first three games handily against two-time defending champions Tim Smith and Lee Ryan. Jamie and Gibby worked well as doubles partners, absorbing the relentless power of Tim and Lee’s game and playing some terrific tennis. They won the set 6-4. The second set was more of the same. Tim and Lee were clearly rattled and they seemed to be affected by the heat more than their opponents, (both literally and metaphorically). Jamie and Gibby won the second set 6-3. The final score being, 6-4, 6-3. Afterwards Lee commended their opponent’s performance saying “Gibby was great at the net” he also seemed unhappy with his own play saying he didn’t serve or play that well. 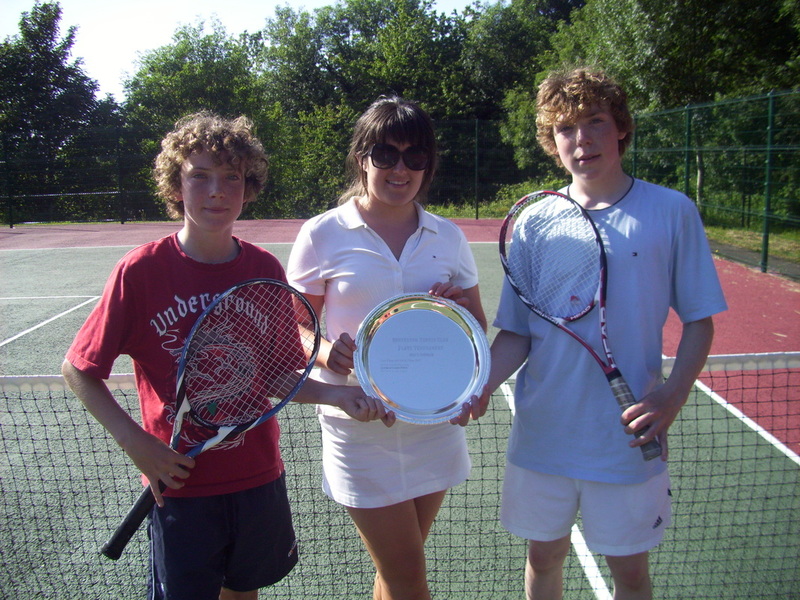 Jamie and Gibby had high praise for each other Jamie saying, “Gibby is the best doubles player in the area”. held on and won the match 6-4, 7-6(7-3). 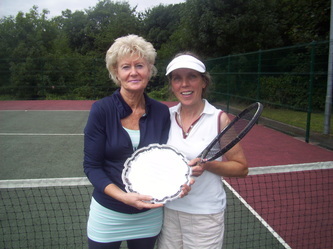 Emma Flood presented the plate to the tired, but happy pair. 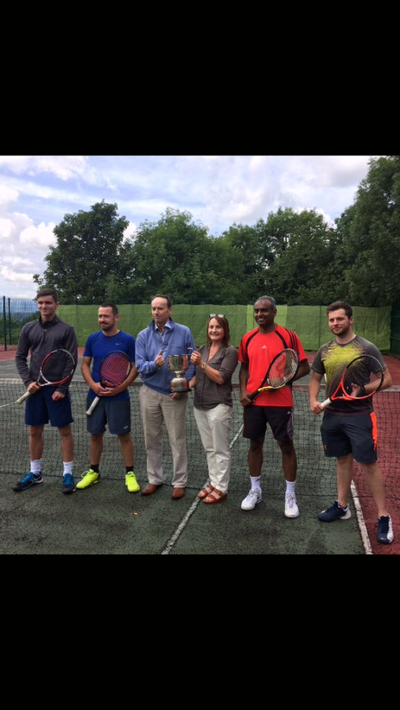 Many thanks to the organisers, sponsors and, of course, all the competitors, who took part in another successful tournament. Hopefully next year will see even more contenders try to get their hands on the elusive trophies. Mixed Doubles finals - running clockwise: defending champions, Alan McBride and Hazel Carter and opponents, Leo and Ben Reynolds; Plate finalists Frank McCormack and Irene McManus and Breege Crawford and Chris Monahon; the finalists of the main event receiving their trophy from sponsors Fitzpatrick and Kearney, and with Chris Gibbons, Club Chairperson; Chris presenting the Plate, on behalf of sponsors, the Flood family, to Breege and Chris; and a shot of all the Plate finalists. Today saw two thrilling matches. The first between defending champions Alan McBride and Hazel Carter against Leo and Ben Reynolds. 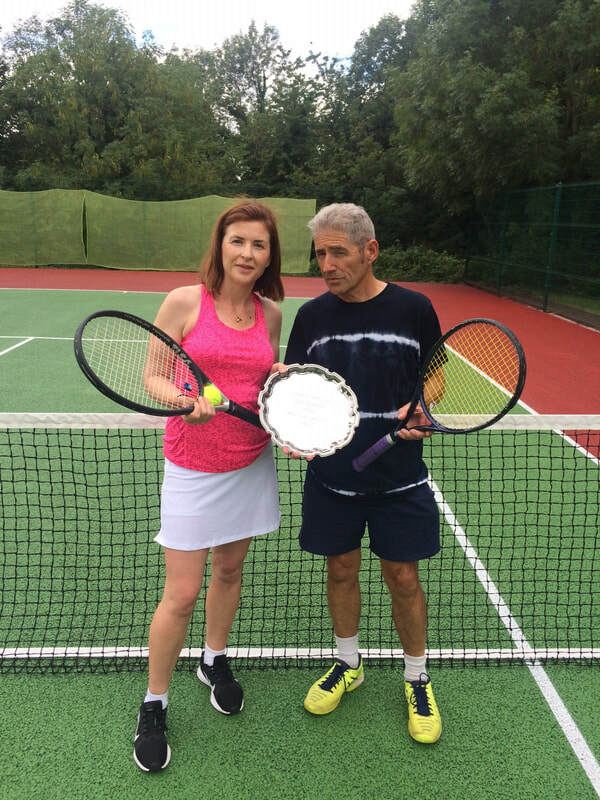 They were looking to make this year a hat-trick in defence of their Mixed Doubles title. Leo and Ben had other ideas and came out ‘on fire’ to take the first set 6:1. They ran ahead to a 4:2 lead in the second before Alan and Hazel began to claw back. The defending champions faced down two match points to go from 5:4 down to take it to 5:5, however the sharpness of their opponents meant they faced two more match points on Leo’s serve at 6:5. They held the first but the Reynolds duo finally clinched the match with their fourth match point. Aside from the Reynolds family, the many spectators were hoping for a third set but it was thrilling stuff from start to end. 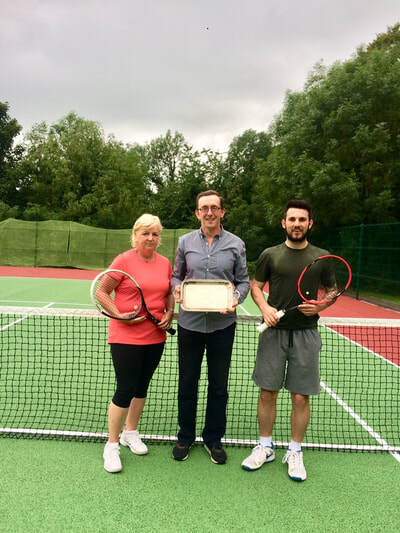 An equally entertaining Plate final match was taking place between Breege Crawford and nephew Chris Monahon against Frank McCormack and Irene McManus. Frank and Irene took the first set 6:3 but in the sometimes tight and tricky second set Breege and Chris prevailed 7:5. 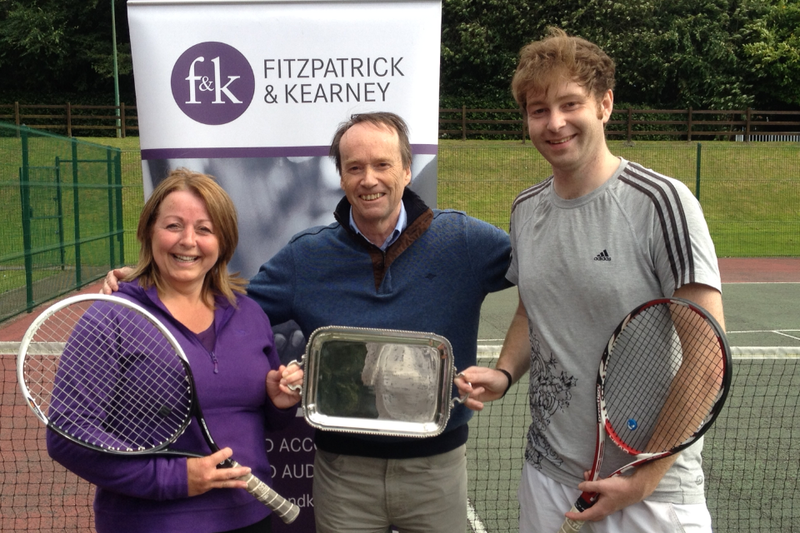 The third set was also close with Breege and Chris clinching the final set and match 7:5. The standard of the tennis in the semi-finals and finals matched the high quality and good sportsmanship that had been seen throughout the three weeks and today’s matches provided fabulous entertainment not just to family and friends but to what has been dubbed Rostrevor’s own ‘Henman Hill’ of spectators behind the courts in the park. There is a short respite now before the men and womens’singles tournament begins from 13th-21st August. This is a limited entry draw that is filling fast, so contact Chris, the organiser, below if interested. There will be a plate competition running concurrently. The finals of which are also to be played on Sunday 21 st August. The committee will endeavour to get all sections played within the timeframe set out above. It follows that participants may be requested to forfeit when they cannot accommodate any of a maximum of two match dates agreed to by their opponents. On this matter, should it arise, the committee’s decision is final.